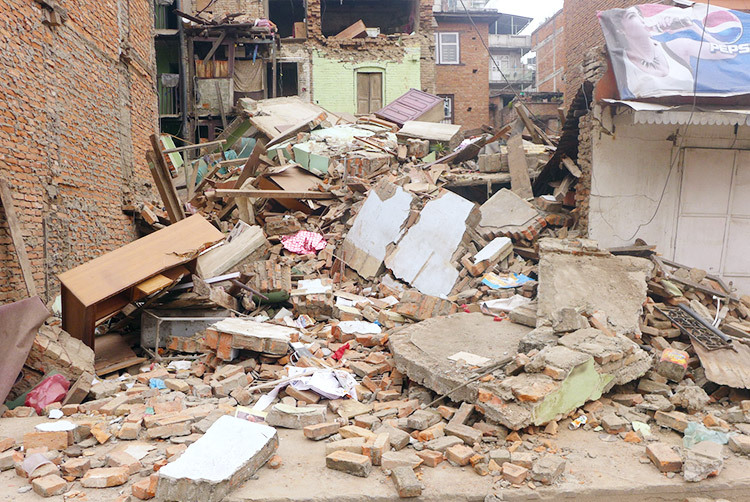 On April 25, 2015, a 7.8 magnitude earthquake struck central Nepal, killing over 8,000 people in four nations and leaving nearly 18,000 injured. Two weeks later, on May 12, a 7.3 magnitude aftershock hit, making this the nation’s most deadly disaster ever. 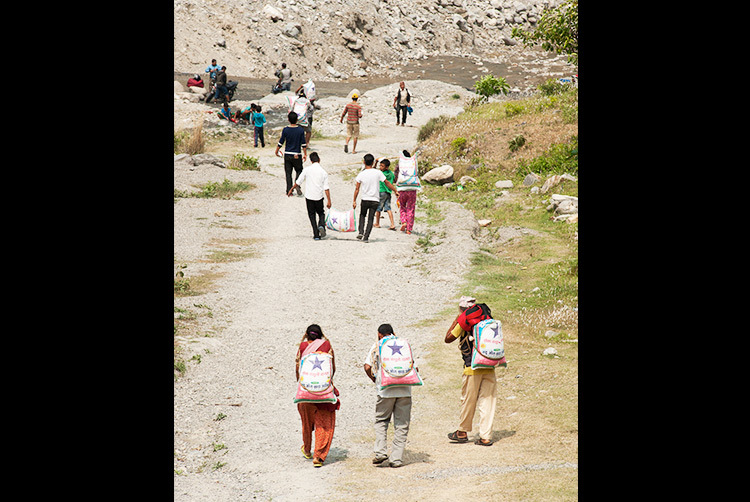 Gospel for Asia-supported workers were on the ground when the earthquakes hit, and they were able to provide aid immediately.  With a wide reach of 450 churches and 20 Bridge of Hope centers, we are in a unique position to provide aid where others cannot. 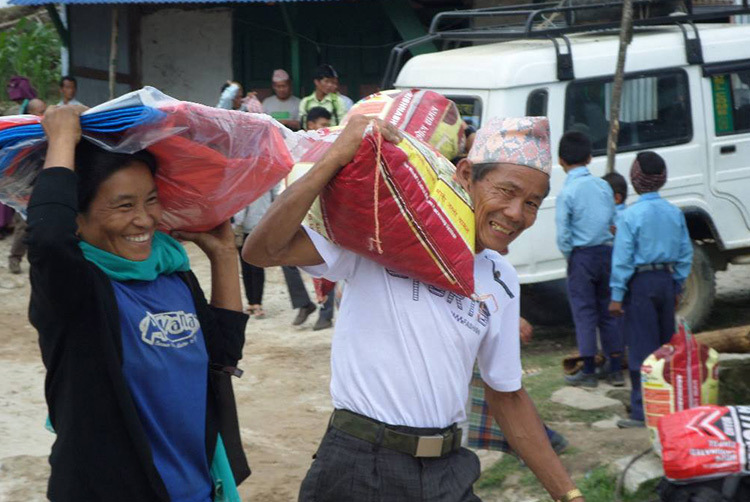 Read firsthand reports and see photos from those who are in Nepal, and read a timeline of the relief efforts as food and medical supplies are being provided. Please join us in this long-term effort as we help to provide for the needs of the millions affected. 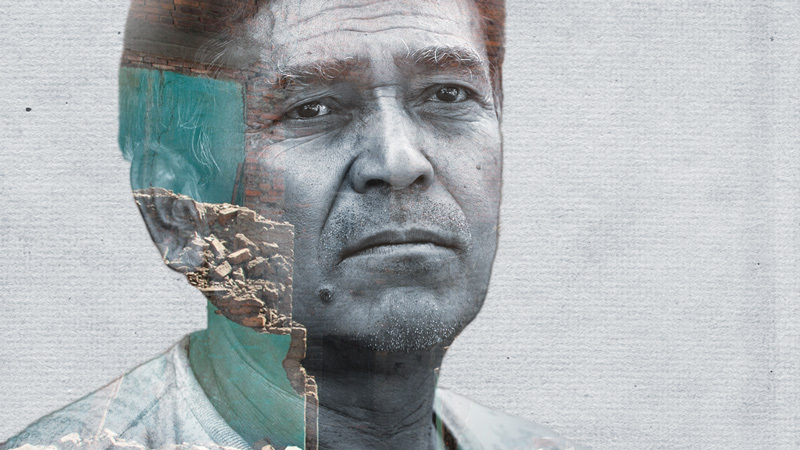 Ranajit Niraula, his wife and their four daughters survived the Nepal earthquakes in 2015. When the earth started shaking, Tarana’s husband rushed inside their home to look for their children, unaware that they were safe outside. 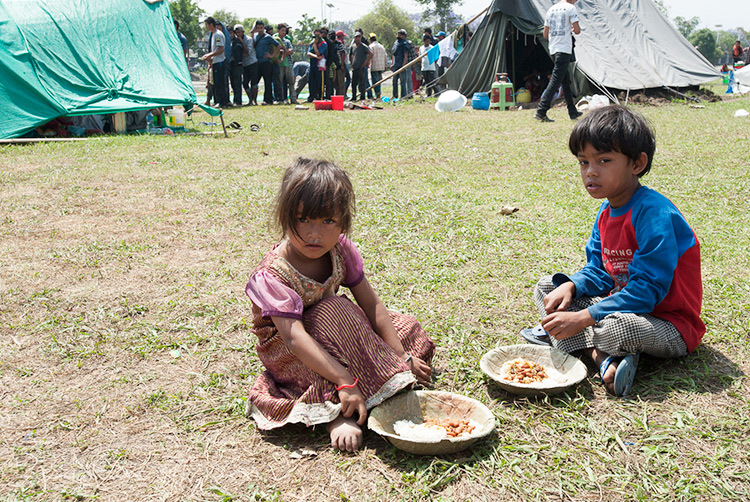 Thousands of children were affected by the major earthquakes that struck Nepal last year on April 25 and May 12. 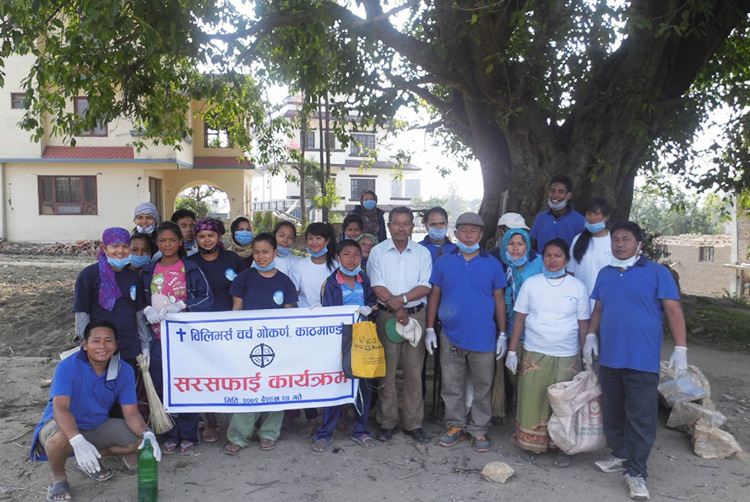 In March and April of 2016, some friends of Gospel for Asia visited Nepal and traveled to several regions that were badly affected by the earthquakes. 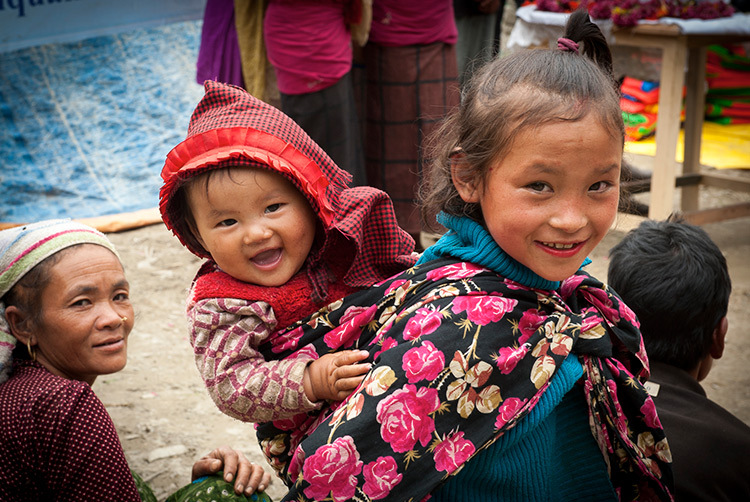 This 18-month-old girl, Shreya, was buried under rubble after one of the earthquakes. She remained trapped for 30 minutes before a neighbor rescued her. 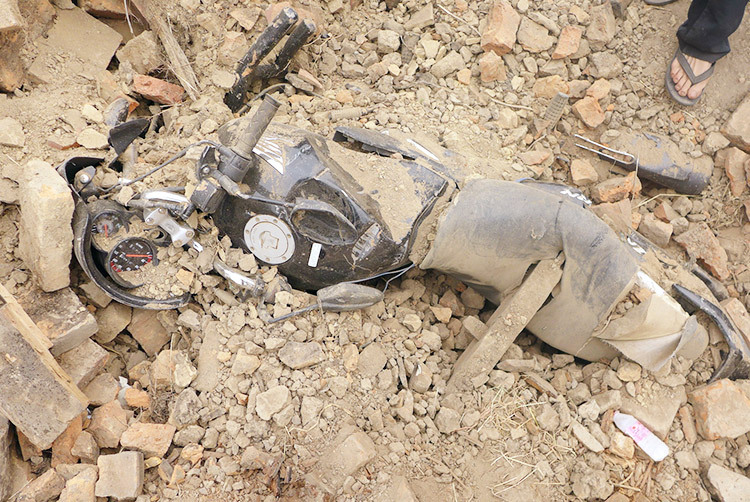 This 18-month-old girl, Shreya, was buried under rubble after one of the earthquakes. She remained trapped for 30 minutes before a neighbor rescued her. Thankfully, Shreya has gradually recovered. 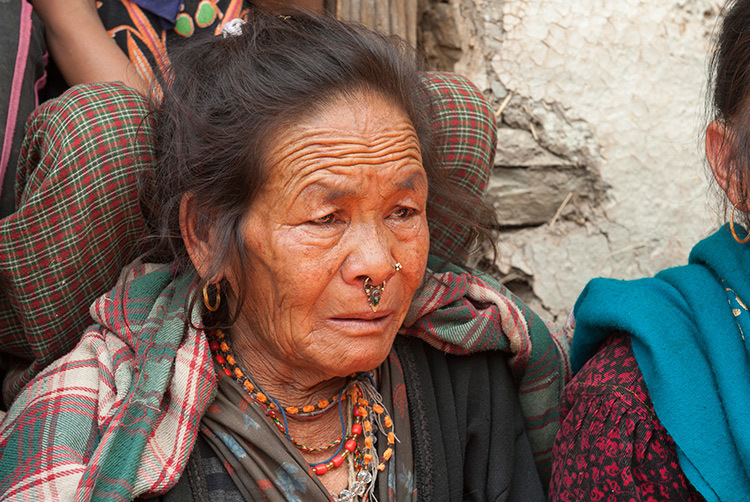 Gospel for Asia-supported Compassion Services teams are continuing to help meet the needs of communities in Nepal, where thousands remain homeless and have little access to food. 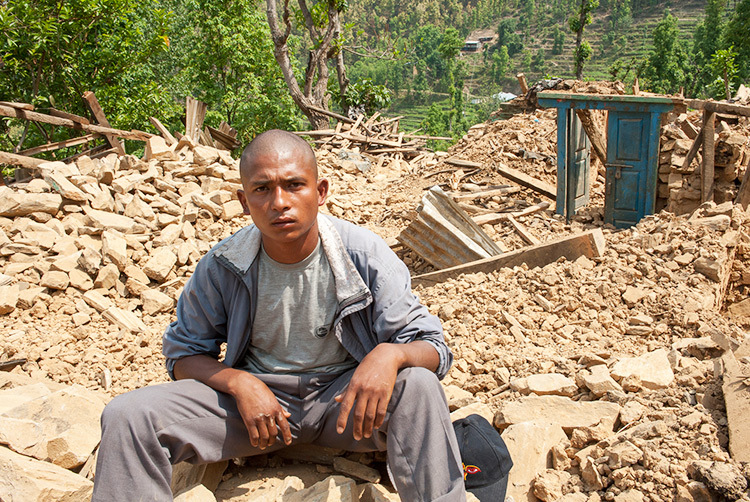 Dhruba is a young Nepali man who lost his mother—his only immediate family member—in the earthquake. 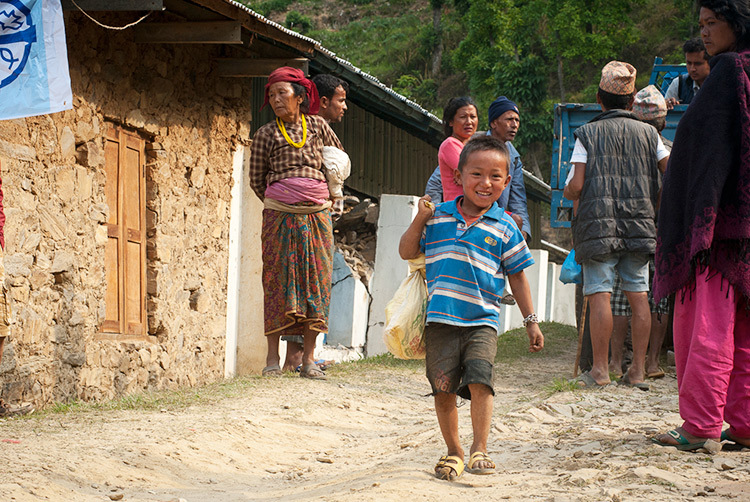 Although he’s now staying with relatives, Dhruba doesn’t know how to keep living. 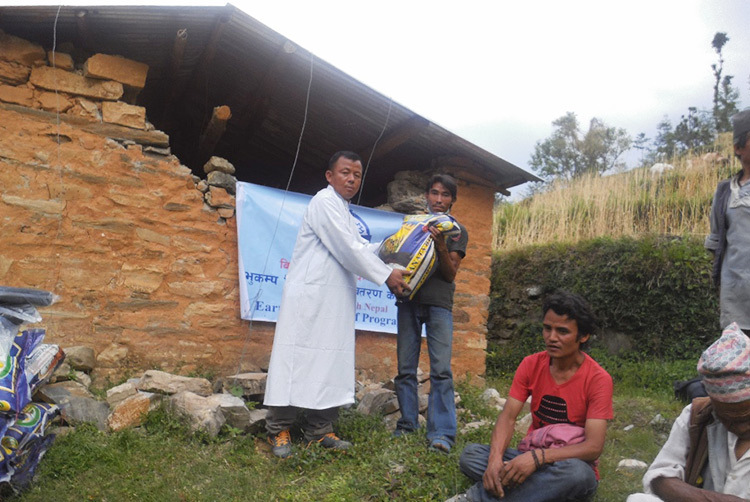 The relief team was able to support and encourage Dhruba with some practical supplies in June 2015. 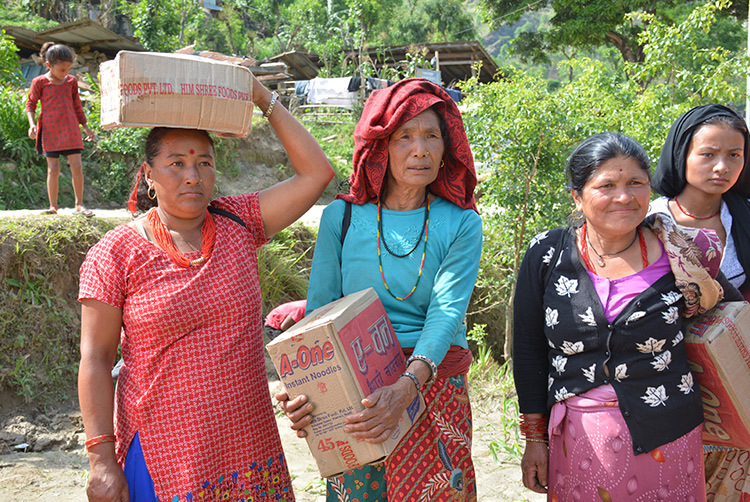 These women, who live in Nepal’s hard-hit Sindhupalchowk district, were among a crowd of 500 people who received staple food items, including rice, lentils, oil, tea and salt, from a GFA-supported relief team. 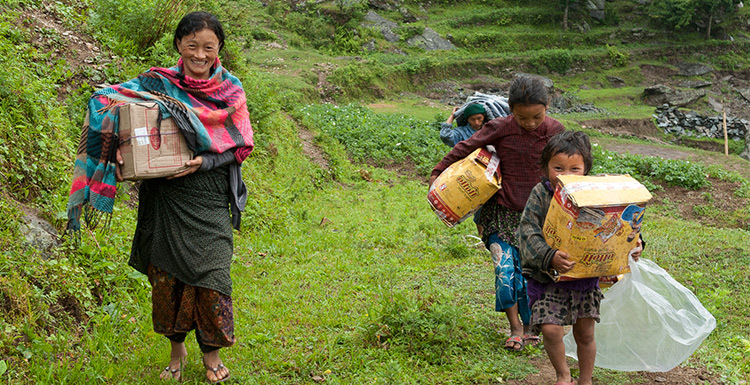 A woman carries a sack of rice on her trek home. 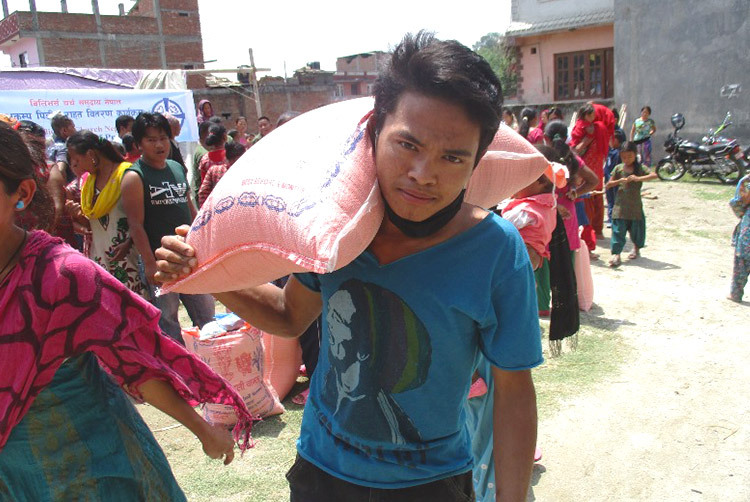 A young man in Sindhupalchowk observes the relief event. 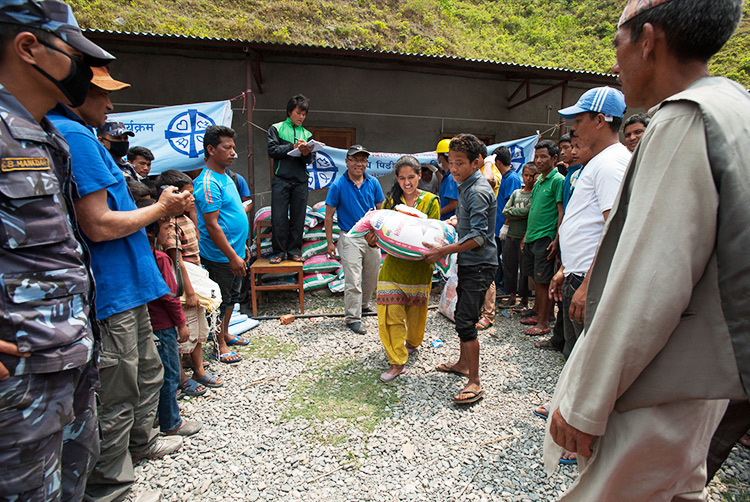 Next, the team brought relief to Dahachok, a village where more than 200 families live. 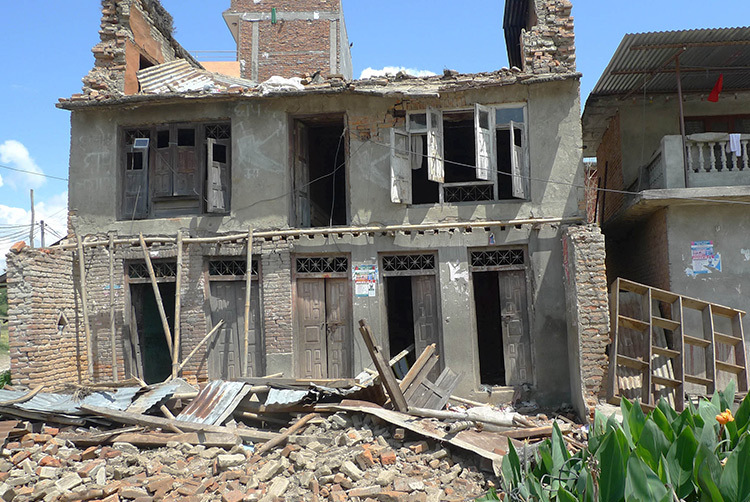 Almost every house in the village had collapsed in the earthquake, and those that hadn’t been destroyed were uninhabitable. The villagers had previously received some assistance, but their rations had run out. The Compassion Services team provided food supplies, toothpaste and toothbrushes. 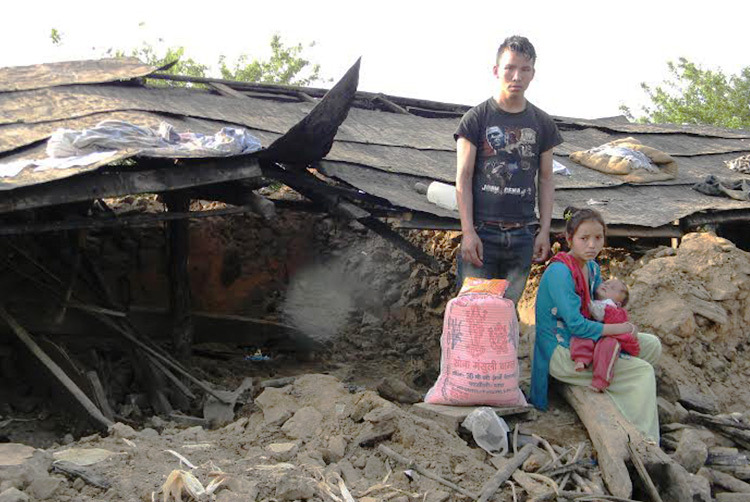 This man lost his son and daughter when his house collapsed. 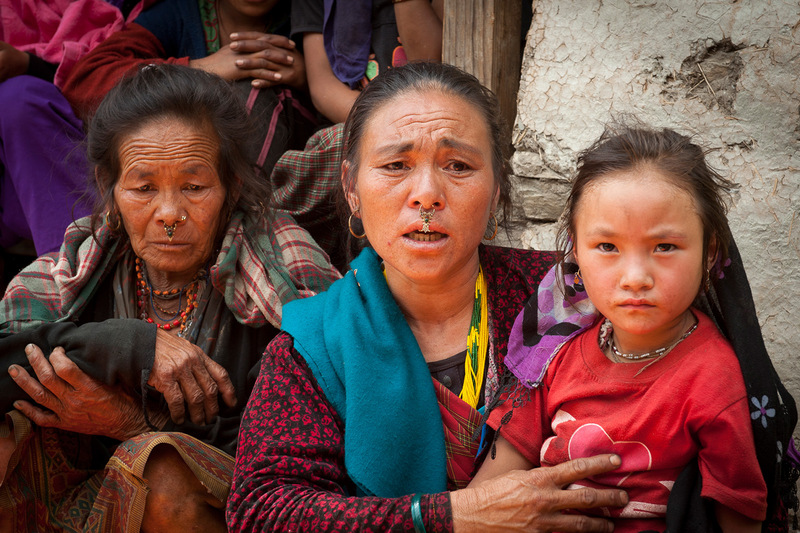 Children in this village traumatized after the earthquakes hit. 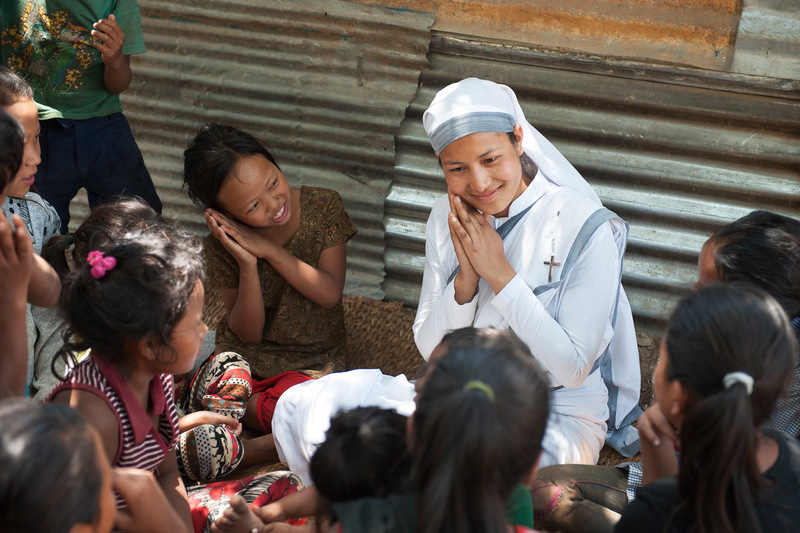 As part of a relief event, four Sisters of Compassion spent time showing love to the children. They told uplifting stories and played games with the children of Dahachock. 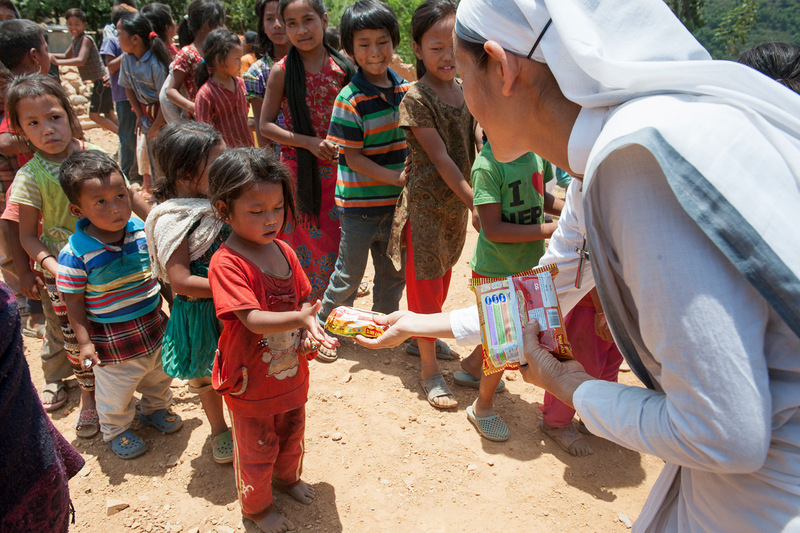 The Sisters of Compassion also distributed candy and noodles to the children. 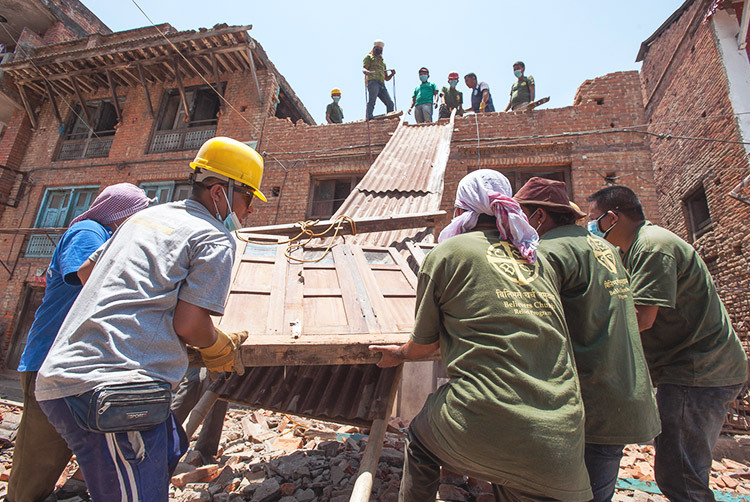 The rebuilding of Nepal is just beginning. 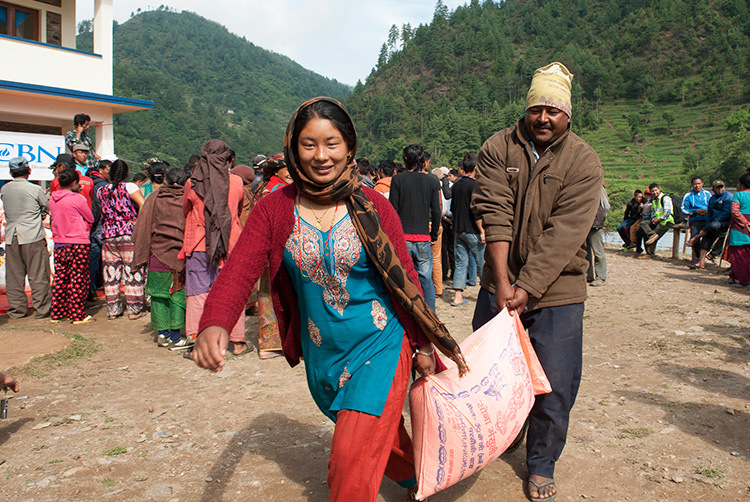 Gospel for Asia is staying in Nepal for the long haul, right alongside the millions affected by the earthquakes. Please continue to lift this nation up in your prayers! 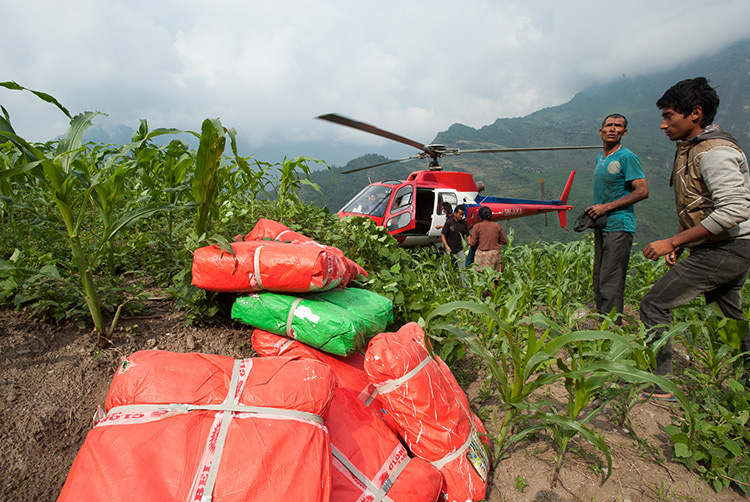 On May 18, 2015, GFA-supported relief teams travelled by helicopter to deliver 160 tarps to the remote village of Richet. 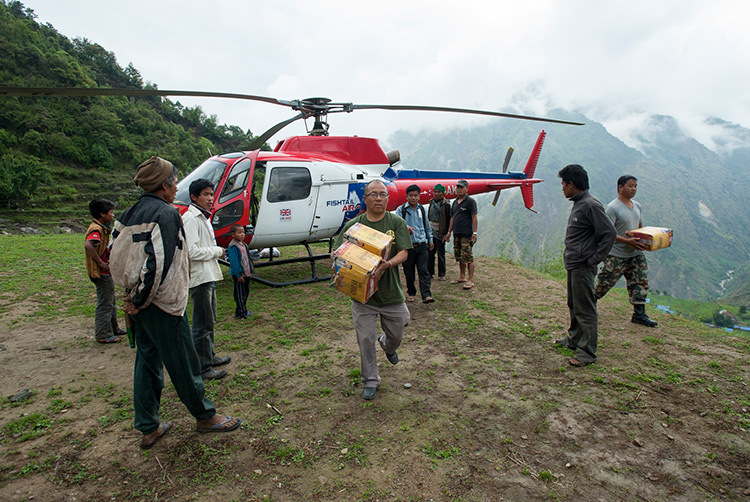 On May 18, 2015, Gospel for Asia-supported relief teams travelled by helicopter to deliver 160 tarps to the remote village of Richet, normally only reached by a three day journey on foot. 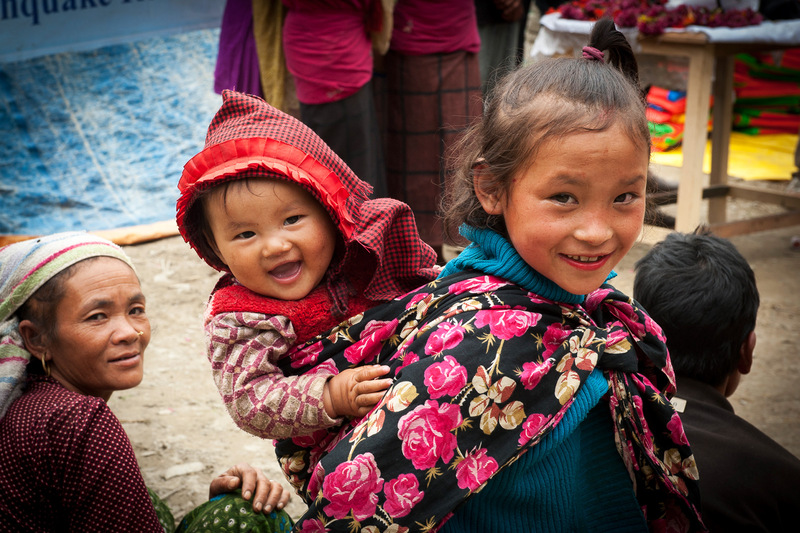 Beautiful village children who are still smiling. 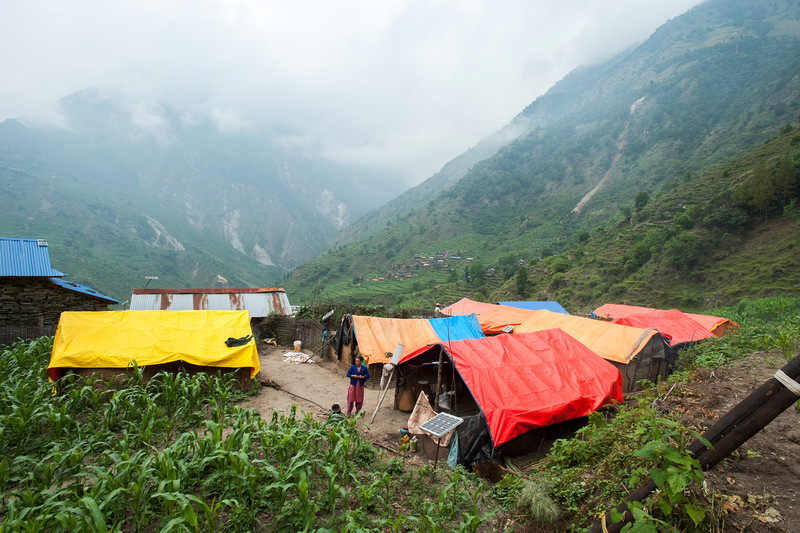 Monsoon rains and potential landslides are looming difficulties that lay ahead for the people of Nepal. 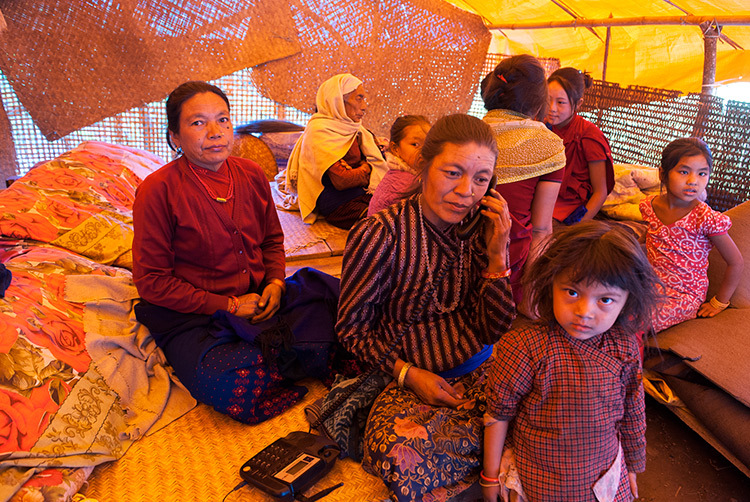 Families take shelter inside a tent. 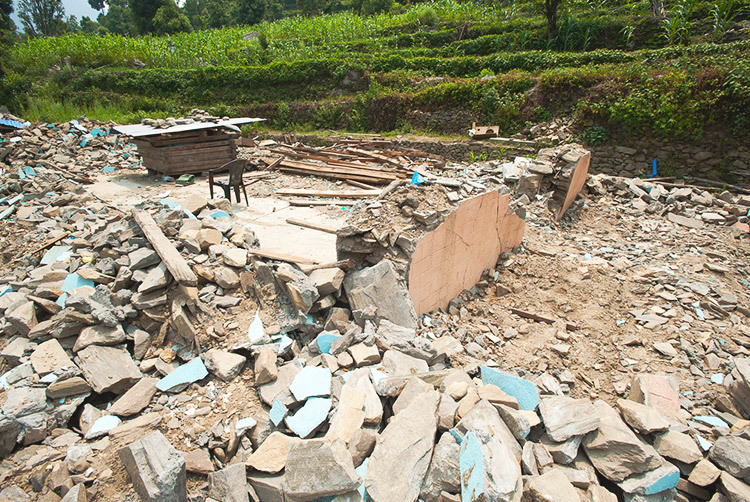 Most of the homes have been destroyed by the earthquake. 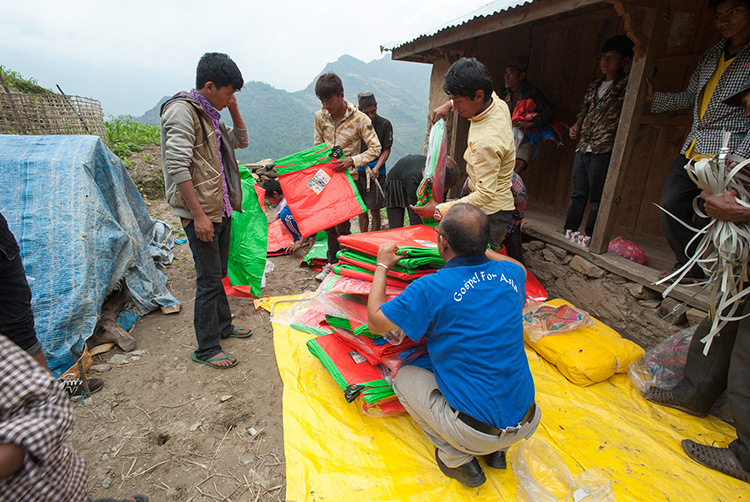 In two helicopter loads, GFA-supported Compassion Services teams were able to bring 160 tarps, which the villagers had requested, for protection from the upcoming monsoon season. 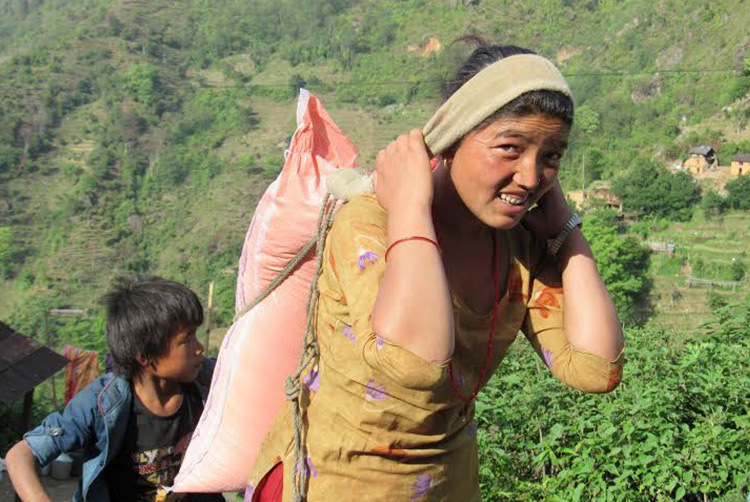 Drashtaa, a widow, lost her only granddaughter in the earthquake when the 16-year-old had gone into the forest to collect firewood. 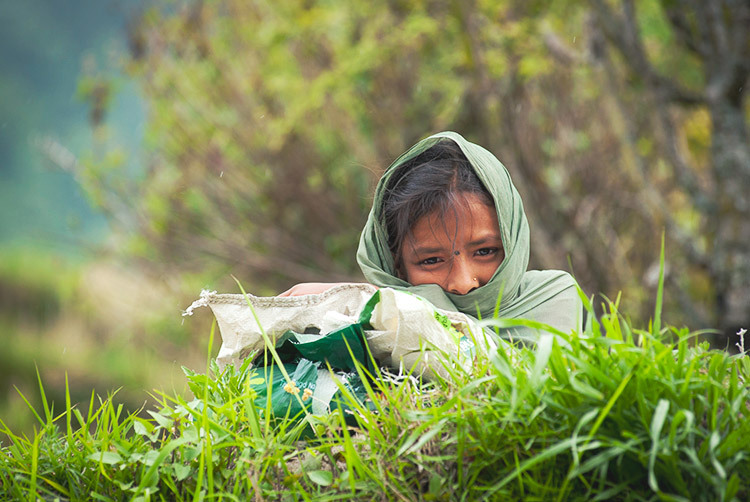 She is left alone, and like many others in Nepal, she does not know how she will start life again. 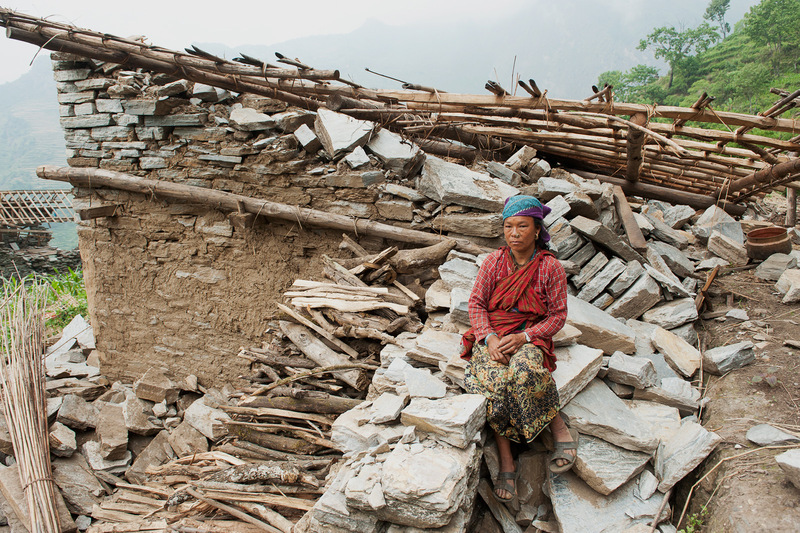 Bhumika Sherpa lost her husband in the disaster. He was mining for gemstones in the forest when the earthquake hit. She has five children to care for alone. 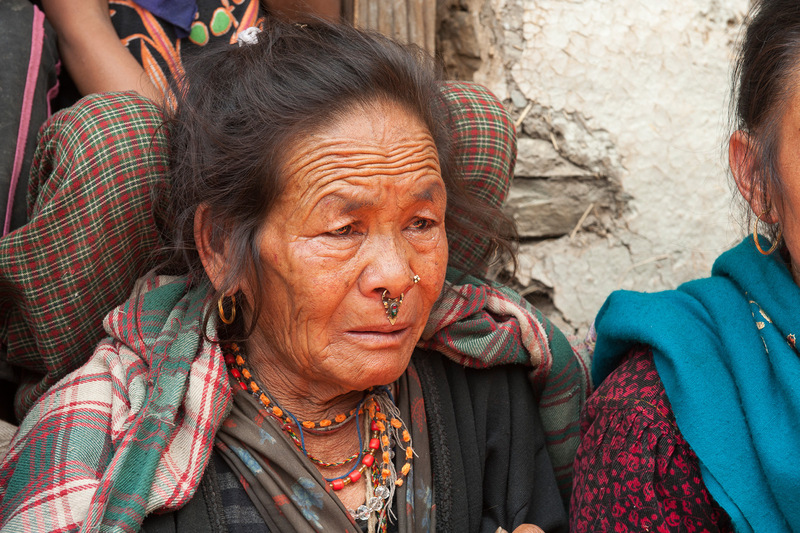 Please pray for the people of Nepal to find comfort and help in their time of need. 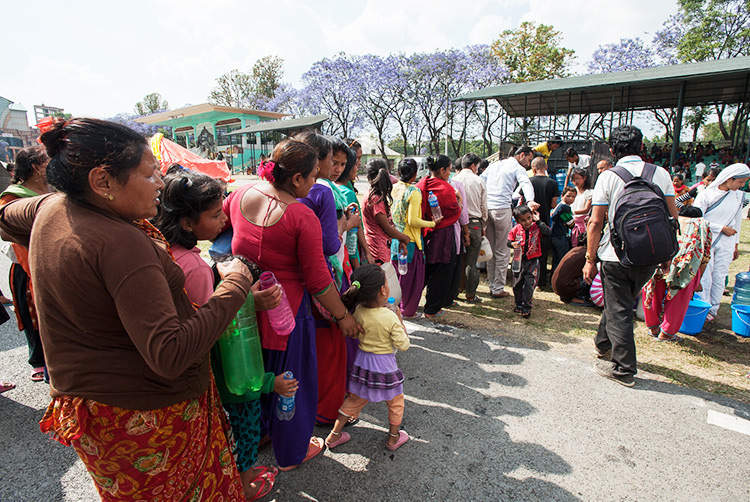 Read the timeline of some relief events that took place after the 2015 earthquakes. 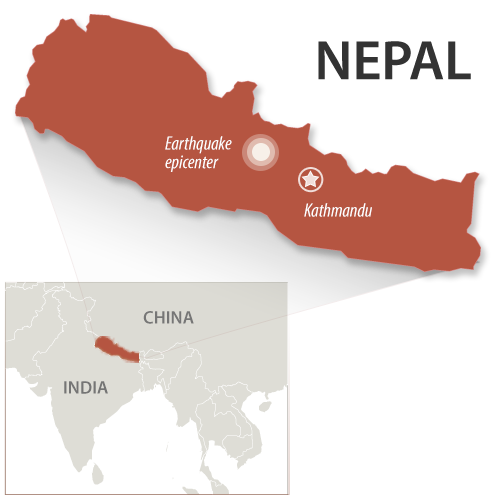 Since Nepal’s last major earthquake on May 12, 2015, the country has experienced at least 70 more quakes ranging from 3.7 to 5.5 in magnitude. 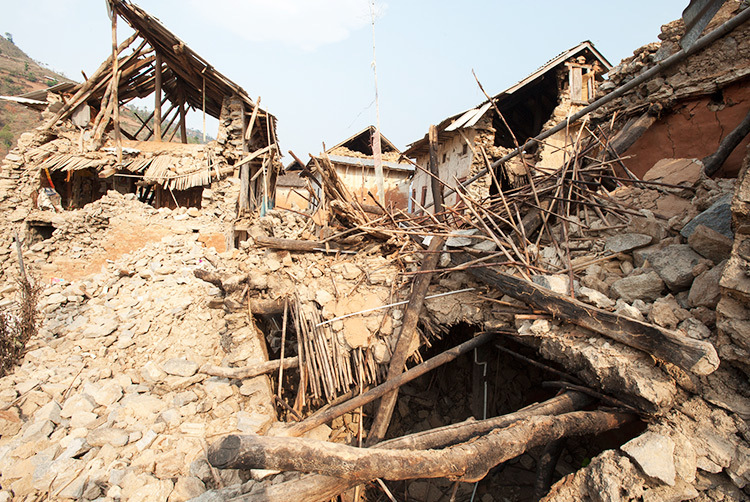 On Nov. 17, a 4.3-magnitude earthquake shook the Rasuwa District of Nepal. 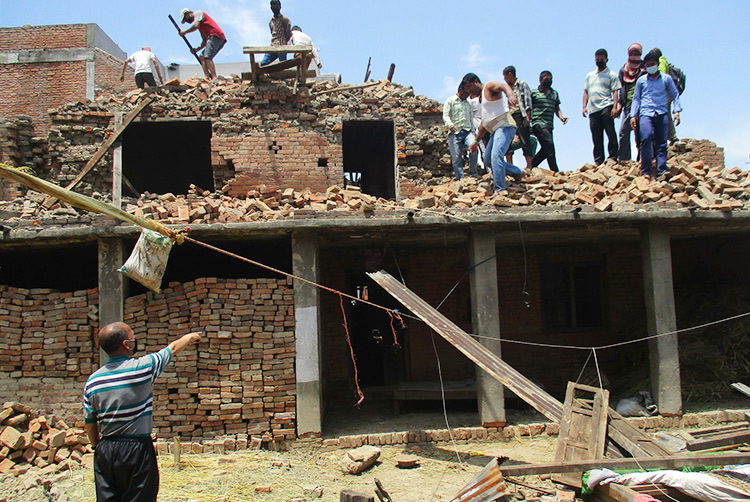 Two days later, the people of Nepal felt the tremors of another earthquake that reached 5.3 magnitude in intensity. 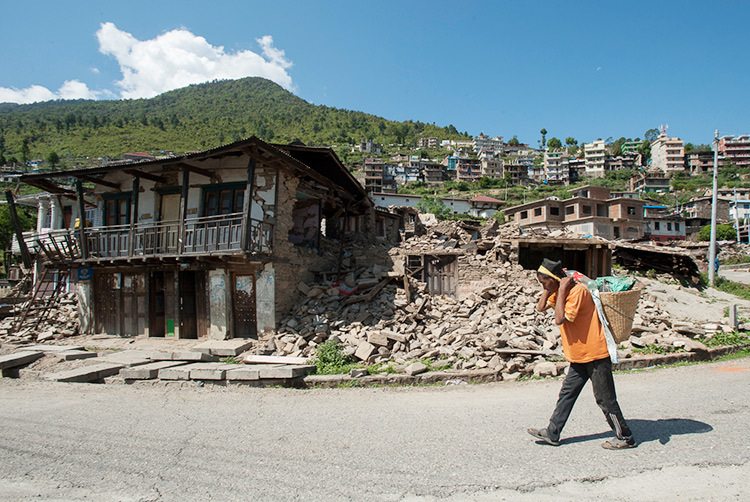 “Though lives have [returned to normal], such aftershocks despair the Nepalese from time to time,” said Hitendra, a Gospel for Asia-supported field correspondent. 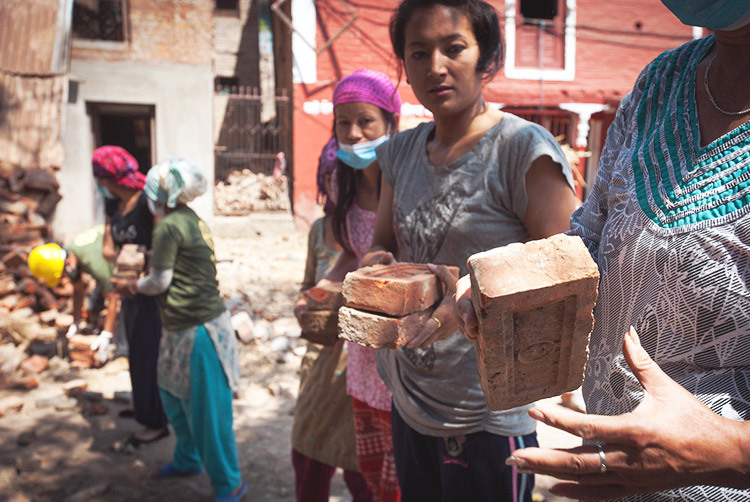 Please continue to pray for Nepal, especially while many people still work to rebuild their homes and find financial stability after losing everything. Pray also for God’s protection over the missionaries and pastors as they continue to minister to and help those in need. 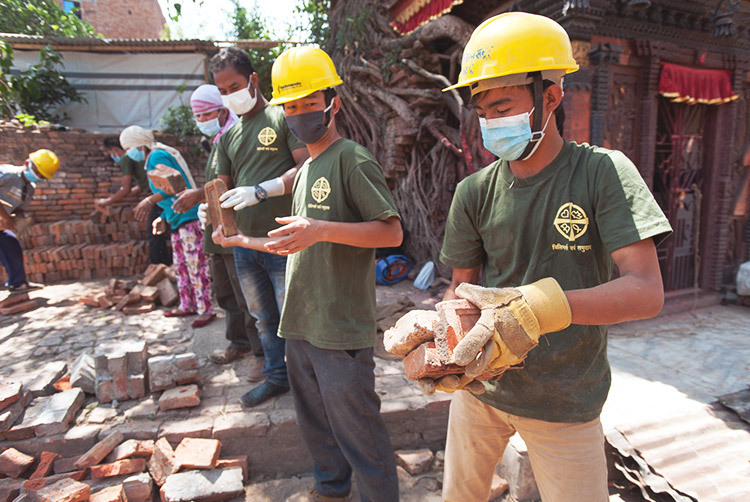 Gospel for Asia-supported Compassion Services teams continue to meet the needs of earthquake-stricken communities in Nepal through a variety of practical ways. 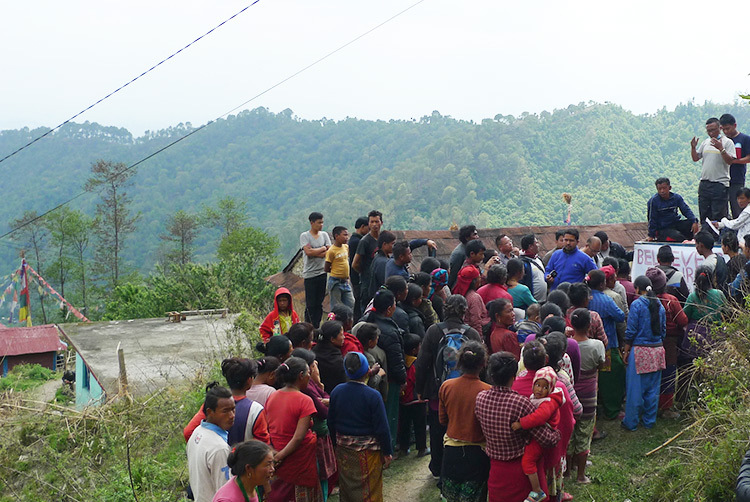 On June 30, a team visited the village where Gospel-supported pastor Deepit leads a growing congregation. 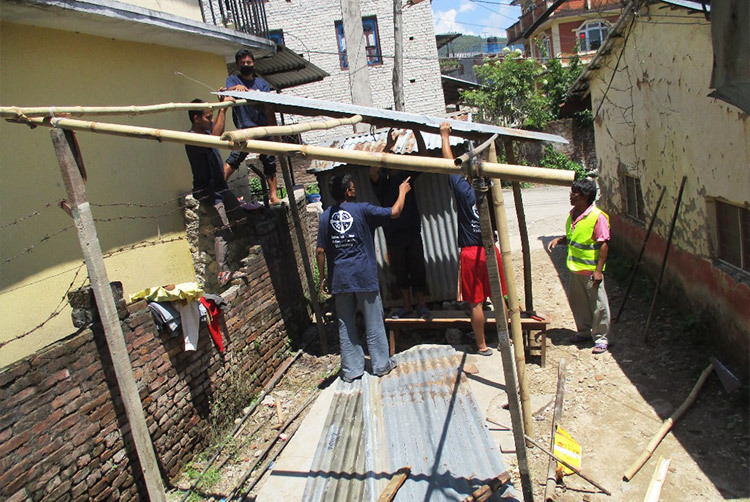 A Compassion Services team had already visited the village on June 21 to build shelters for two needy Christian families. This time, a team came to bless the children of the village. Pastor Deepit, who has served in the village for eight years, had started a tutoring program to help fight the problem of a high rate of school dropouts. Before the earthquake hit, about 50 students were taking part in the tutoring program. Instead of wandering aimlessly on the streets after school, the children started to excel in their studies. 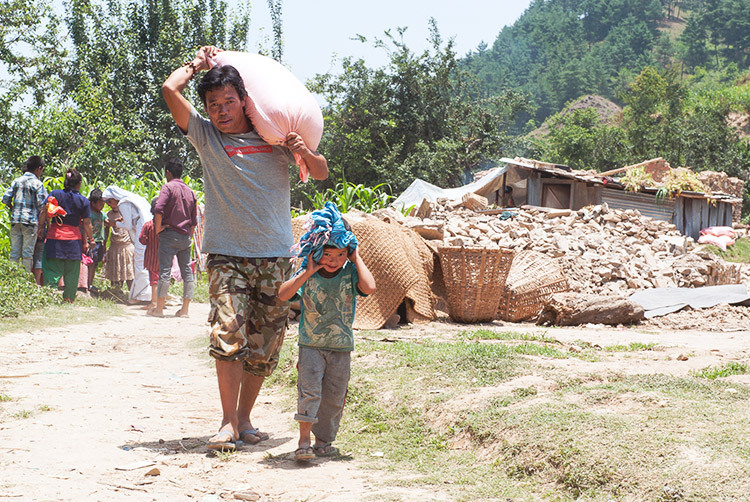 Unfortunately, after the earthquake, many families left the village, either temporarily or permanently. As a result, many students stopped coming to the tutoring program, but the number has been increasing as families return to the village. Despite the challenges they’ve faced, these students passed their classes with good grades. 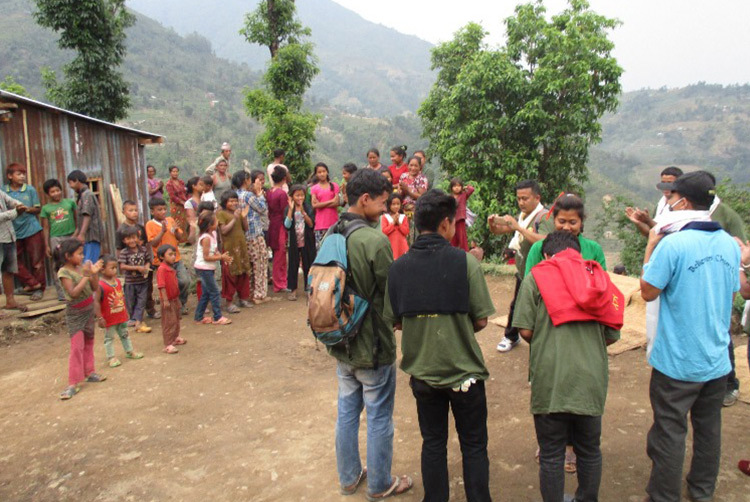 To encourage and support the boys and girls, the workers distributed packets of needed school materials, including 5 notebooks, 12 pencils, fountain pens, an ink well and a rain coat, to 58 students in the village. The students received the gifts with smiles, and they showed the relief team one of their favorite things to learn at the center: action songs. 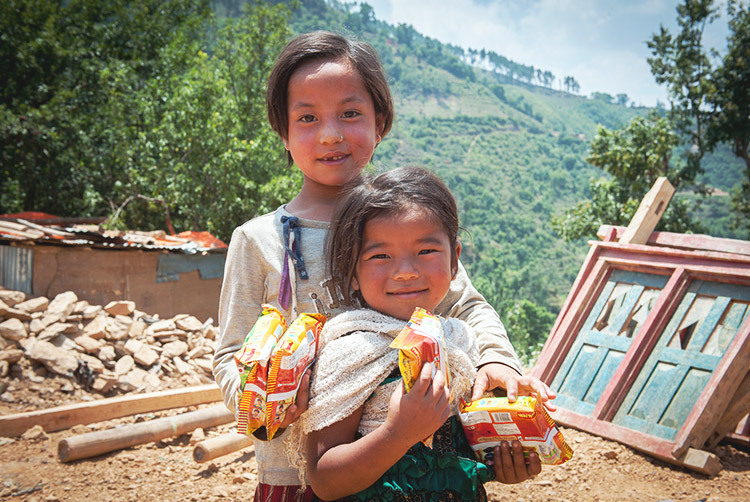 Basic school supplies can be difficult for families to afford, even in the best of times. These gifts will help lift a financial burden from suffering families’ backs and make each child more likely to stay in school and excel. 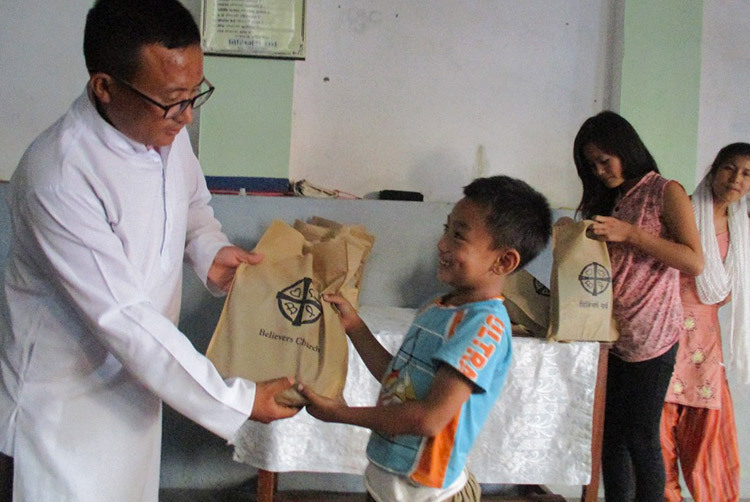 While Gospel for Asia-supported workers were able to help meet needs for shelter and education in Pastor Deepit’s village, on July 3 and July 5, they visited two other villages that were still in need of the most basic necessities. 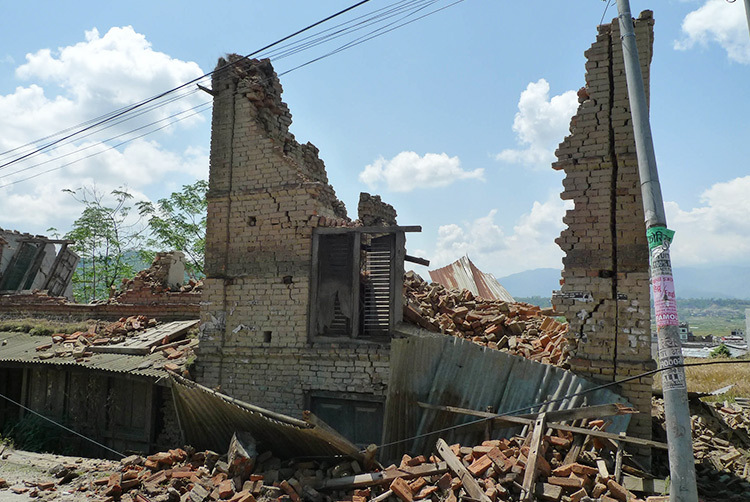 Almost every house in these villages was destroyed or had become uninhabitable because of damage, and people’s belongings were buried under the rubble. 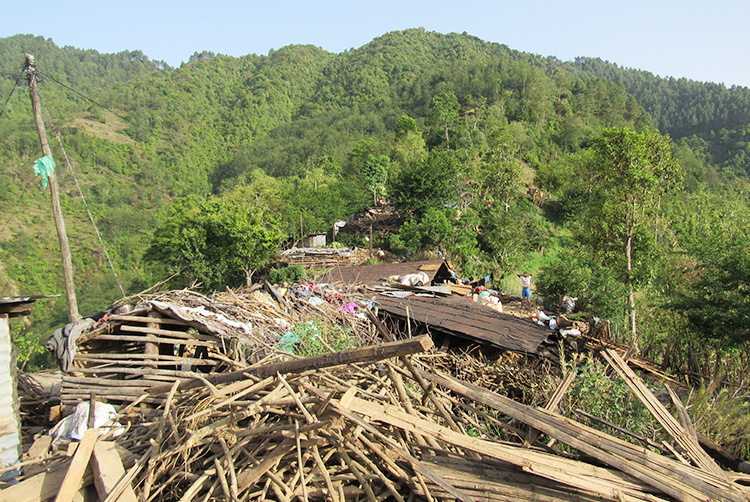 In one of the villages, some people had been injured, and a landslide had blocked the road leading to the village, making it difficult to reach. 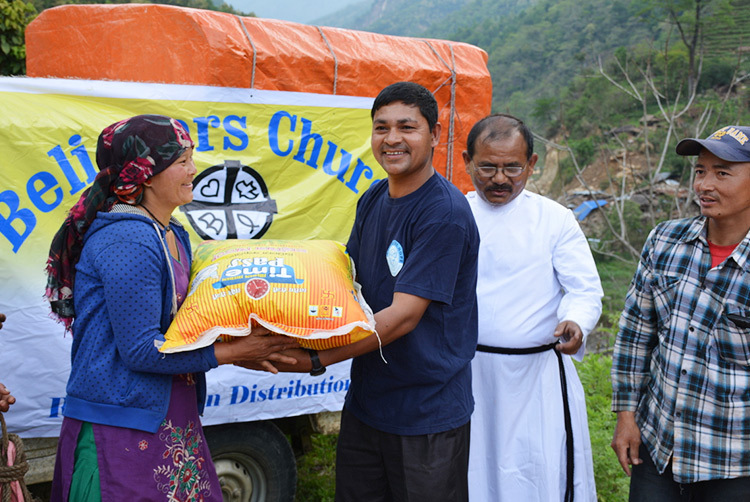 The Gospel for Asia-supported workers distributed rice and salt for the needy villagers. 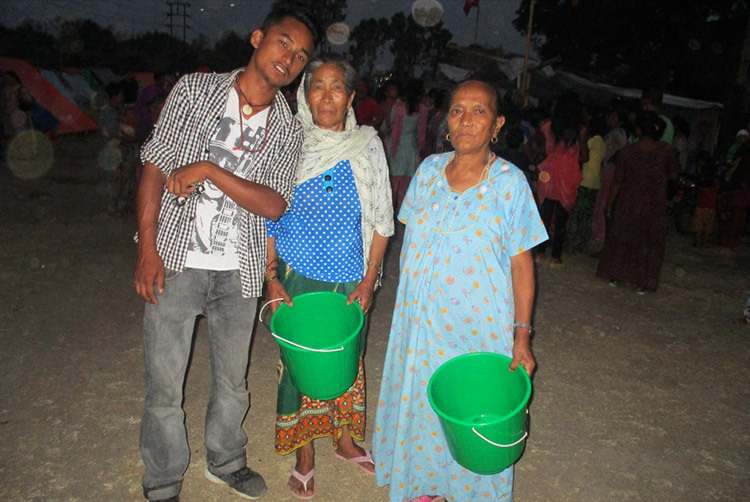 In one of the villages, the team distributed more than five tons of rice, and in the other village, they were able to give out buckets, mugs and mats in addition to the food items. 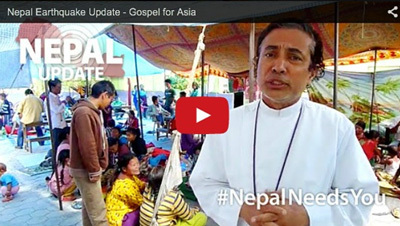 Wisdom for the leaders of Gospel for Asia-supported ministry in Nepal to know how to best serve earthquake victims. 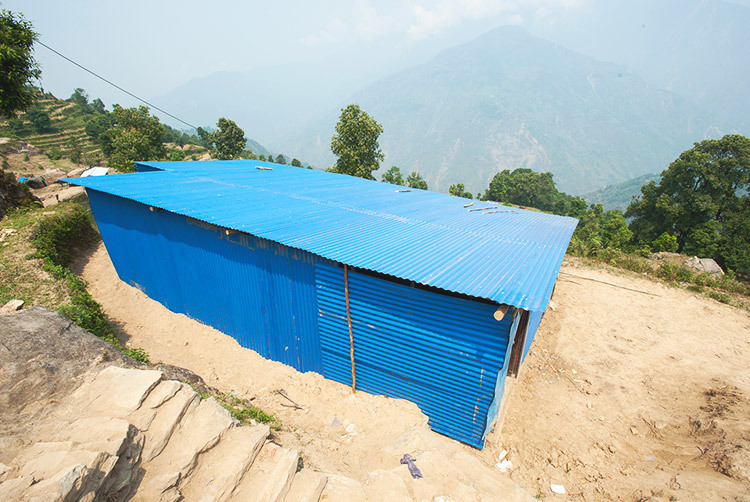 The Lord’s provision to rebuild homes. 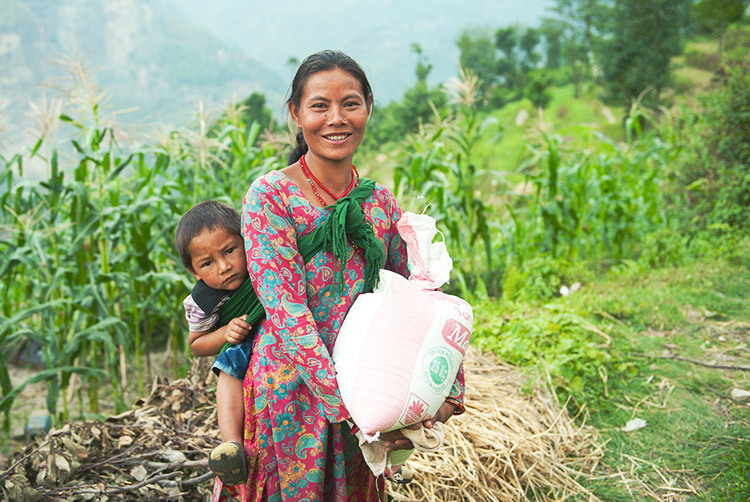 God to meet the needs of villages still in desperate need of basic aid. 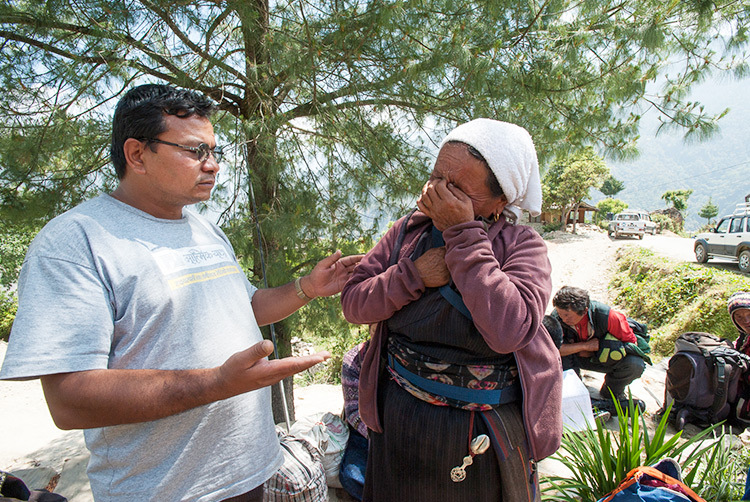 Earthquake victims to understand Jesus loves them as they receive relief. 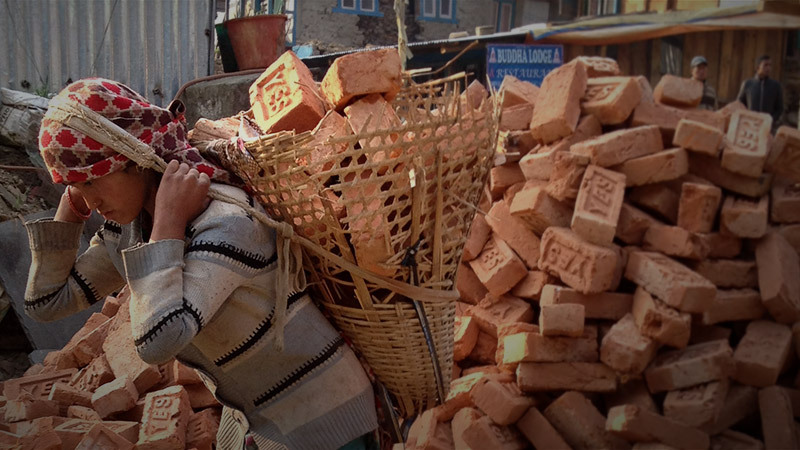 Life was hard enough for Barsha, a 30-year-old mother of two, before her house came tumbling down during the earthquake that hit her country of Nepal on April 25. Barsha’s husband had abandoned her, and her in-laws only mocked her in her hardships instead of supporting her. 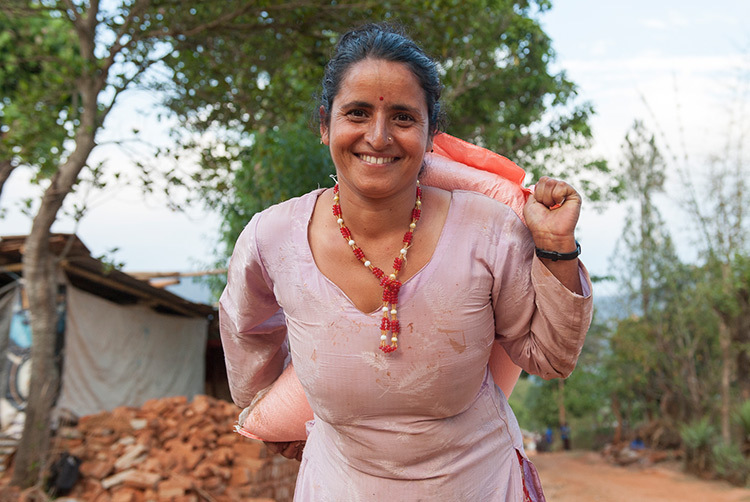 She had to toil as a daily wage laborer to provide for her children. Even through the trials, Barsha, a member of a nondenominational church, maintained a strong faith in Jesus Christ. 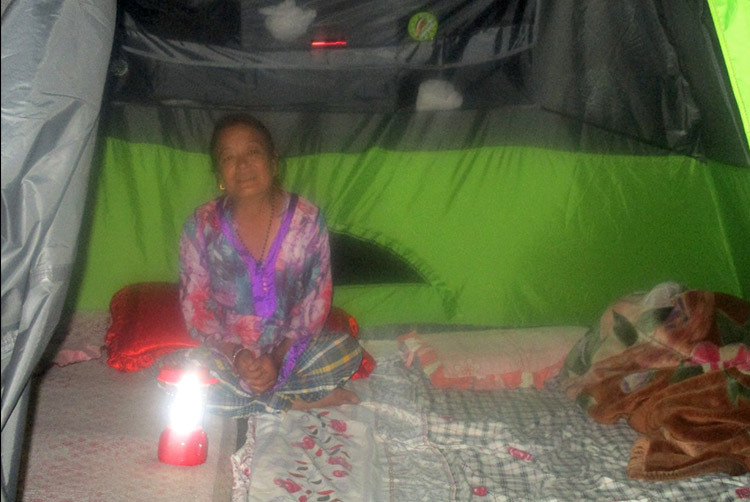 When the earthquake took away her home and belongings, she and her children found shelter in their neighbor’s home. But soon the neighbor started harassing Barsha to leave. 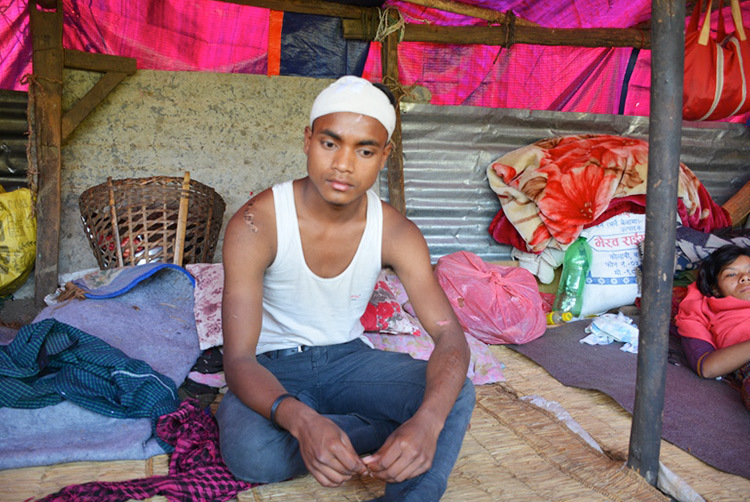 Nearby, Abheek and his family, also earthquake victims, sheltered underneath a tent—knowing it would offer little protection from the monsoon rains that would soon dump on their village. But they didn’t have another place to stay. 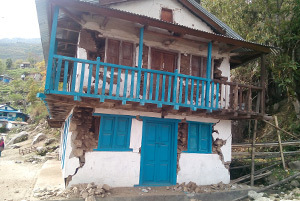 The earthquake had badly damaged Abheek’s home, and it was in danger of crashing down as Barsha’s had. 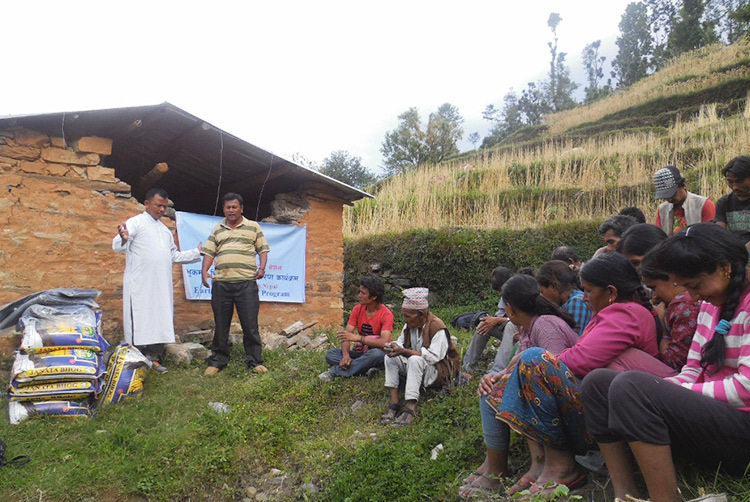 Abheek shared his concerns about the impending rains with his pastor, Gospel for Asia-supported pastor Deepit. Meanwhile, Pastor Deepit heard about Barsha’s situation. 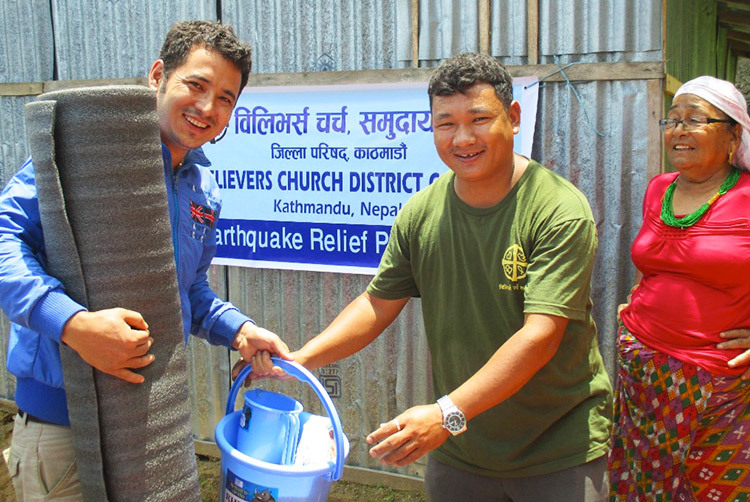 Moved with compassion for both Abheek’s and Barsha’s families, Pastor Deepit asked his leaders for help, and they organized a relief effort with a Gospel for Asia-supported Compassion Services team. On June 21, the Compassion Services team, consisting of 21 Bible college students and 10 believers from Pastor Deepit’s church, joined together to provide safe shelter for these two believers and their families. The team tore down Abheek’s unsafe house, and then they built two temporary shelters, one for Abheek’s family and another for Barsha’s. After working tirelessly under the hot sun from 10 a.m. until 4 p.m., the team saw the fruits of their labor: two shelters for two grateful families. 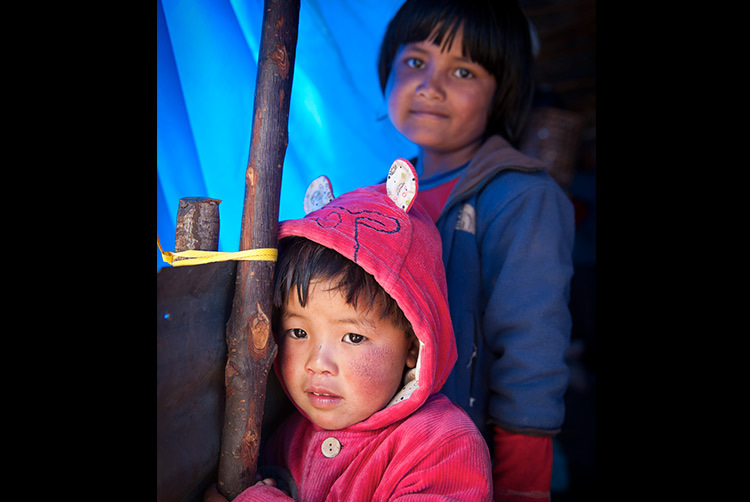 The shelters will give Abheek’s and Barsha’s families a protected place to live until they can find or build permanent homes. Members of the Compassion Services team saw their work as an opportunity to share God’s love not only with words but also with action. 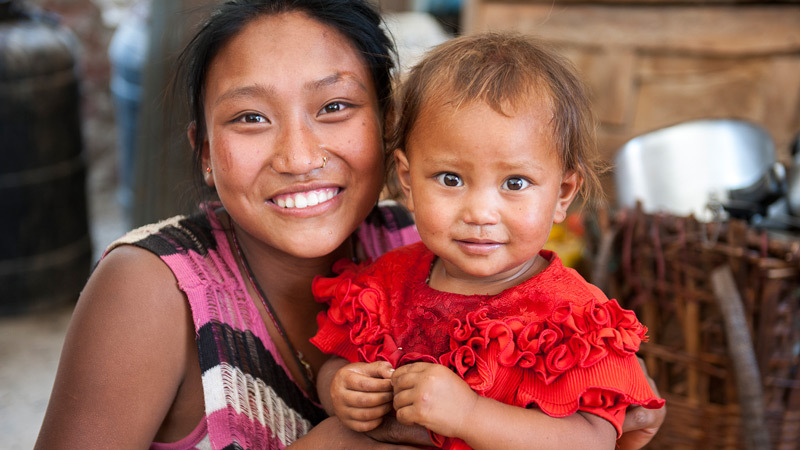 Assisting Abheek’s and Barsha’s families is one of many ways Gospel for Asia-supported Compassion Services teams have served earthquake-devastated Nepal during the past two months. 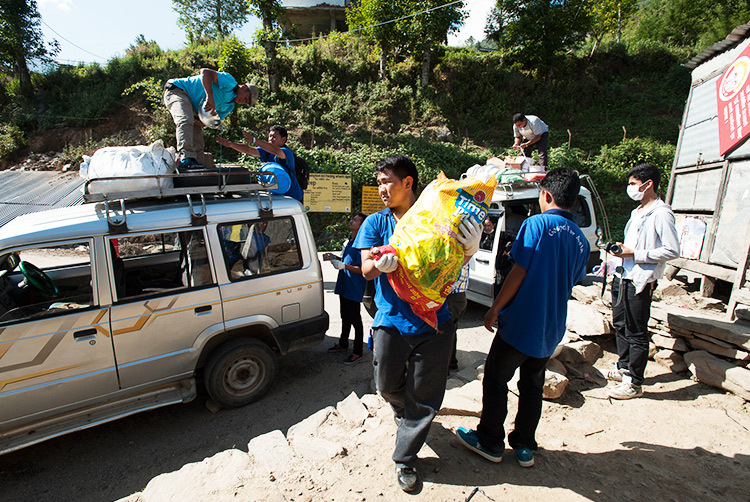 Teams have brought relief to a number of communities, many of them in hard-to-reach, mountainous areas, where people lack adequate food and basic supplies. 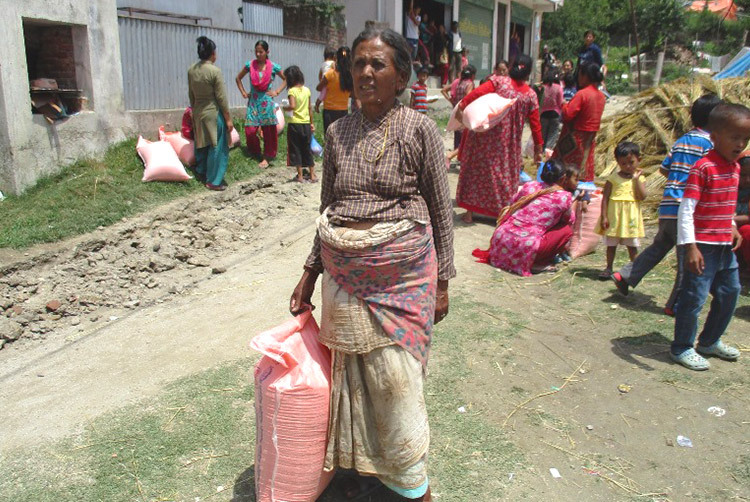 On June 8, a Gospel for Asia-supported Compassion Services team provided much-needed supplies to 100 families in a relief settlement near Kathmandu. 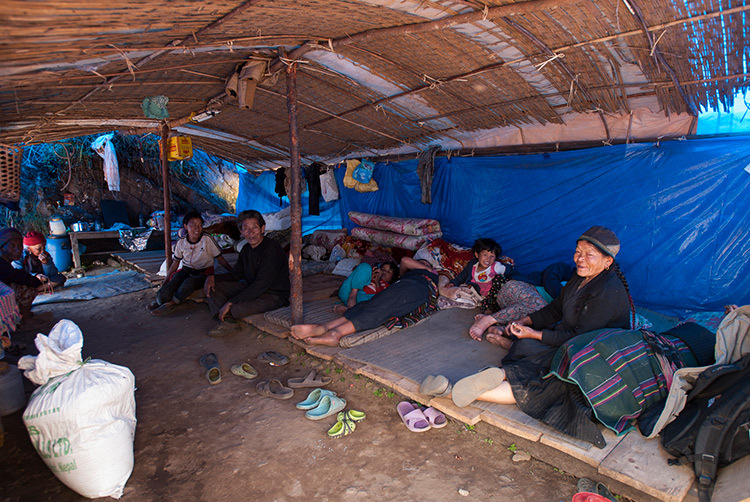 Approximately 600 families had taken shelter there after the April 25 earthquake destroyed or damaged their homes. Many lost all their belongings under the rubble. With no pots for washing, cooking or drinking and no toothpaste, toothbrushes or soap, the 600 families were struggling to live normal lives in the settlement. At nighttime, they lived in darkness because they didn’t have adequate light. 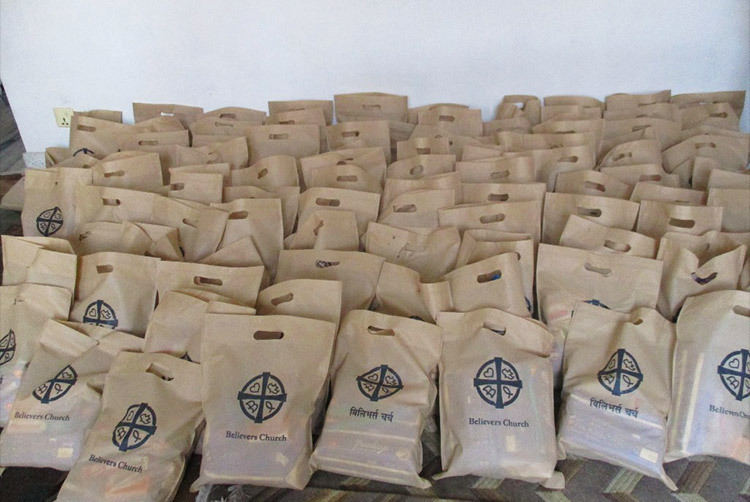 After learning about these families’ struggles, a Compassion Services team distributed 100 solar lights; 100 buckets; 100 mugs; and 100 bags that each contained soap, toothpaste and a toothbrush. 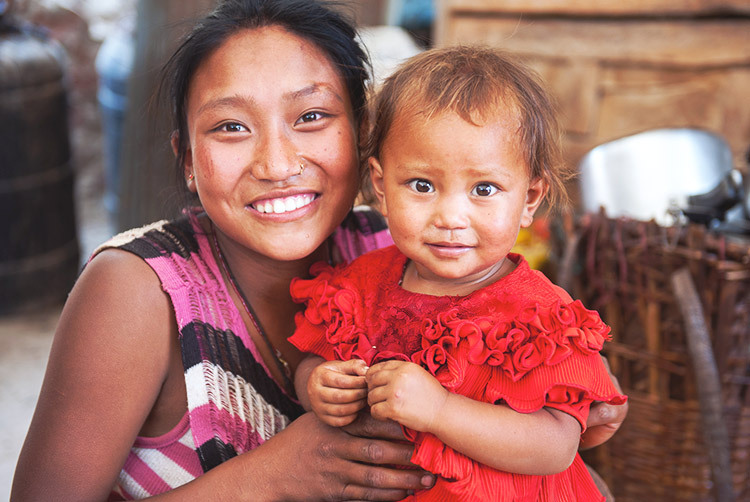 God to provide safe shelter for thousands more people in Nepal. Protection for Compassion Services teams. 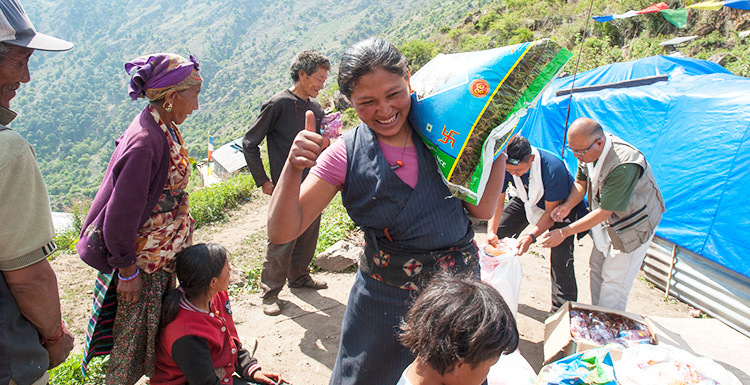 Many relief recipients to realize Jesus loves them. 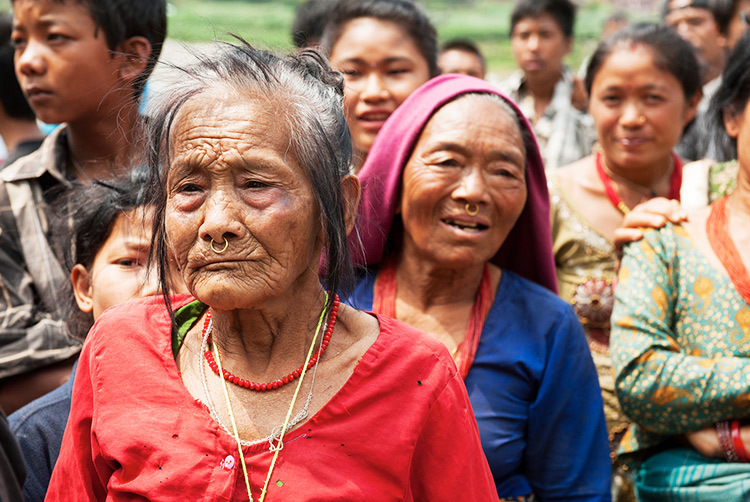 Over the past two months, Gospel for Asia-supported Compassion Services teams have traveled to many communities in Nepal, bringing relief in the name of Christ. 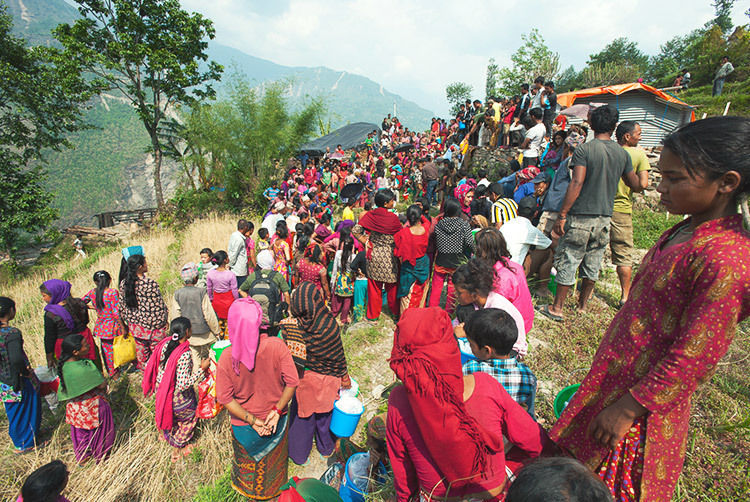 While these communities differ from each other—some are mountainside villages and others are tent dwellings in a major city, some depend on agriculture and others rely on industry, some have large Christian populations and others have never heard the Good News—they all shared one thing in common: a desperate need for aid. In many of these places, most residents no longer have homes to return to or a means of income to rely on, leaving them without adequate food or basic supplies. 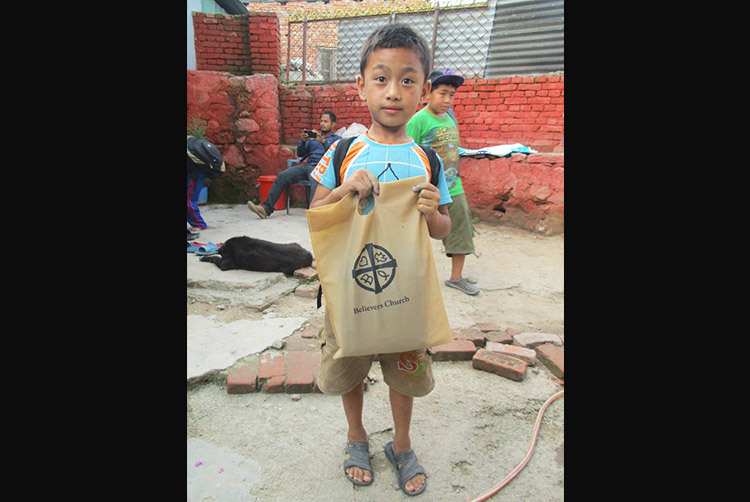 One Compassion Services team brought relief to a village in the Kathmandu district where a Bridge of Hope center, supported by Gospel for Asia, offers education to 85 children. In this village, many people worked as laborers in local carpet or garment factories. However, the factories closed down because of earthquake damage, leaving many people jobless, including the parents of most of the Bridge of Hope students. 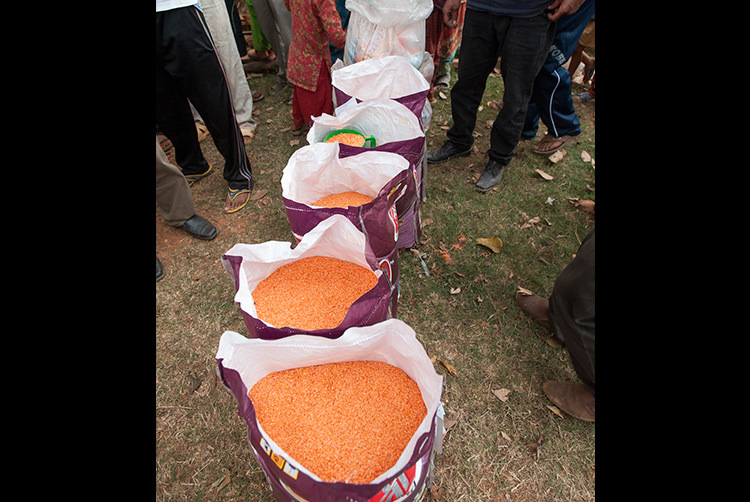 The relief team brought enough rice, legumes and salt to help 81 families survive for a few weeks while they look for work again. 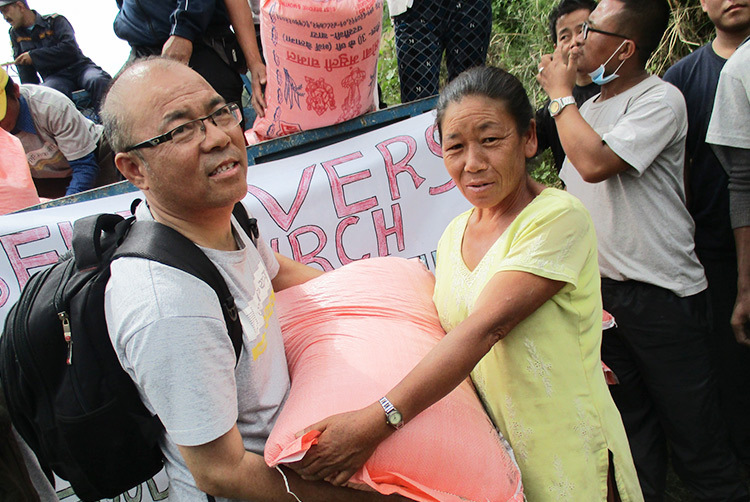 On May 22, another relief team, consisting of a Gospel for Asia-supported pastor and some believers from his church, traveled almost 16 hours to provide relief in Beteni, an extremely isolated, agrarian village. The earthquake affected 90 percent of Beteni’s residents, forcing them to stay in temporary housing and leaving them discouraged and in need of food. 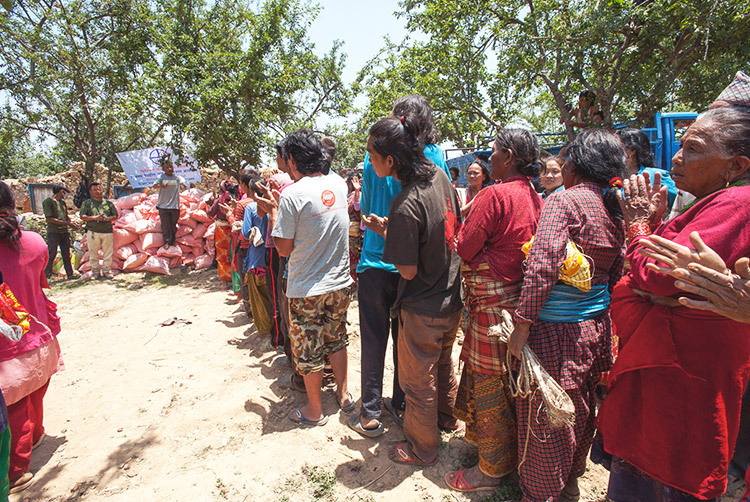 The relief team gave rice, chickpeas, salt, oil, noodles, biscuits and soap to 30 families. 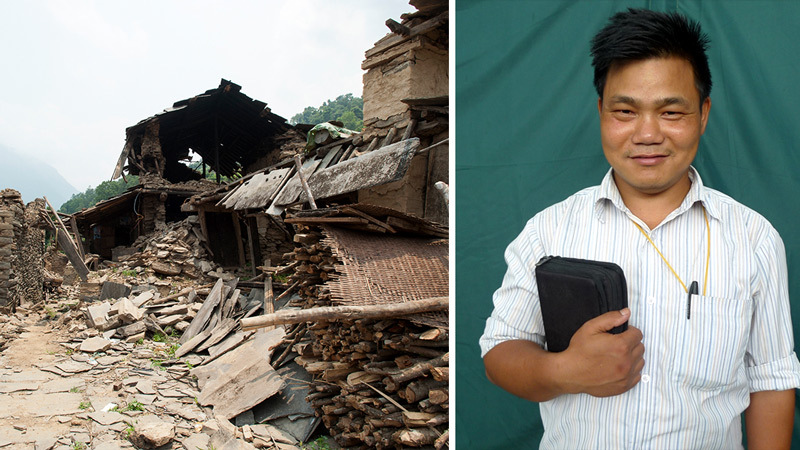 Recently, Gospel for Asia-supported photojournalist Raahi has been traveling to different villages to assess damage done to church buildings by the quakes and landslides. 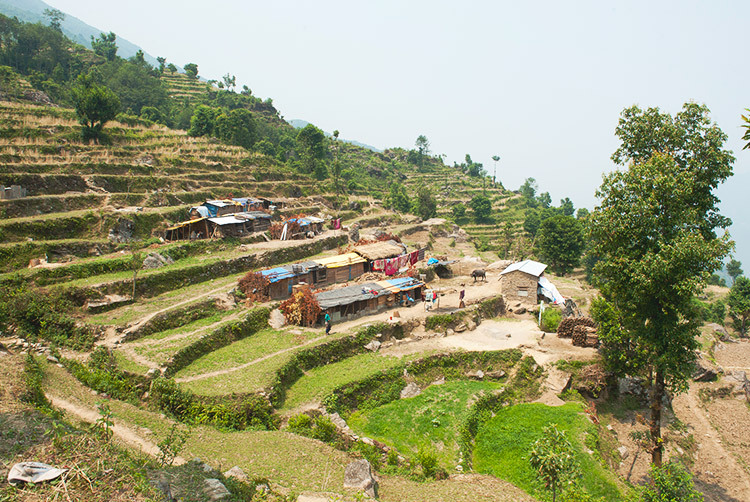 One village he visited stands on a steep face of a mountain, and the only trail connecting it to the outside world is often damaged by landslides during the rainy season. 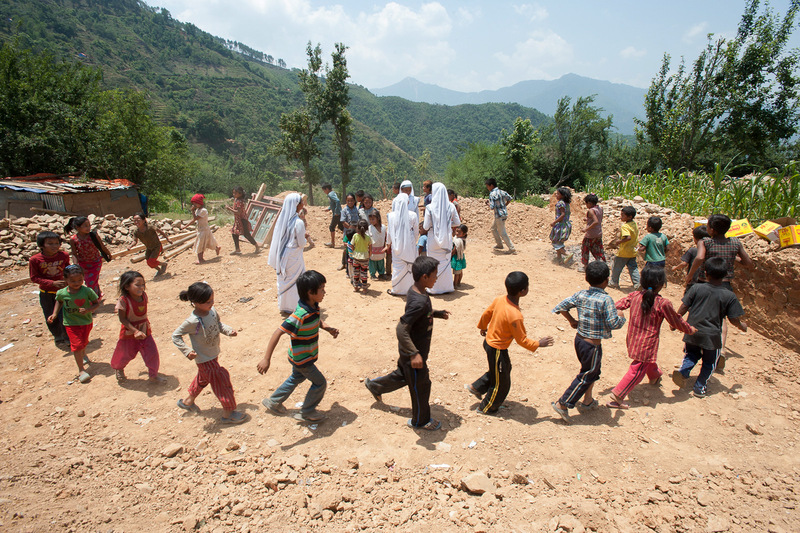 Despite the remoteness of the village, a thriving congregation of Christians lives there. Most of the village’s 300 residents proclaim the name of Christ, and each Saturday 160 to 180 believers gather together for worship. 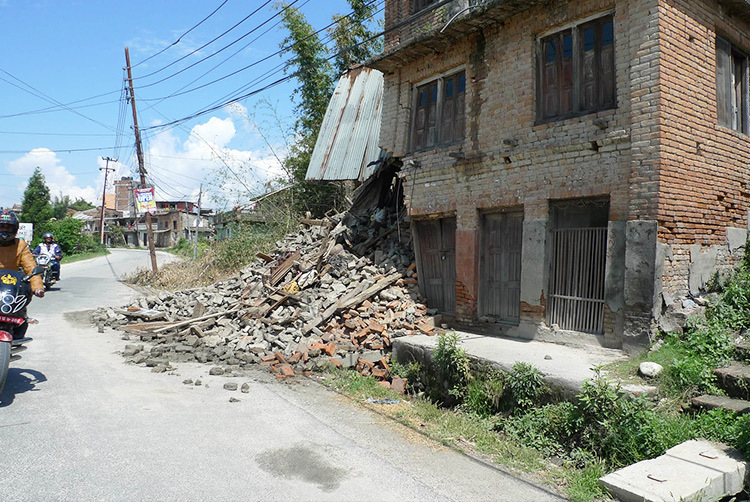 The April 25 earthquake felled almost every house in the village, and the only houses still standing are uninhabitable. When the quake hit, the pastor and six believers were inside the church building, preparing for the worship service later that morning. The building collapsed, but thankfully, no one was harmed. 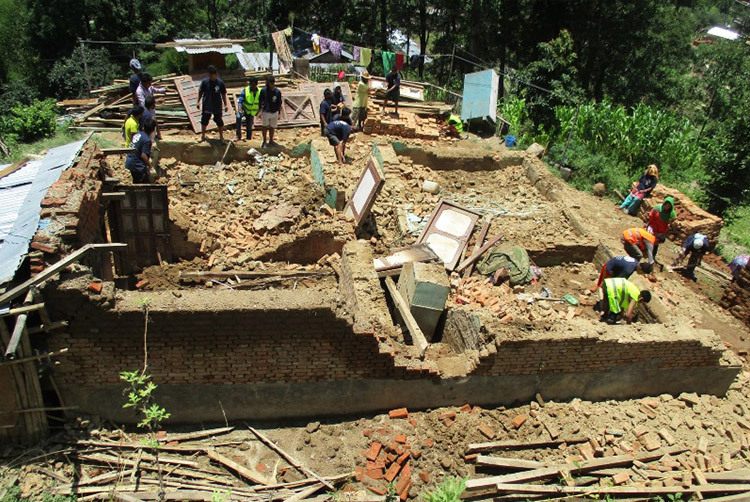 Because of the village’s precarious location and vulnerability to landslides, government officials asked the villagers to vacate the area. They have moved to higher ground, and the believers constructed a temporary shed there so they can continue coming together to worship. 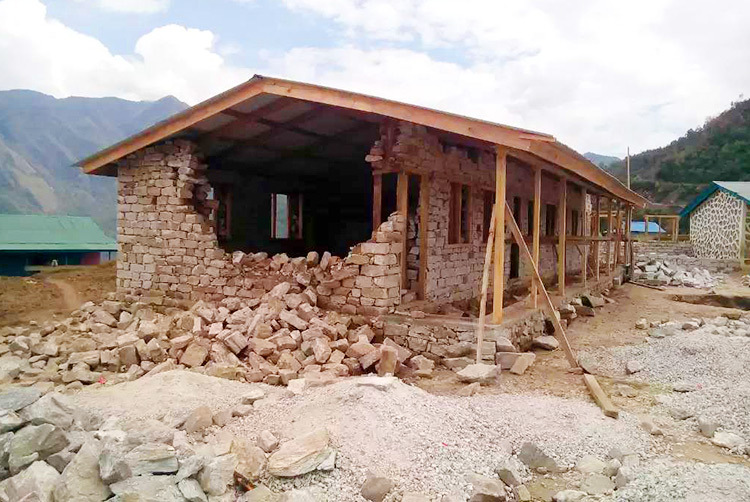 God to provide new church buildings for congregations that have lost theirs due to the earthquake. Continued endurance and love for Compassion Services team members. 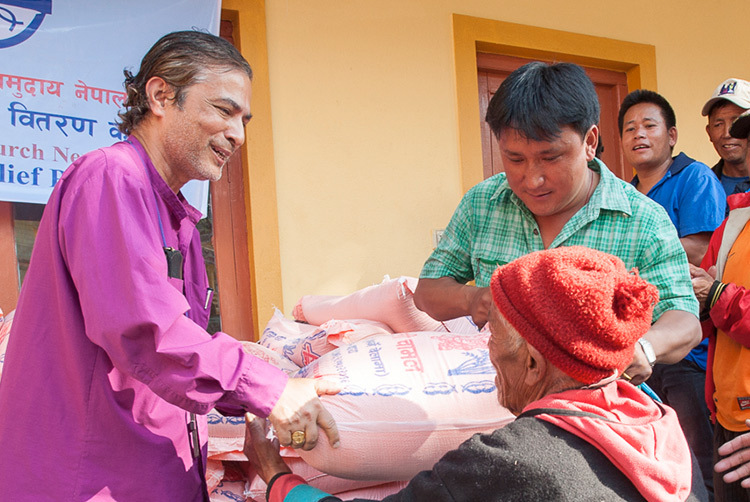 Relief recipients to realize Jesus loves them. 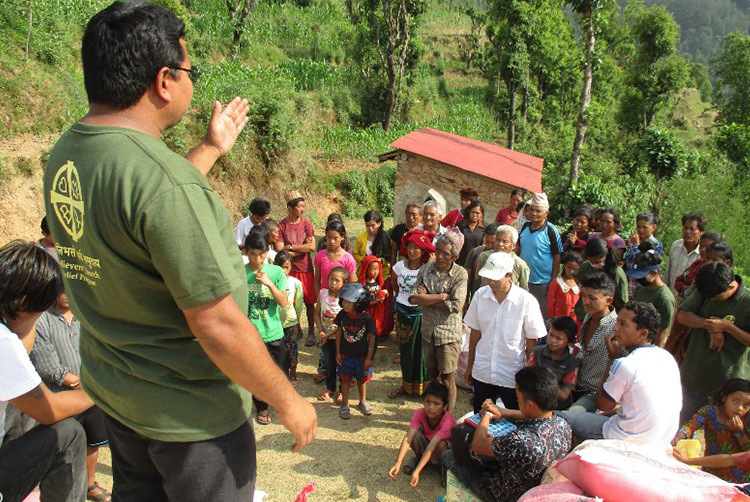 Responding to a Gospel for Asia-supported pastor’s request for assistance for 210 families, a Compassion Services team brought relief to a village in the hard-hit Sindhupalchowk district earlier this month. About 500 people were waiting because they heard the team was bringing food. The team distributed 210 bags of rice, 660 pounds of dal, 330 pounds of salt, 330 pounds of sugar, 40 gallons of cooking oil, 20 sets of cooking and eating utensils and 150 bars of soap. While in the village, the team met Dhruba, a forlorn young man. The earthquake had taken the life of his mother, his only immediate family member. Although Dhruba is staying with relatives, he doesn’t know how to keep living. As a support and encouragement to him, the team gave him extra cooking vessels and plates in addition to the other relief supplies. 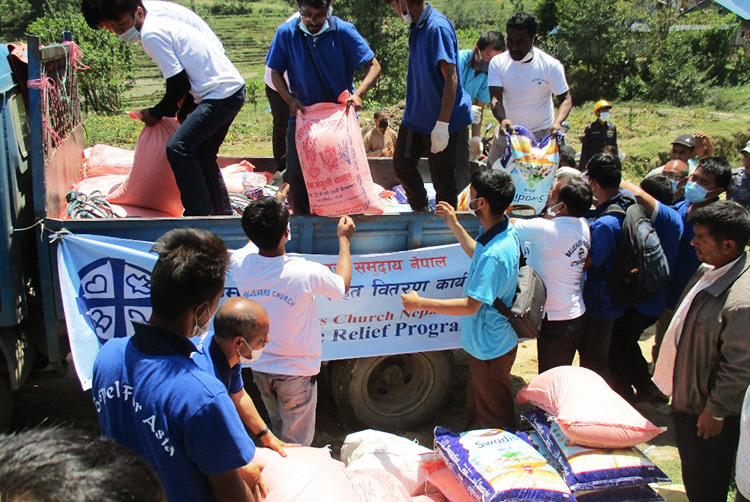 Next, the team brought relief to Dahachok, a village where more than 200 families live. 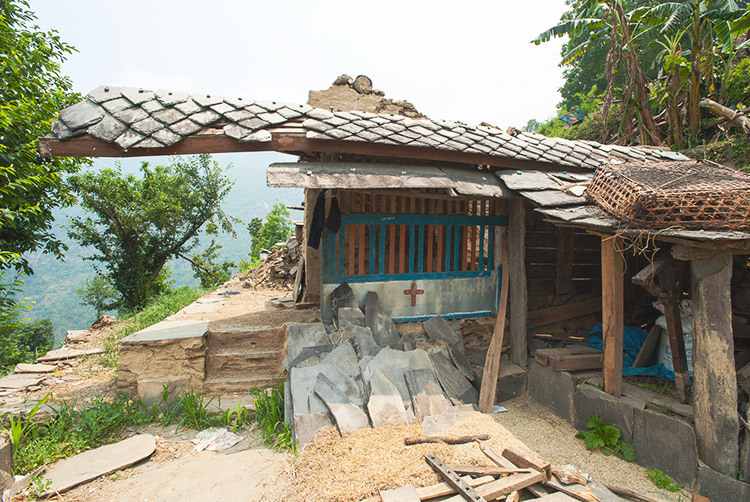 Almost every house in the village had collapsed in the earthquake, and those that hadn’t became uninhabitable. One man lost his son and daughter in the disaster. The villagers had previously received some assistance, but their rations had run out. 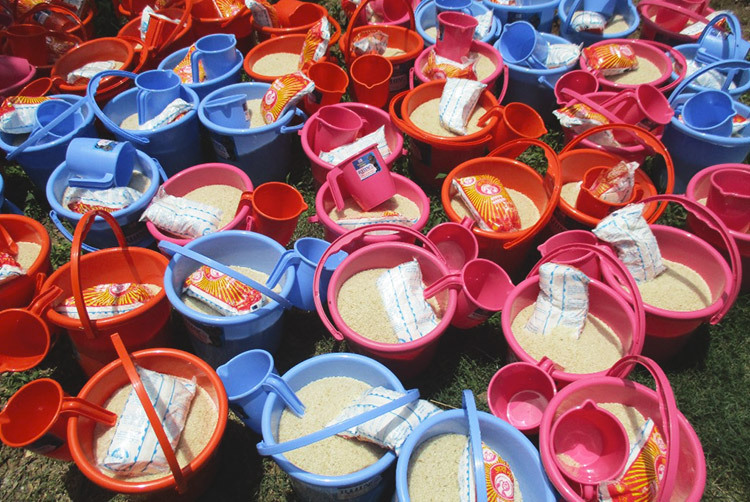 The Compassion Services team distributed 127 bags of rice, weighing approximately 66 pounds each. 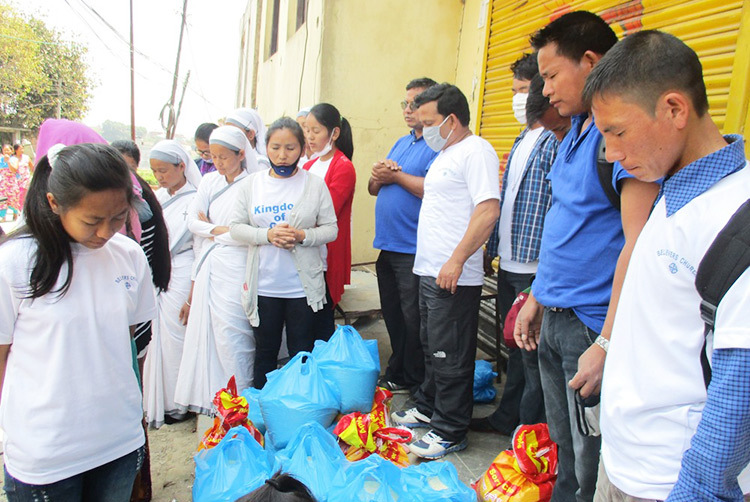 They also gave each family four pounds of dal, one liter of cooking oil, noodles, toothpaste and four toothbrushes. Four Sisters of Compassion who were serving on the relief team spent time with the village children, who had been traumatized by the earthquake. The Sisters played games with them, trimmed their nails, told them uplifting stories and gave them noodles and candy. 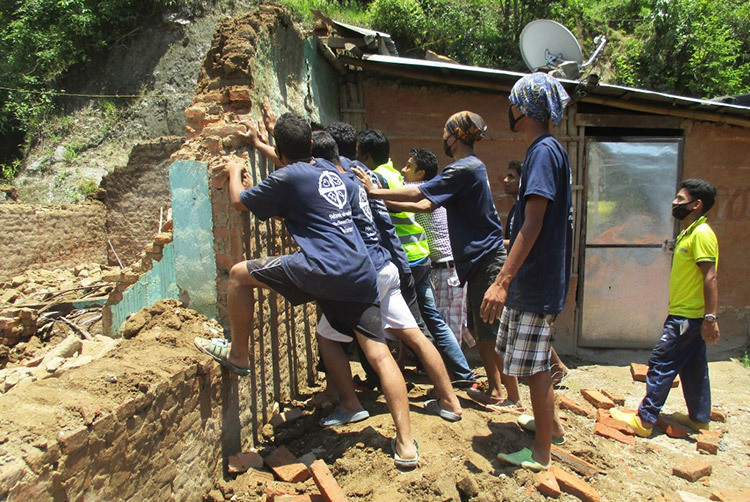 On June 7, a group of 55 believers from eight churches led by Gospel for Asia-supported pastors gathered together to help demolish the unstable home of Ranajit Niraula, who lives in a village on the outskirts of Kathmandu. 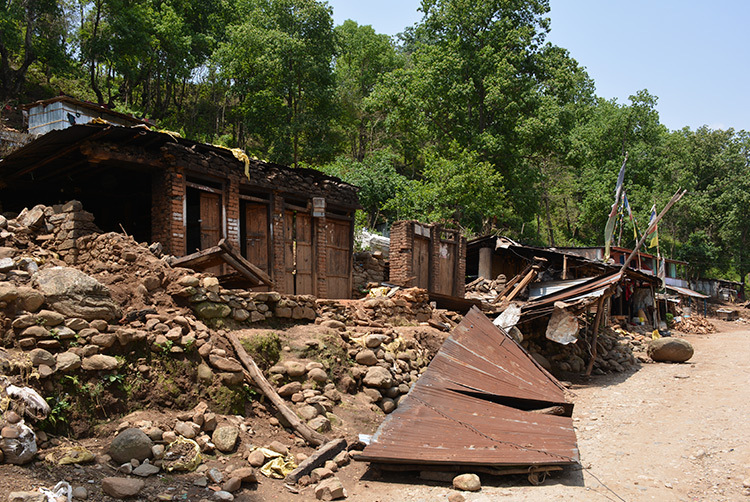 While many houses were completely destroyed in the earthquake, others remained standing but are seriously damaged and unsafe to live in. Despite warnings from the government about their dangerous condition, some people are still living in such homes because they feel they have nowhere else to go. 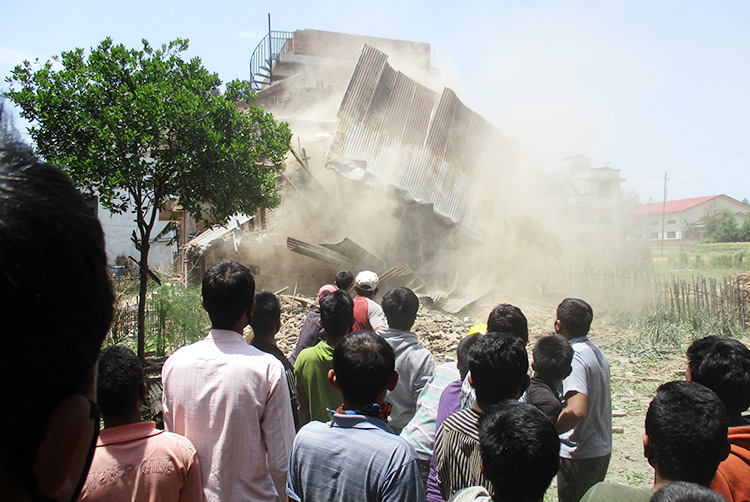 The believers labored from 8 a.m. until 5 p.m. to destroy Ranajit’s house, and their hard work gladdened his heart. He would have struggled to pay for tearing down the house, which likely would have cost hundreds of dollars. 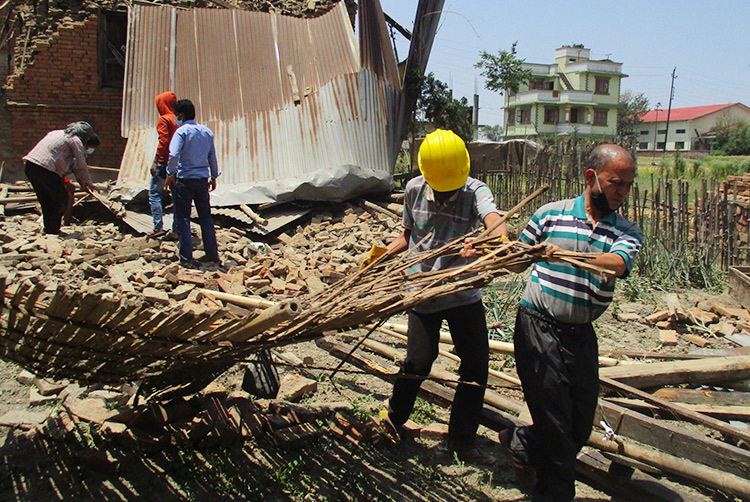 As the team helped destroy Ranajit’s house, three locals asked if they could receive help in demolishing their homes too. 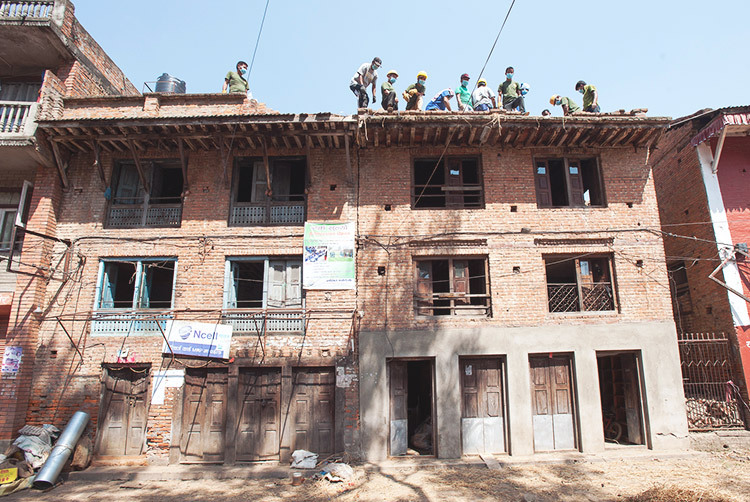 The leaders of the Compassion Services work in Nepal plan to bring together believers and Bible college students one day each week to pull down unsafe houses. Protection for those living in unsafe conditions. 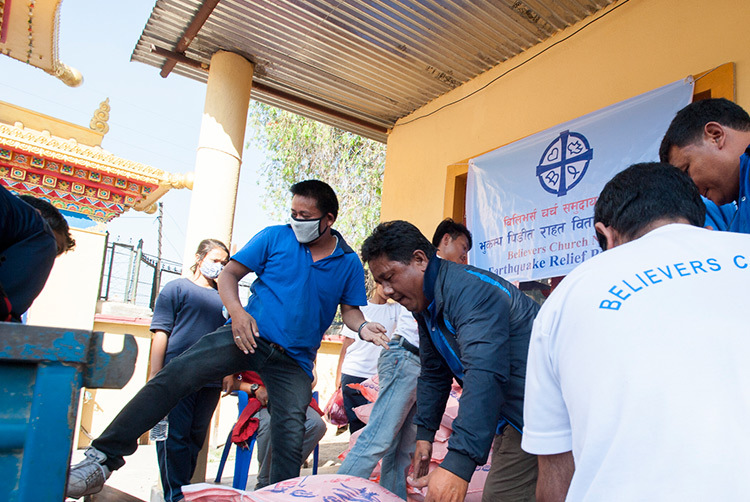 Continued provision for the spiritual and physical needs of all earthquake victims. Endurance and joy for Compassion Services workers. Safety for those helping to destroy damaged homes. 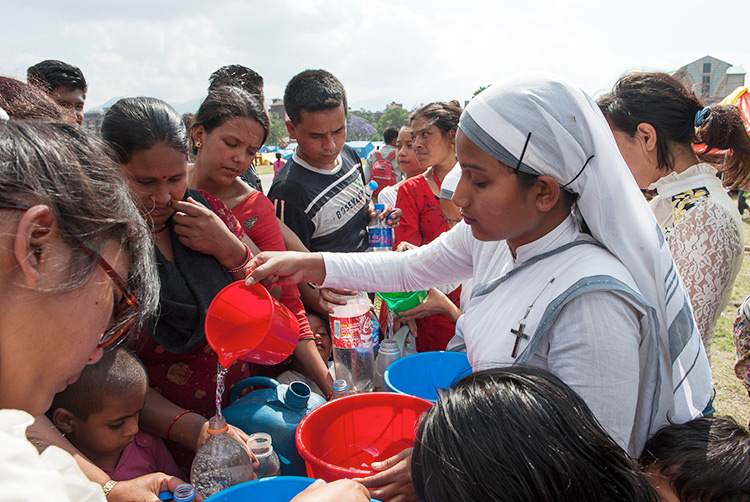 Believers to shine Jesus’ light as they help in relief efforts. Many to find comfort, peace and new life in Christ. 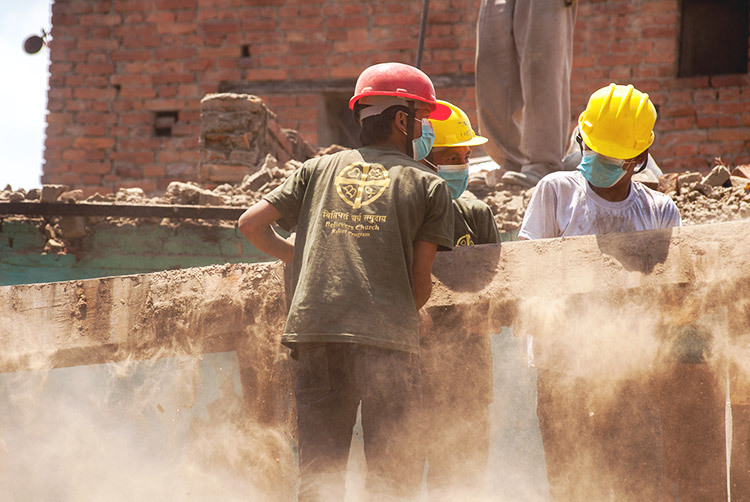 Gospel for Asia Compassion Services teams continue to bring relief and hope to communities in urgent need of help following the catastrophic earthquakes that hit Nepal on April 25 and May 12. 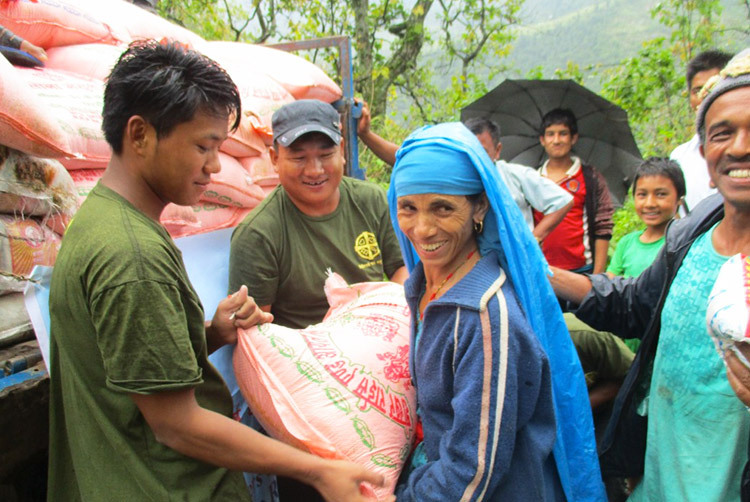 Gospel for Asia Compassion Services teams have touched many lives in Nepal through relief events during the past several weeks. 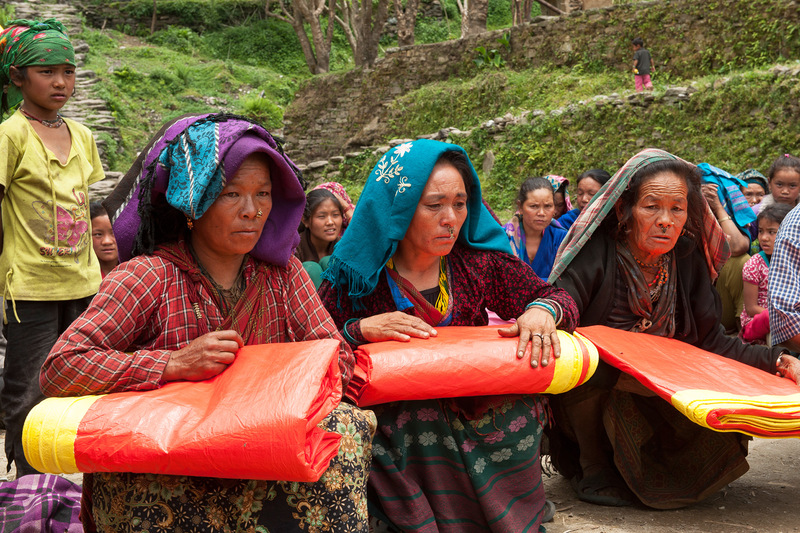 The teams have distributed useful items, including tents, rice, salt and blankets. 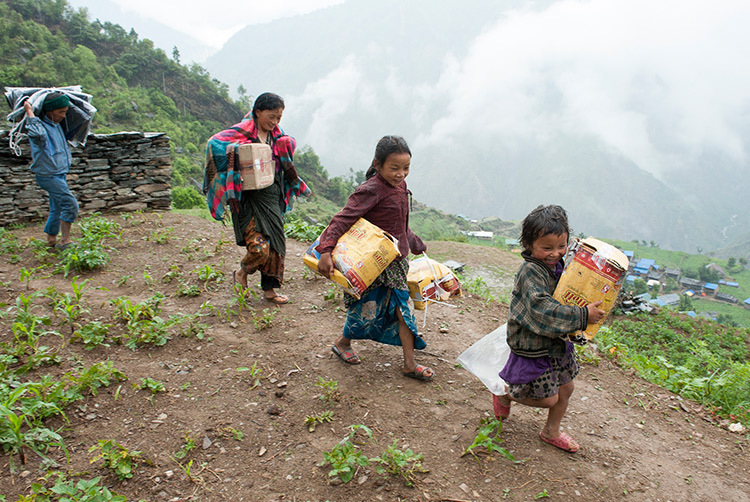 They have focused on reaching remote, hard-to-reach villages where many people lost homes, possessions and sometimes loved ones. 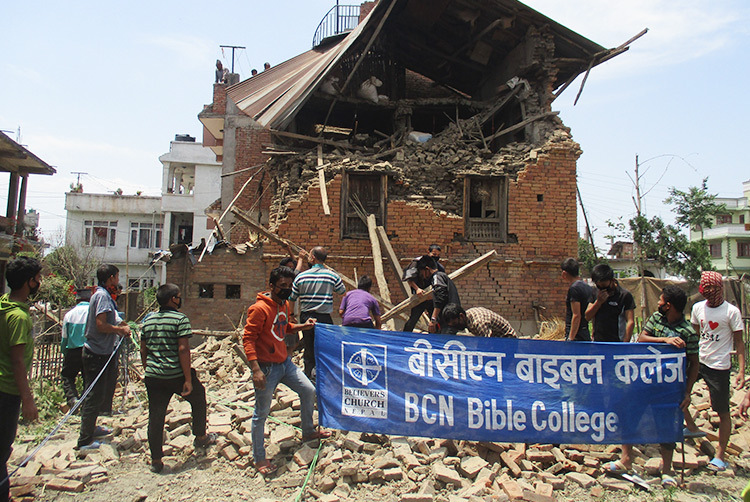 At some of the events, youths from congregations in Nepal led by Gospel for Asia-supported pastors have assisted with relief efforts. 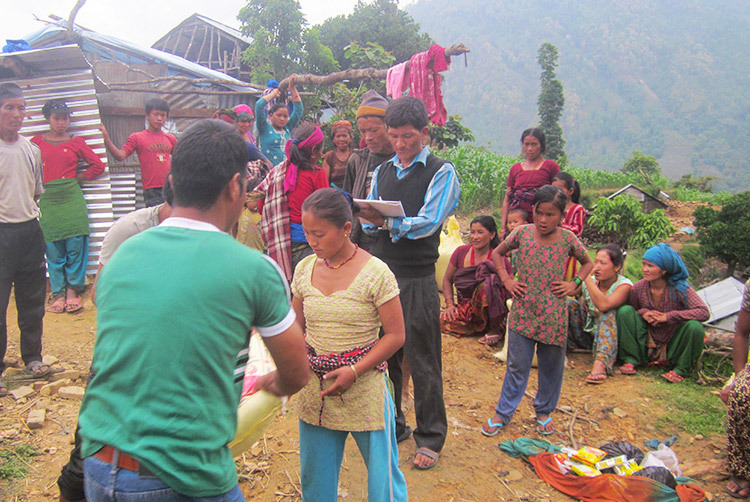 On May 18, a Compassion Services team met with 18 families from Makalu village to give them rice, salt, soap and rechargeable lanterns. 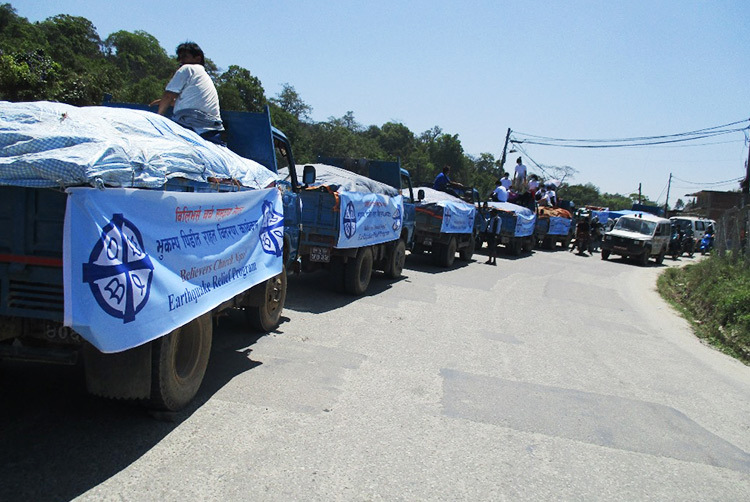 Because the team could not travel to Makalu with their vehicle, the villagers had walked a long distance to pick up the relief items. 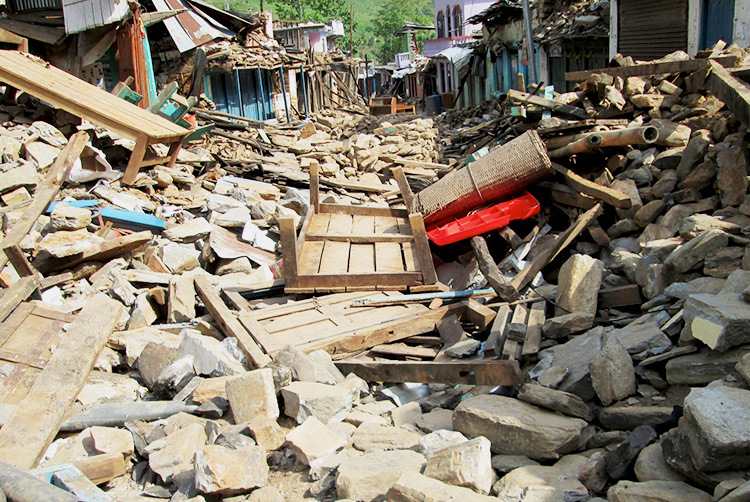 The earthquakes had affected 90 percent of the residents of Makalu, forcing many to live in the open. 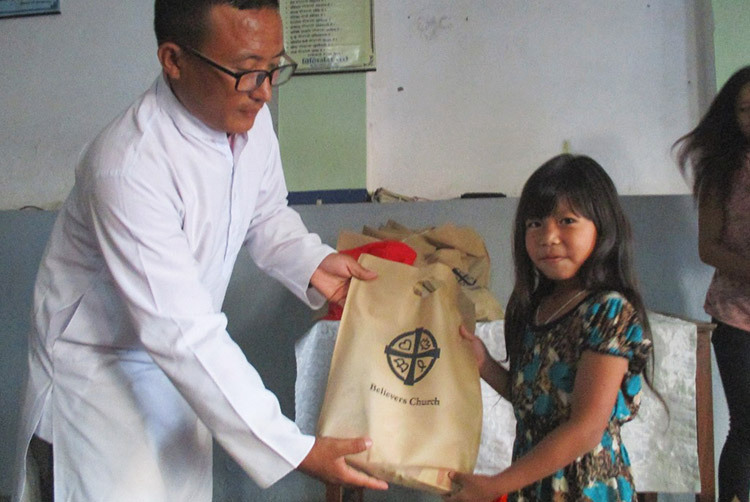 The team also gave a teacher from Makalu 240 notebooks, 120 pens and 6 packets of pencils to distribute at the primary school there. 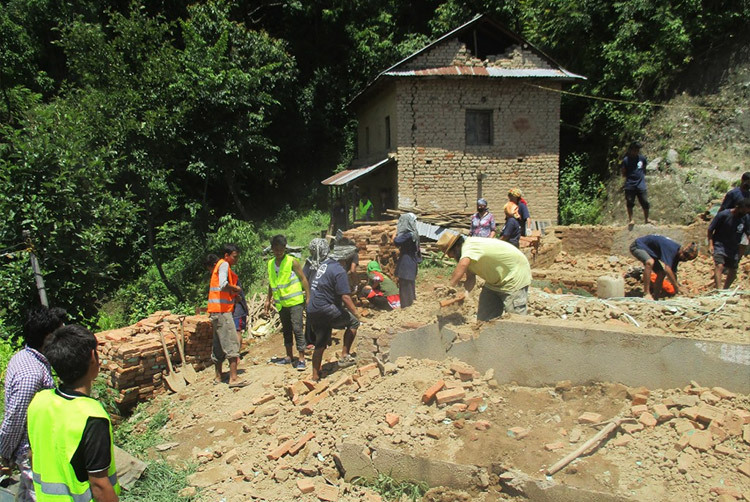 On May 21, a Compassion Services team traveled three-and-a-half hours to provide relief to 113 families from a cluster of five villages, where the earthquakes had taken two lives, injured one person and destroyed all the houses. 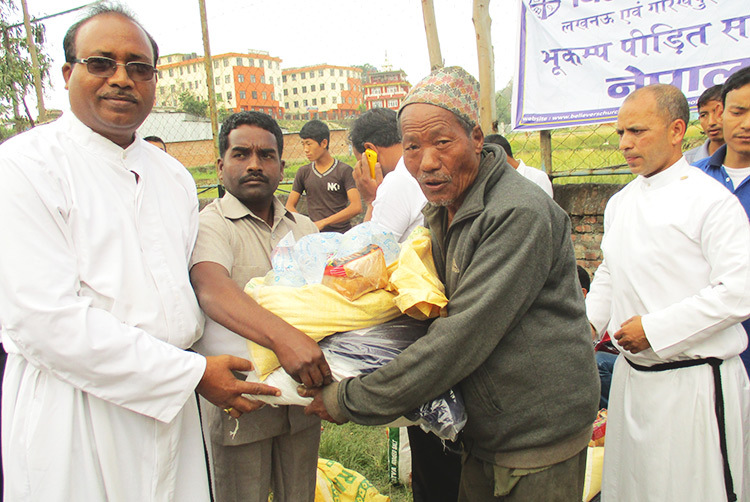 The team distributed rice, salt, legumes and clothes to the quake victims. 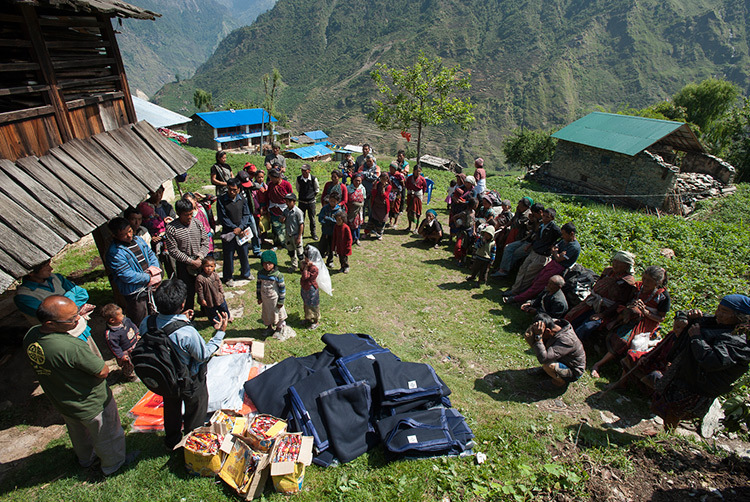 On May 28, a Compassion Services team flew to Sherpagaon, a village of approximately 150 people. 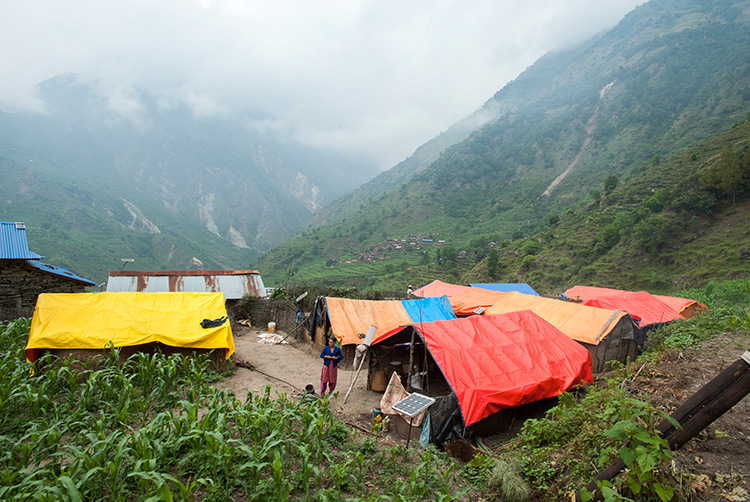 Sherpagaon lies near the Langtang Valley, where landslides caused by the earthquakes have killed hundreds of people. 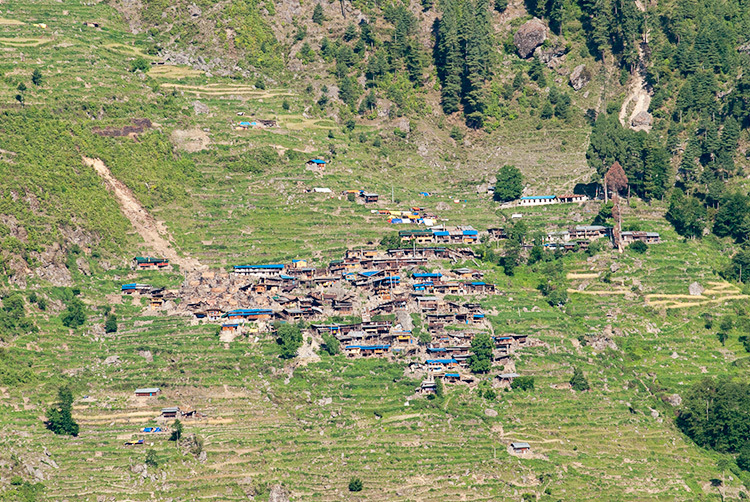 Sherpagaon is the nearest village to Langtang that has not been evacuated. The villagers had seen landslides mow down vast stretches of land and witnessed large rocks falling toward their village. 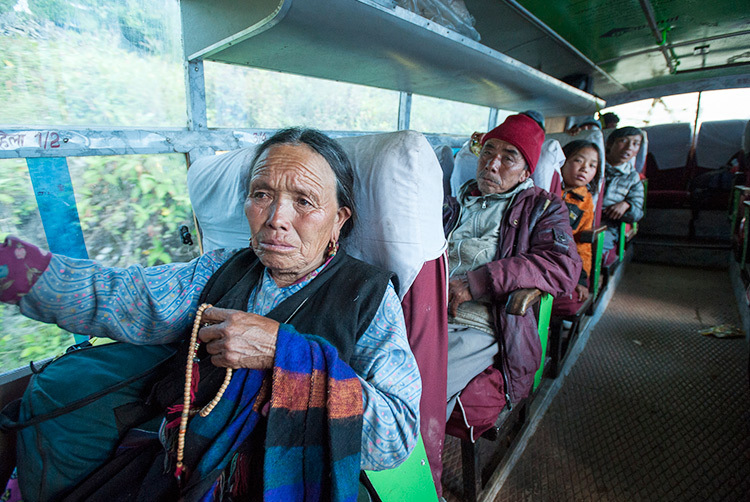 For several days, all the villagers had lived together in a tent, afraid falling rocks would kill them. 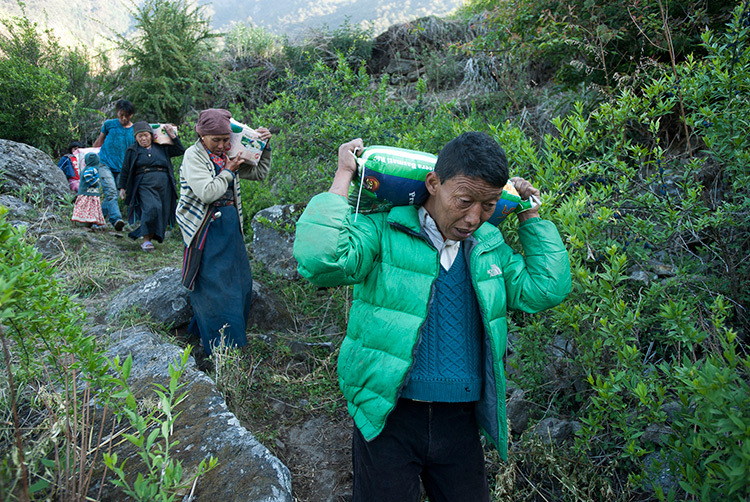 Although the people of Sherpagaon can walk five hours to another village for food and aid, the route is vulnerable to falling boulders, and the villagers consider the trek too risky. 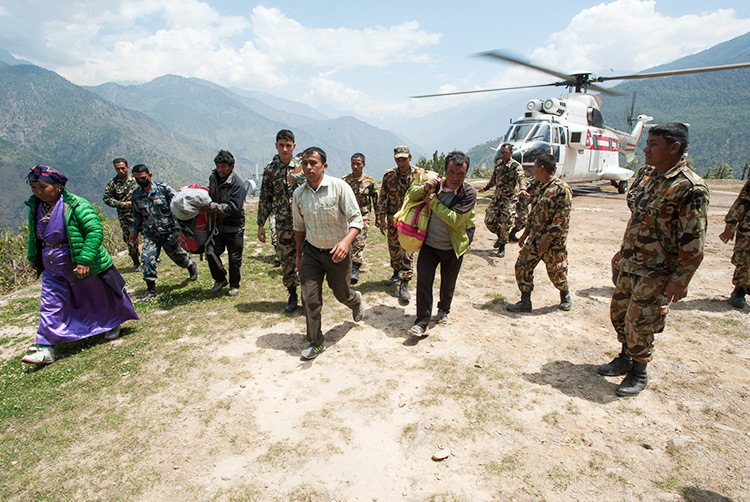 The Compassion Services team reached Sherpagaon via helicopter, taking two trips to bring relief supplies. 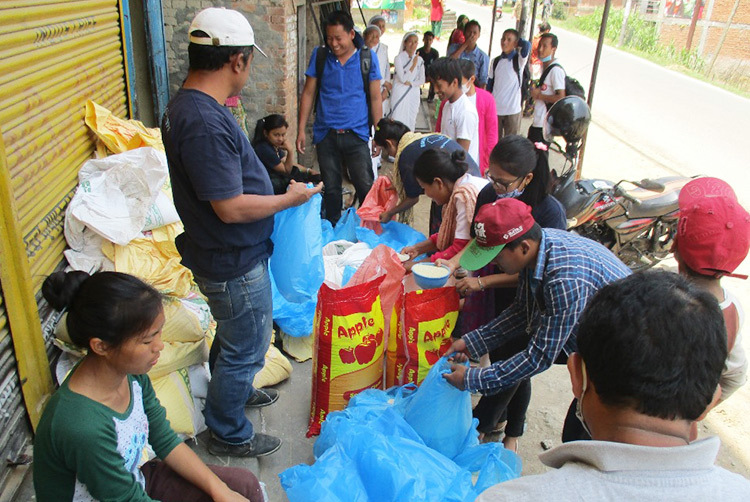 In total, the team distributed 1,100 pounds of rice, 220 pounds of dal, 88 pounds of salt, 120 packets of noodles, 30 bars of soap, 30 matchboxes, and cooking oil. 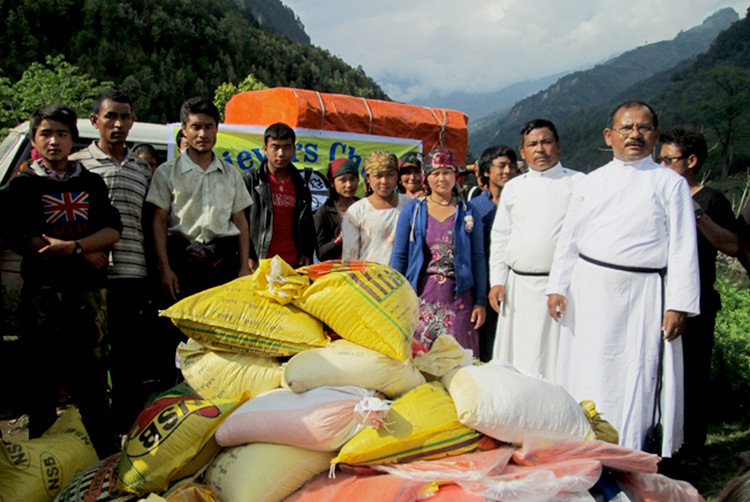 God to protect the earthquake victims as monsoon rains approach. 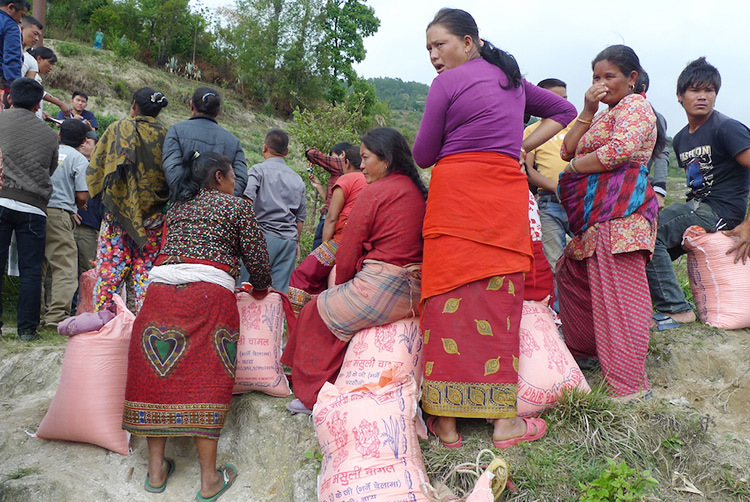 Remote villages that are still waiting for relief. 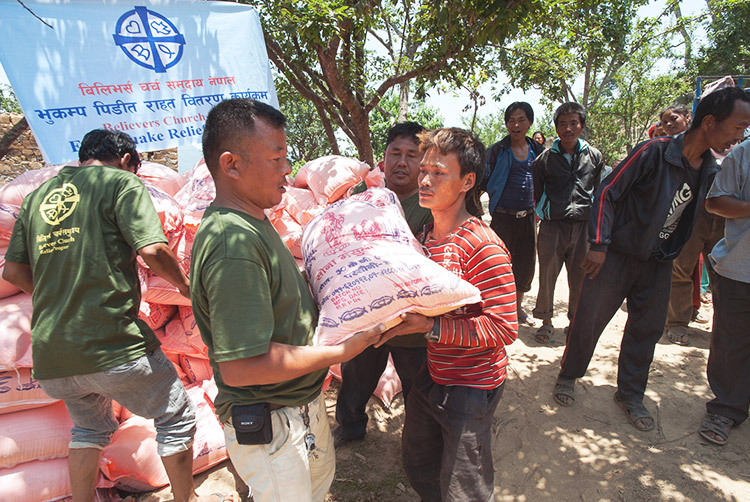 Relief teams to continue shining the light of Christ as they assist needy communities. 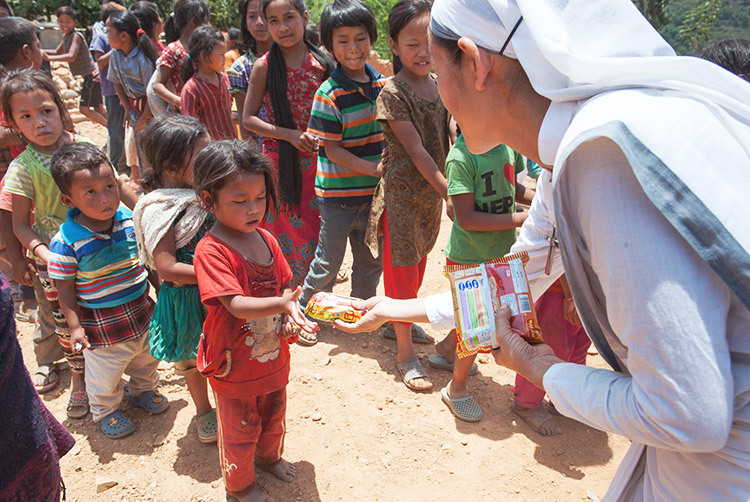 Relief recipients to understand Jesus loves them. 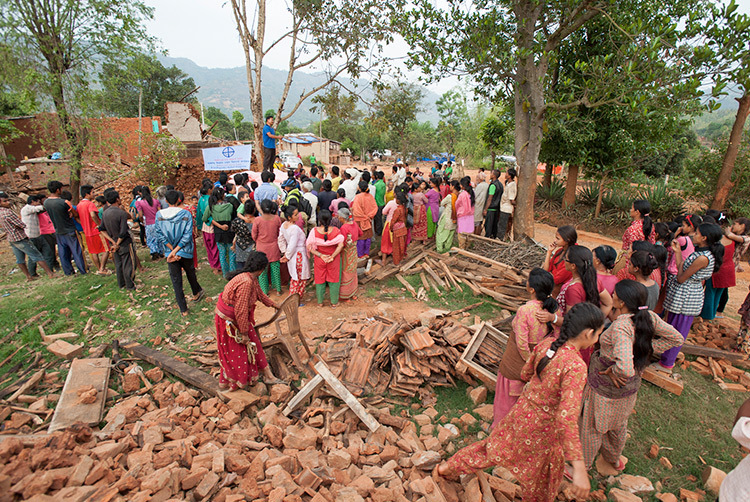 God’s grace to be evident as He helps the nation of Nepal rebuild. 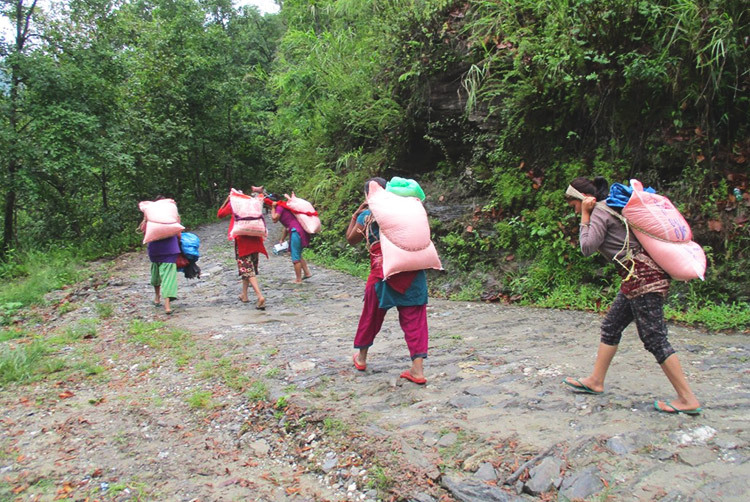 On May 19, a Compassion Services team traveled 12 hours to reach a cluster of approximately 10 villages, populated by more than 740 families, in the Ramechhap district. The team arrived at about 10 p.m., and the next morning, they delivered seven truckloads of relief materials, including 724 tarps, 1,100 pounds of salt, 500 blankets, 1,100 pounds of dal and 400 packets of cooking spices. 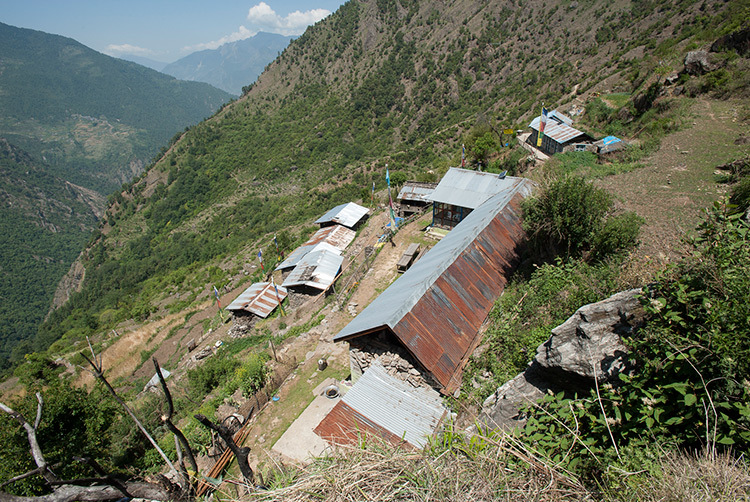 On May 21, the team flew to a remote village called Labdung. 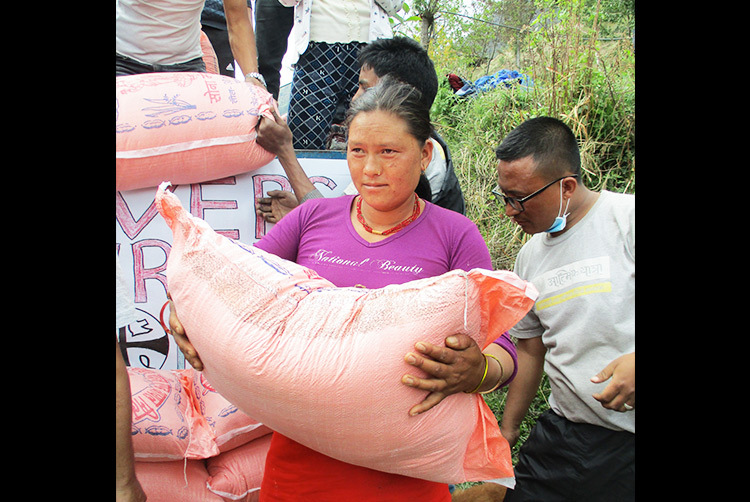 A pastor in the area had requested aid for villagers struggling without proper shelter or warm clothes, two necessities as monsoon season brings rain and cooler temperatures to an already ravaged nation. 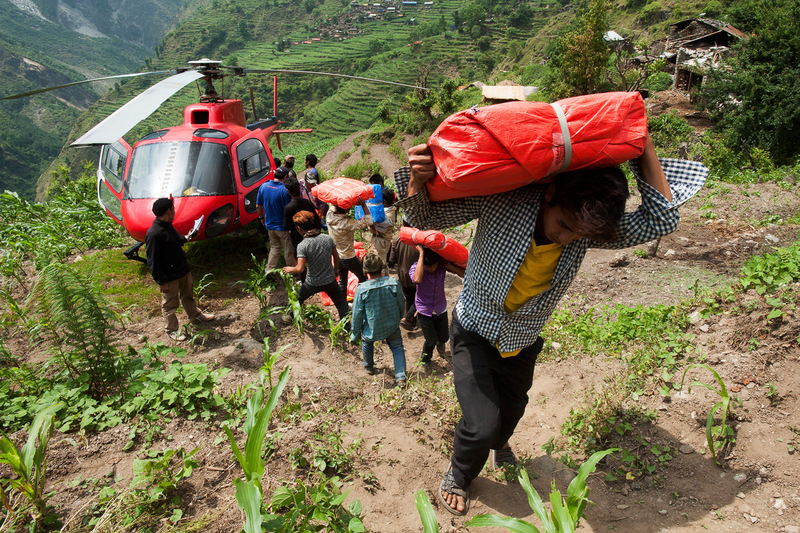 Normally, the village is three-and-a-half days’ walk from the nearest drivable road, but because landslides had wiped out some of the trails to Labdung, the team needed a helicopter. 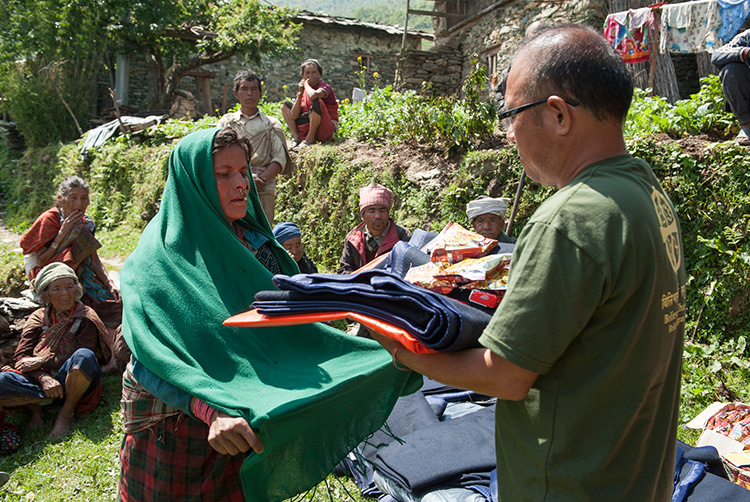 The Compassion Services team brought 75 blankets and 72 tarps to distribute among the villagers, in addition to 100 bars of soap and 144 packets of noodles. 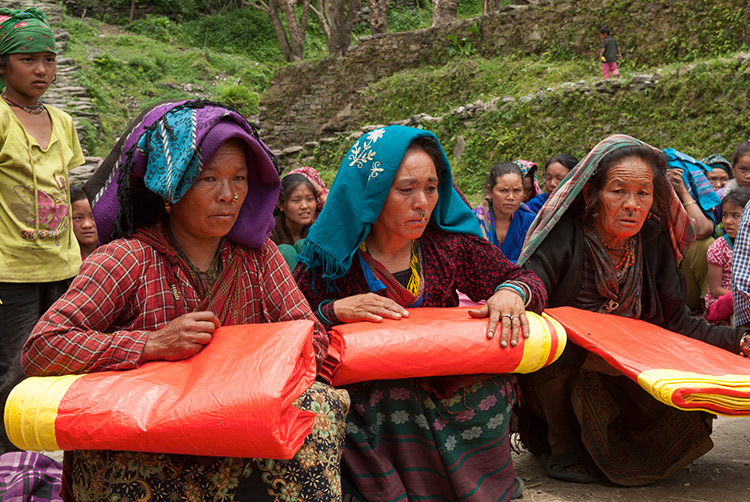 Tarana, a mother of five children between the ages of 2 and 16, received help, including a blanket, a tarp, soap and some noodles. 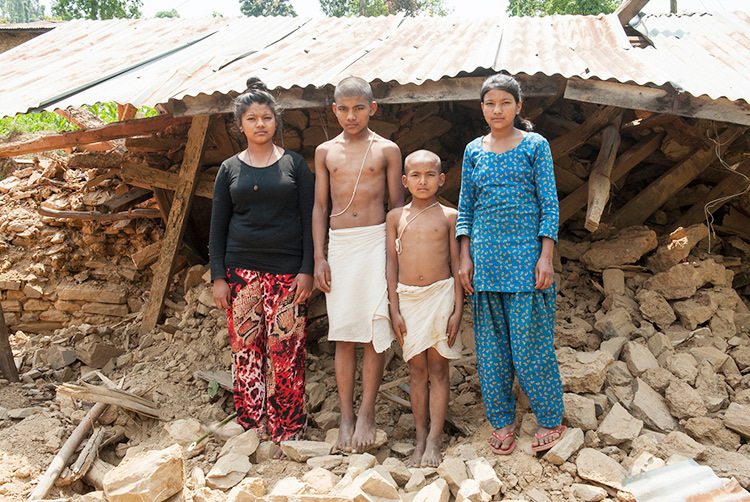 During the earthquake, Tarana’s husband had run into the family’s home to look for his children, not realizing they all were already outside the house. The house walls collapsed on him, killing him instantly. Tarana, now a widow in the wake of the sudden tragedy, expressed her gratitude for the help and compassion she received from the church. God to meet the emotional, spiritual and physical needs of those in Nepal, especially the widows and orphans. 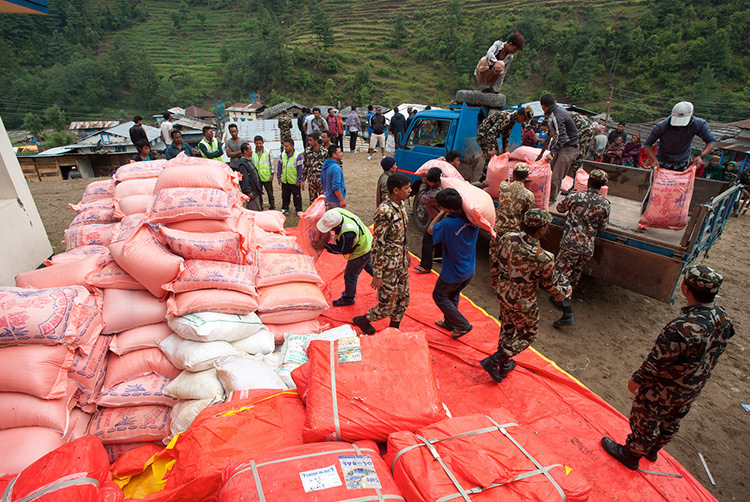 God to continue providing strength, endurance and supplies to relief workers. Many to understand Jesus loves them as they receive help. 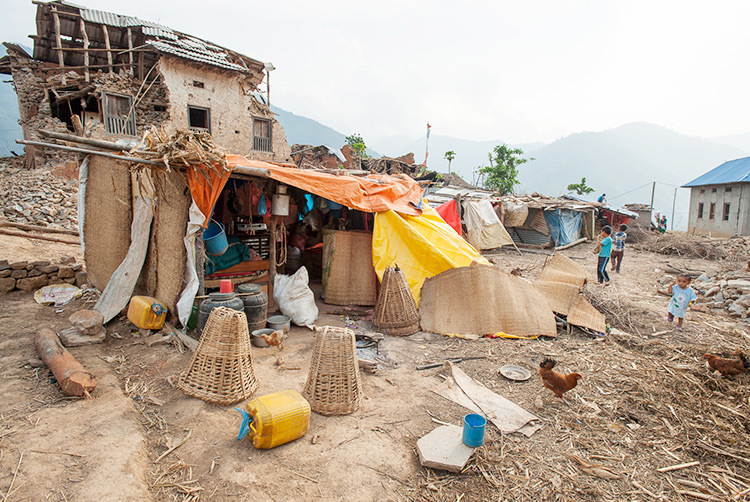 Protection for the hundreds of thousands of people in Nepal who are living in vulnerable conditions. 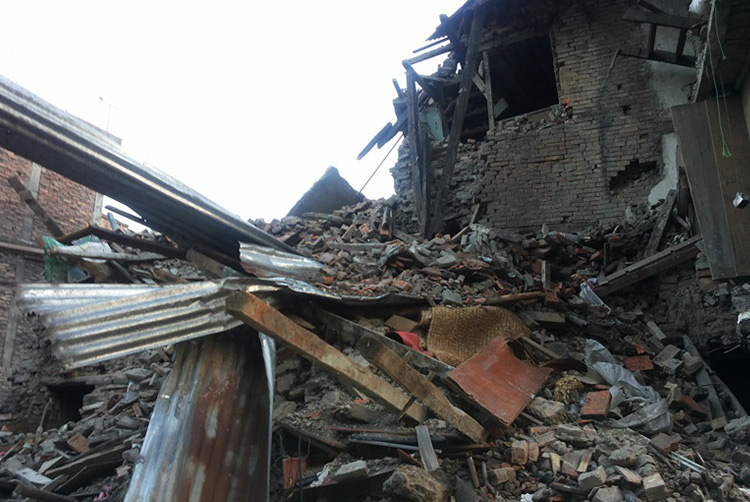 Nepal’s government recently confirmed that the death toll from the two earthquakes has exceeded 8,500, making these earthquakes the most deadly disaster ever to have hit the nation. Hundreds of thousands of people camp outside, having lost their homes and possessions. Many believers have experienced tragedy, too. 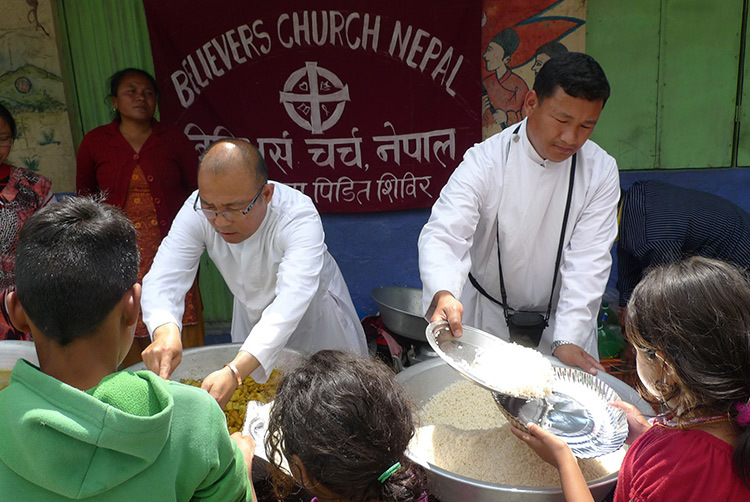 Gospel for Asia-supported pastor Bikas Gurung leads churches in two villages and fellowships in another three villages, and his congregations now face many struggles. 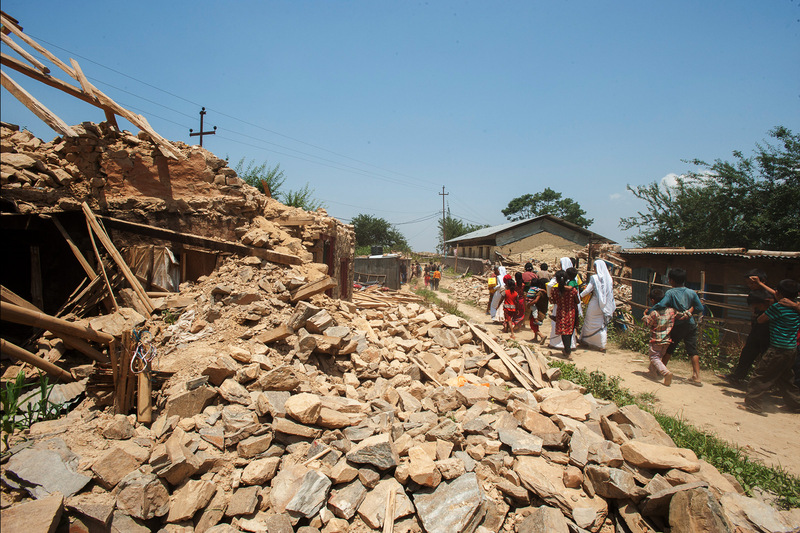 Many believers saw their homes destroyed or damaged beyond repair. 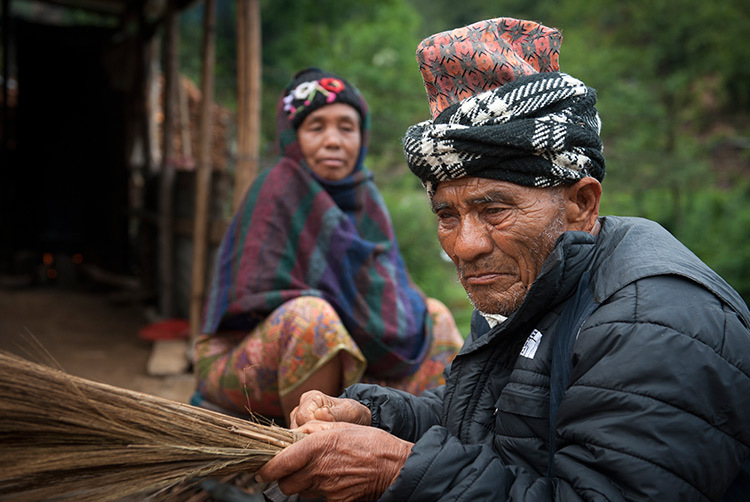 In two of the villages where Pastor Bikas serves, none of the believers have homes to return to. 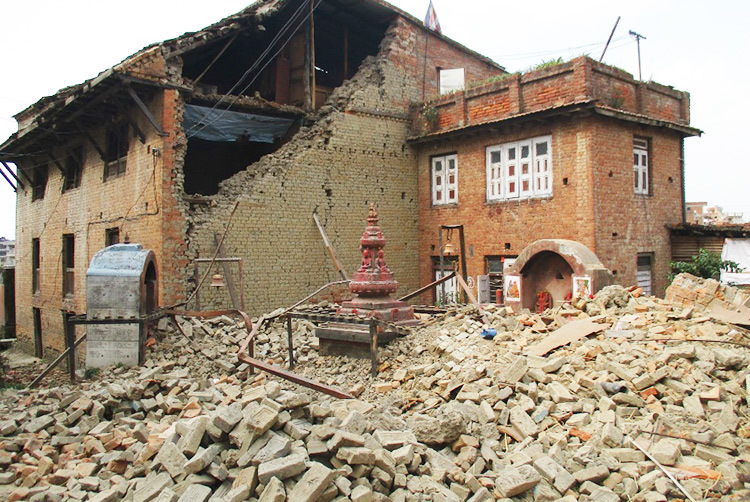 One church building was damaged to the brink of collapsing, and in another village, the home where the believers worship is about to fall down. As a result, the believers in these two congregations must worship outside. 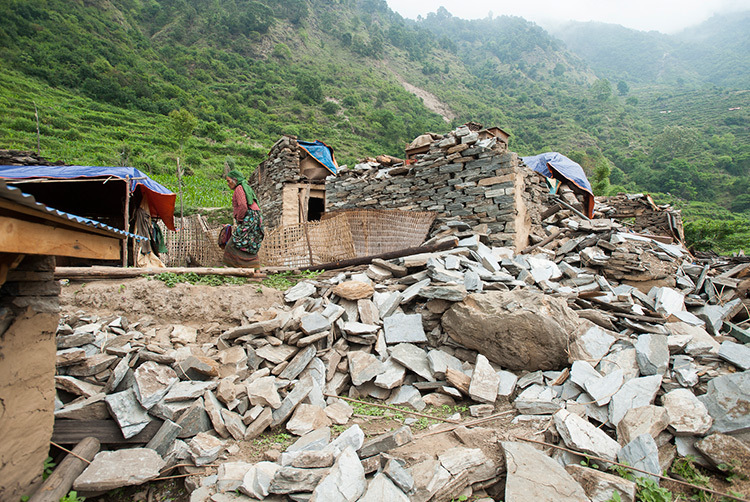 Some believers in these villages lost almost all their possessions, in addition to their homes. Comfort and hope for those continuing to grieve lost loved ones. 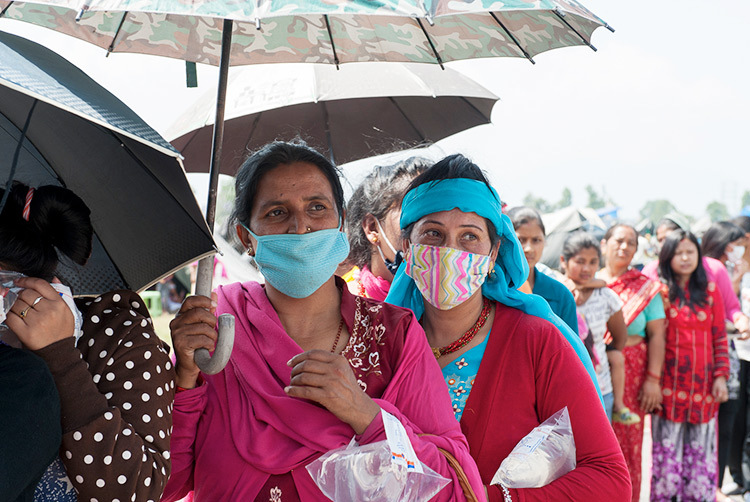 Protection for the people of Nepal from disease and the dangers that come from monsoon rains and potential landslides. God’s provision and sustenance for Compassion Services teams. 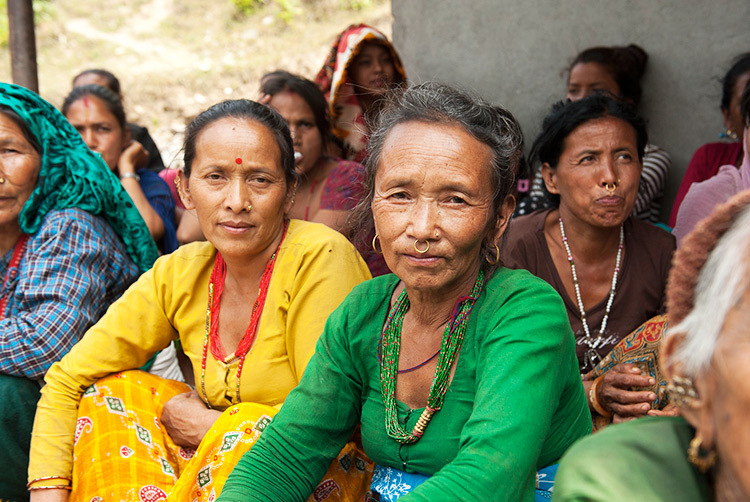 Relief recipients to understand that Jesus loves them. The Gospel for Asia Compassion Services team brought relief to Richet, a remote village that can normally be reached only by a three-day journey on foot. 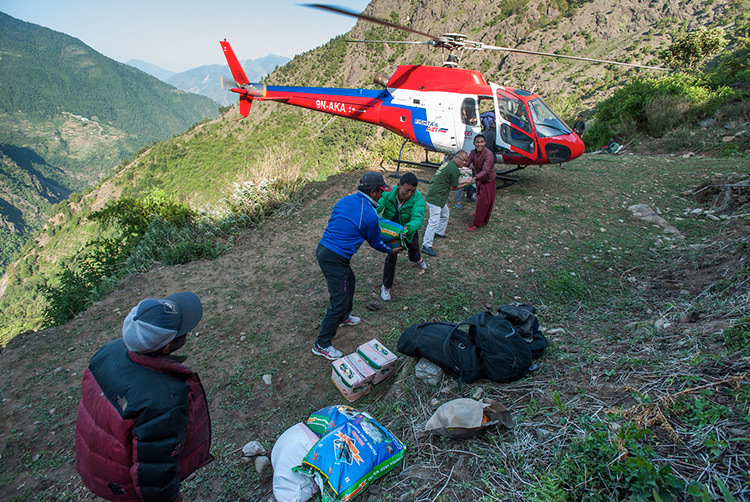 In the wake of the earthquake, the team had to travel by helicopter to get to Richet. 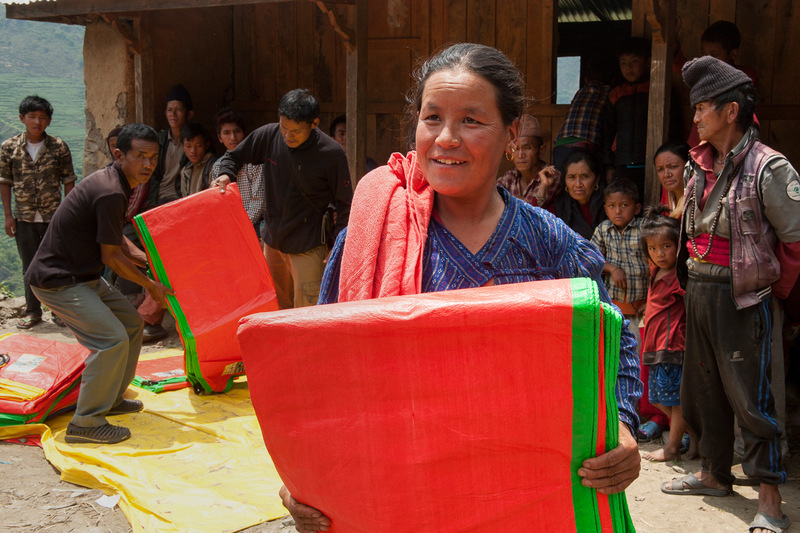 With two helicopter loads, they were able to bring 160 tarps, which the villagers had requested, for protection from the upcoming monsoon season. 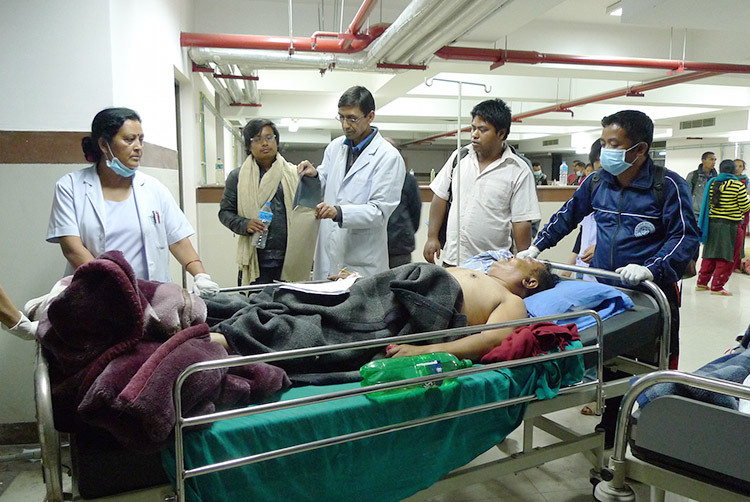 The earthquake killed four people from Richet and the neighboring village, Kapurgaon. 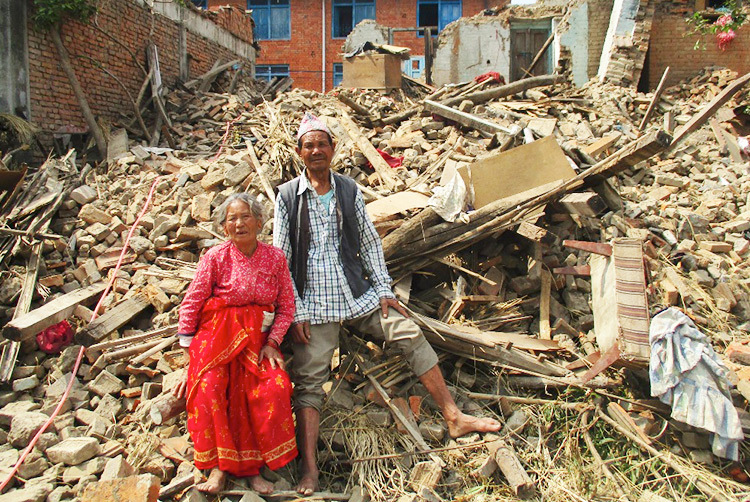 Both Bela Thapa and Bhumika Sherpa lost their husbands in the disaster. 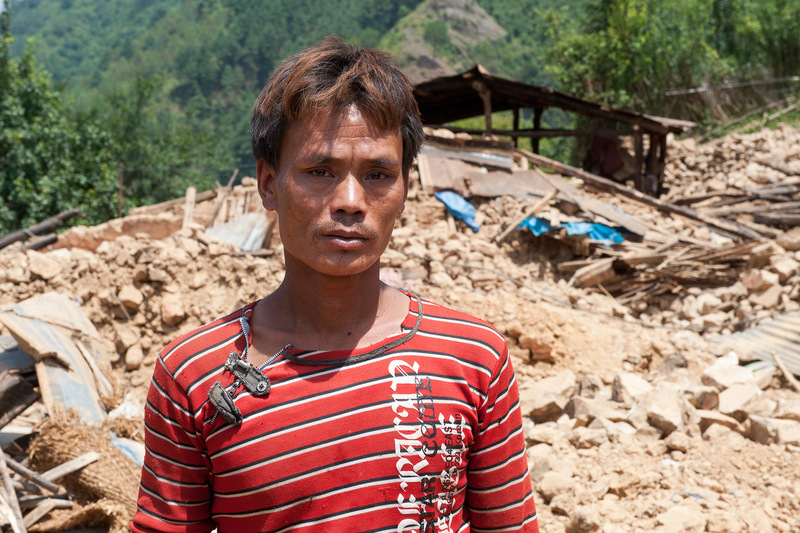 The two men were mining for gemstones in the forest when the earthquake hit. 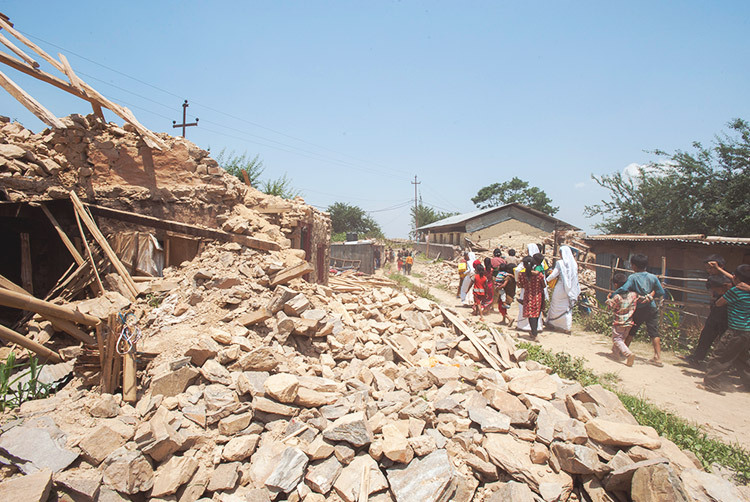 The disaster has left Bela and Bhumika as widows with two and five children, respectively, to care for alone. When Bela was asked how she would provide for her sons, she responded that her mind was blank; she could not think of anything. “I am not even able to distinguish night from day,” she said. 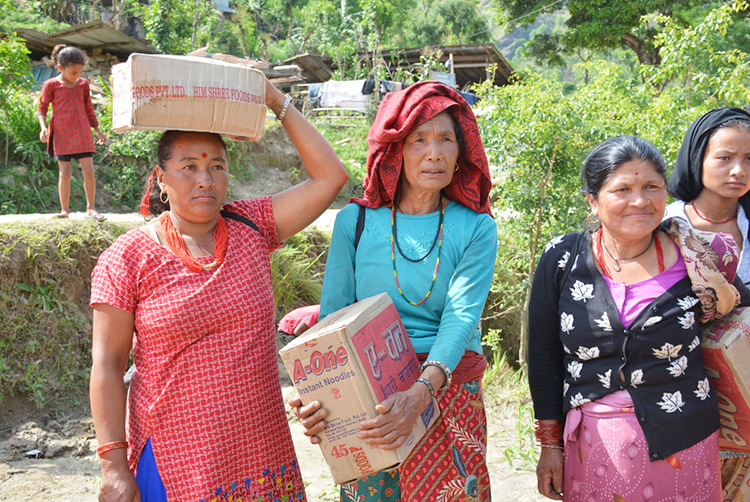 Drashtaa, an elderly widow, lost her only granddaughter, who was in the forest collecting firewood during the earthquake. The 16-year-old girl was Drashtaa’s only living close relative, and the two worked together doing domestic work to provide for themselves. Now Drashtaa is alone, and like Bela and Bhumika, she is dependent on the kindness of neighbors who are letting her stay in their tents. 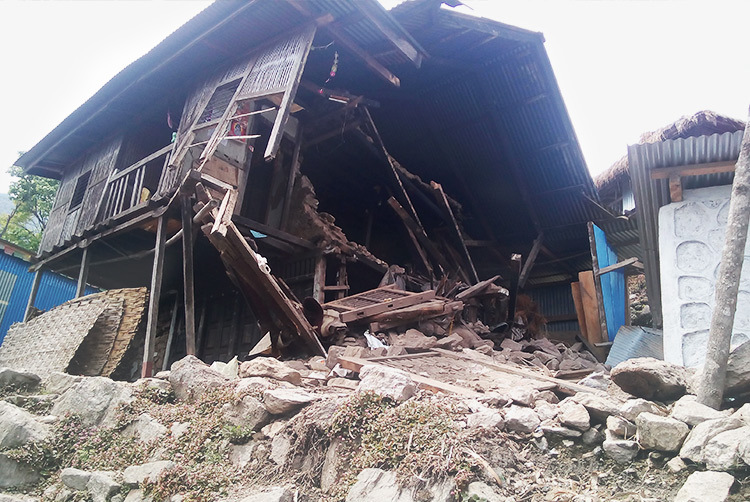 As they grieve their losses and struggle for survival, the villagers of Richet and Kapurgaon remain in danger of a landslide, as the second earthquake has caused the land to begin shifting. “The ladies said that they cannot go elsewhere since they do not have anything to start life with,” Raahi said. 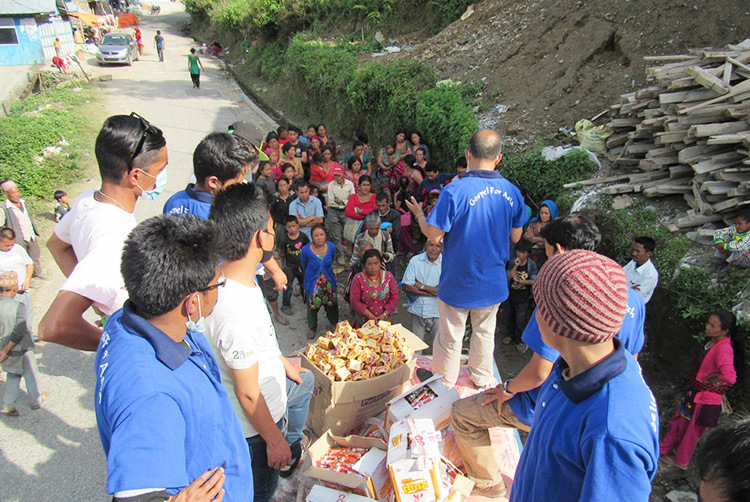 The Gospel for Asia Compassion Services team visited Ranipani, a village of more than 600 people, to distribute food. Approximately 80 percent of the village’s 150 houses were completely destroyed, and the rest of the homes are no longer inhabitable. The team gave out 125 bags of rice, 275 pounds of dal and 275 pounds of salt. 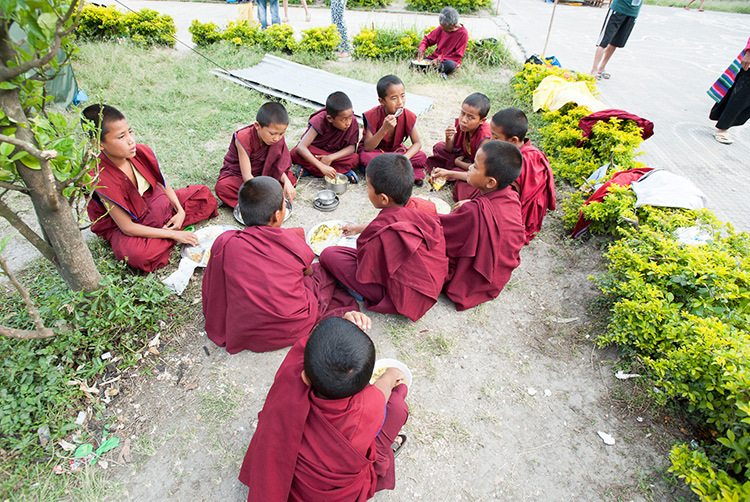 The villagers were so filled with gratitude that several people offered the team food. 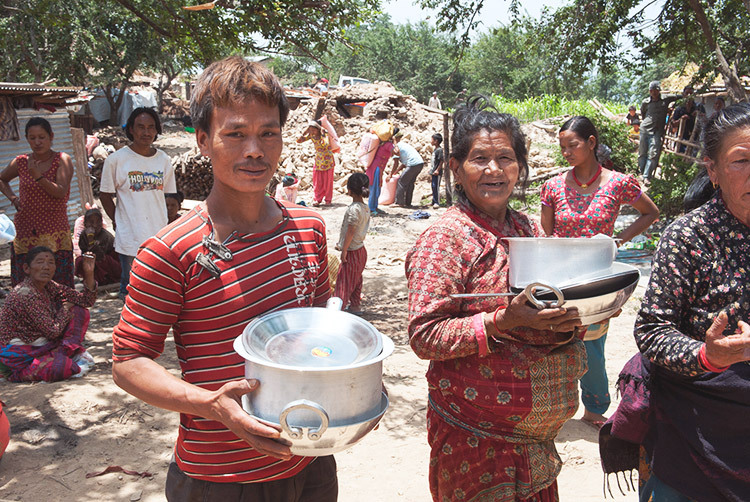 “Although we have a village but no houses, please come to our house and have dinner with us,” one woman said. 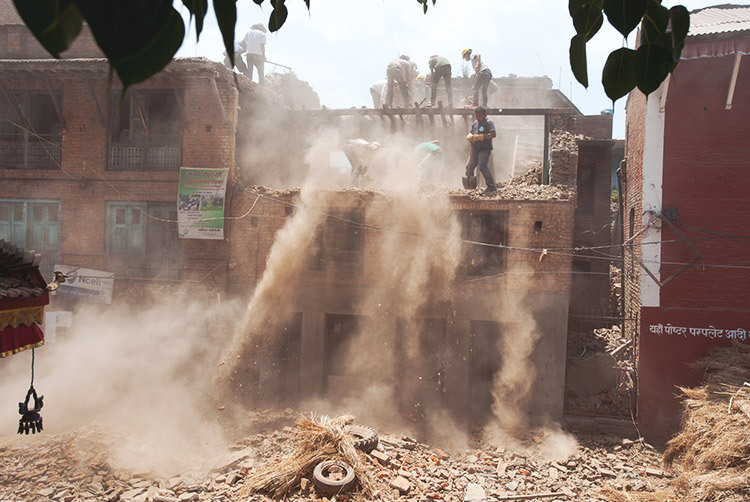 In the wake of two earthquakes and multiple aftershocks, the nation of Nepal is desperately struggling to rebuild. 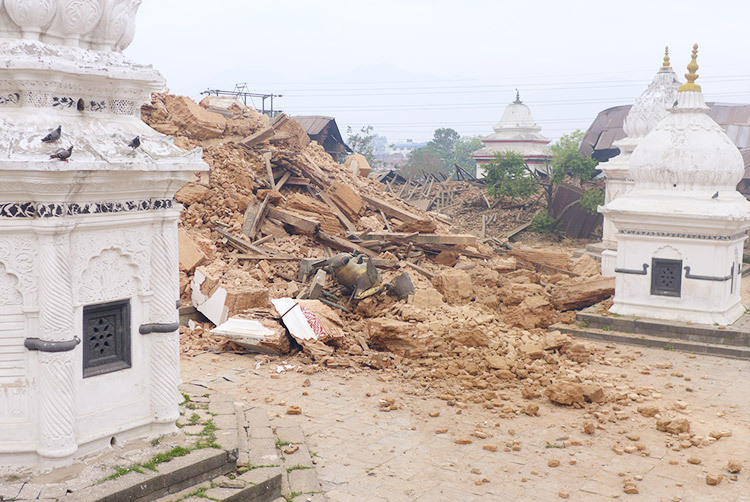 The 7.3-magnitude earthquake on May 12 has taken at least 90 lives, adding to the 8,000 lives the people of Nepal were still grieving after the first quake on April 25. Hundreds of thousands are seeking shelter in tents or under tarps because they lost homes or because they fear their houses will collapse. 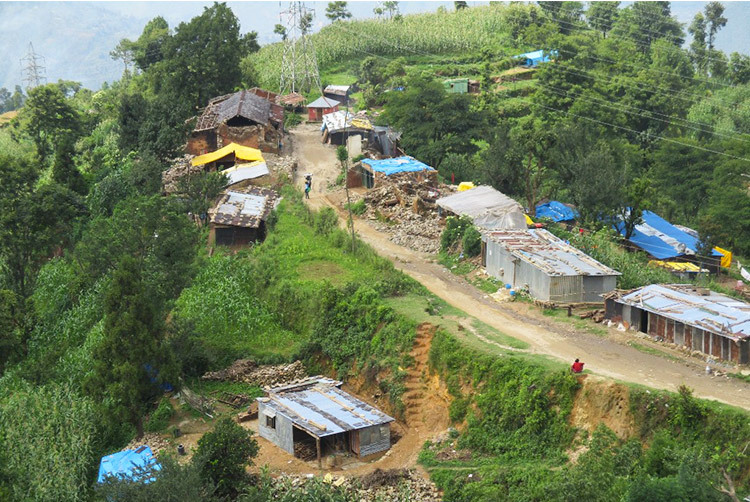 Many people, especially those living in rural villages located farther from main roads, still wait for help and have no access to adequate food or shelter. 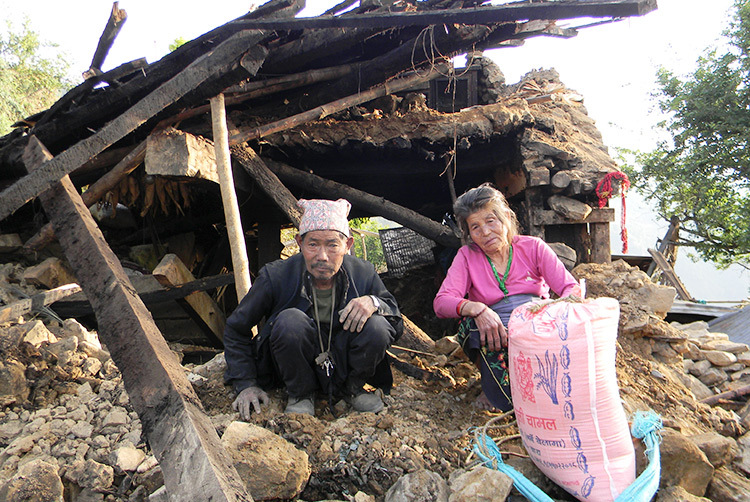 Some have witnessed every home in their village destroyed. 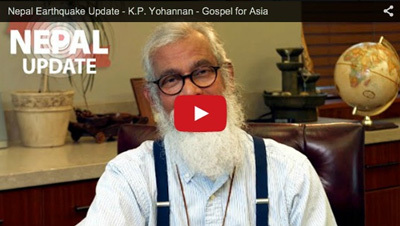 Gospel for Asia Compassion Services workers are continuing to bring relief to the needy, especially those in rural, hard-to-reach areas, that have not yet received aid. 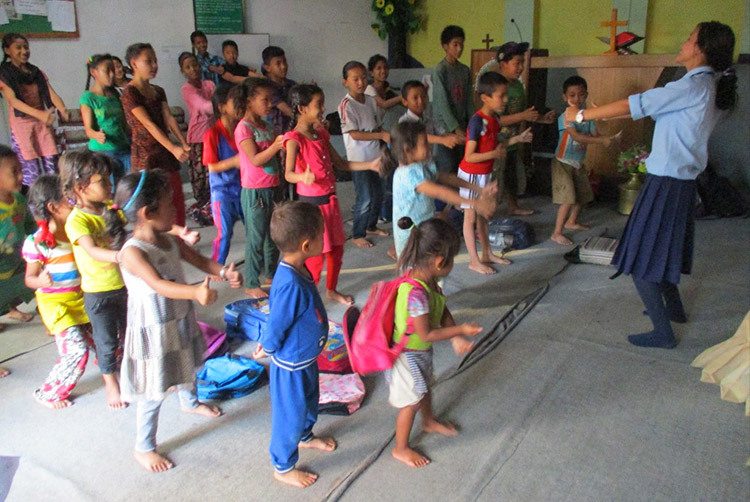 In many of these villages, believers who attend fellowships led by Gospel for Asia-supported pastors are suffering, too: Some have lost homes and no longer have a place to meet to worship. 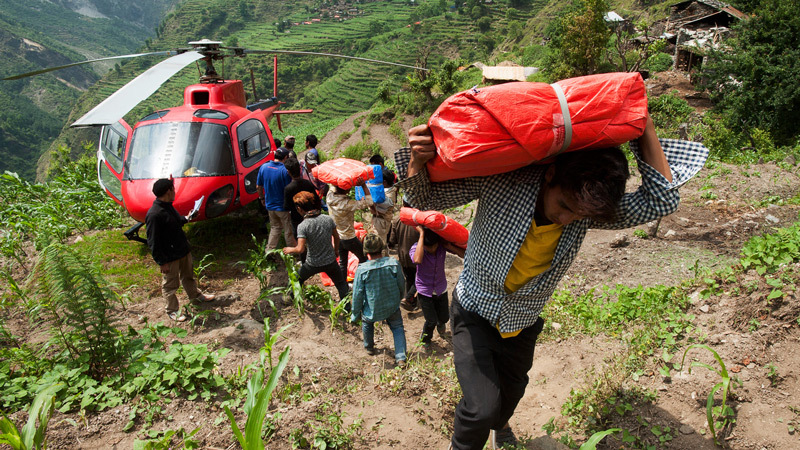 Despite this, believers and pastors have assisted Compassion Services teams as they provide aid. 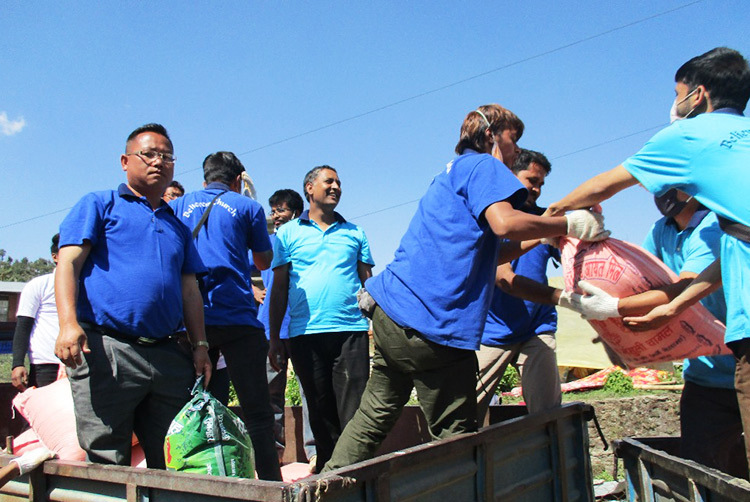 At many of the relief events, the teams have enjoyed the assistance of local police personnel, who have escorted vehicles carrying relief materials because looting has become a very serious threat. 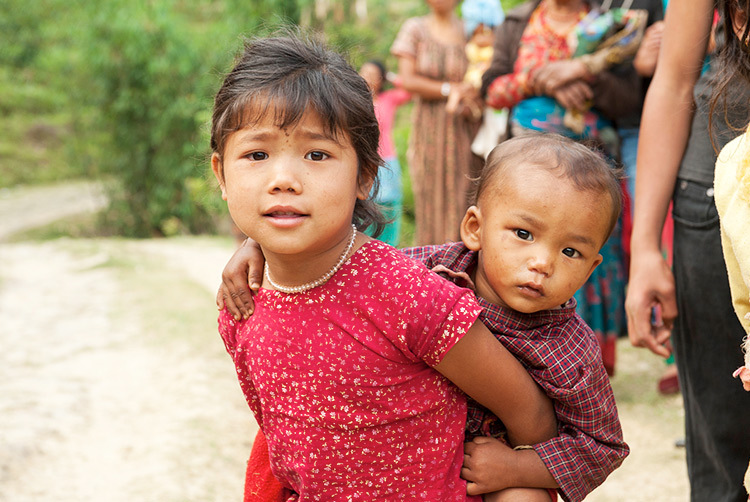 God to enable Compassion Services teams to reach every needy village with His love and help. Provision for those who are lacking food, clean water or shelter. Comfort for those grieving the loss of loved ones, homes or livelihoods. 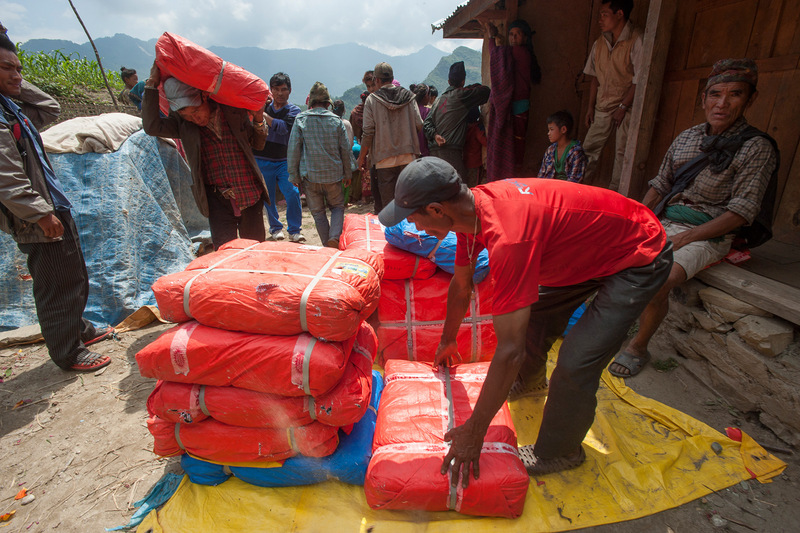 Protection for relief teams and all the people of Nepal. Many to understand the love of Jesus and find His peace during this time. 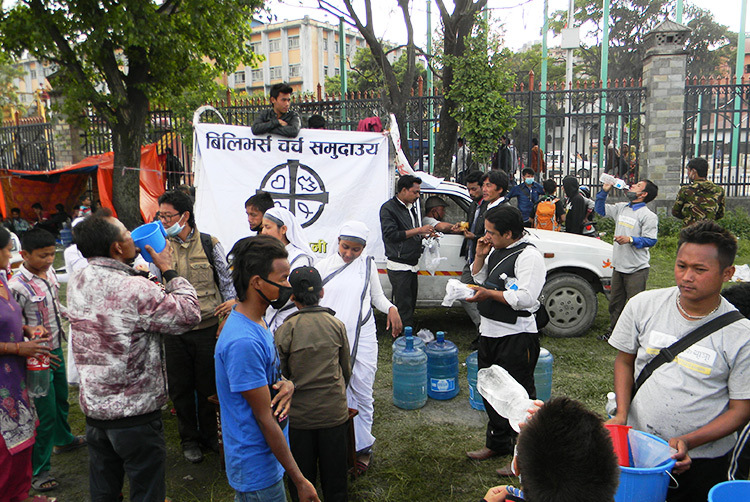 A Compassion Services team distributed drinking water to people in downtown Kathmandu, as there was an increase in the need for relief following the 7.3-magnitude earthquake on May 12. 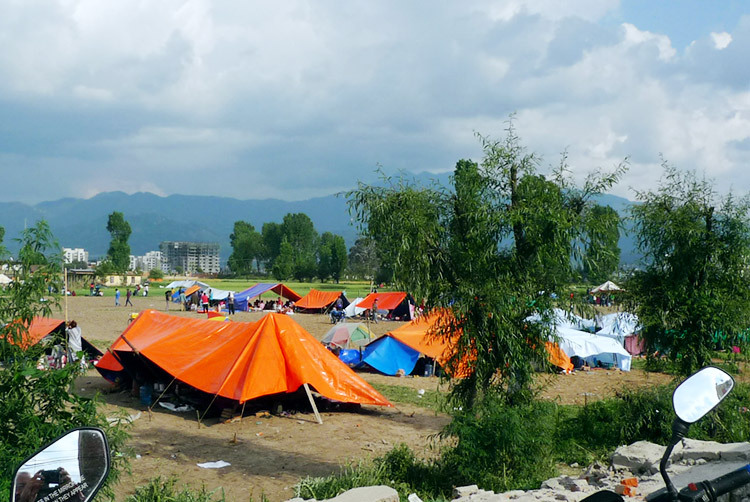 “Still there are many without tents and proper facilities,” Raahi shared. 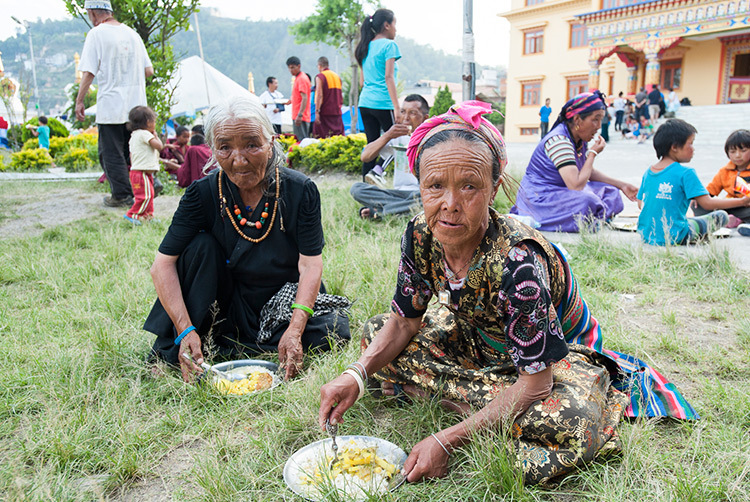 The Gospel for Asia Compassion Services team also provided food to displaced persons who had been evacuated from Langtang Valley, where earthquake-triggered avalanches had killed hundreds of people. 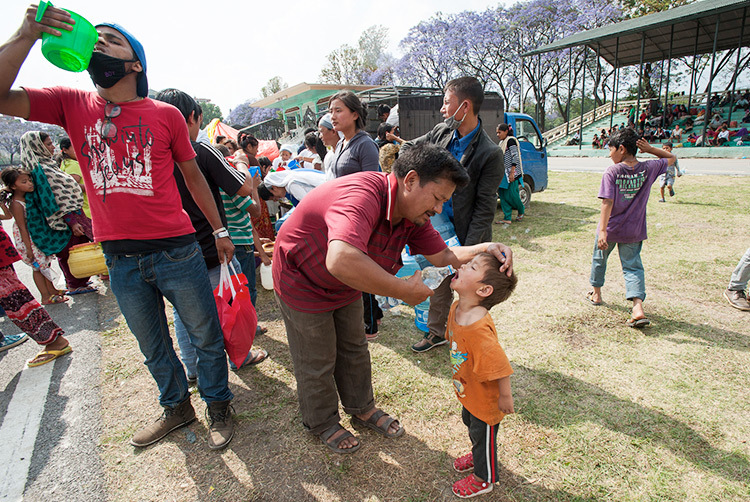 Days before, Gospel for Asia had arranged for buses to transport more than 200 of these displaced people to shelter in Kathmandu. The Compassion Services team provided 70 66-pound bags of rice, 2 bags of dal, 13 gallons of cooking oil and 2 large cooking vessels for the struggling group of people. 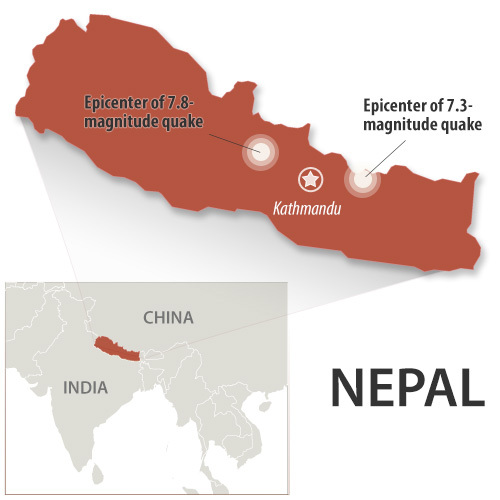 Another earthquake, reaching 7.3 magnitude on the Richter scale, shook an already devastated Nepal on May 12—only 17 days after a 7.8-magnitude earthquake killed more than 8,000 people and left nearly 18,000 injured. 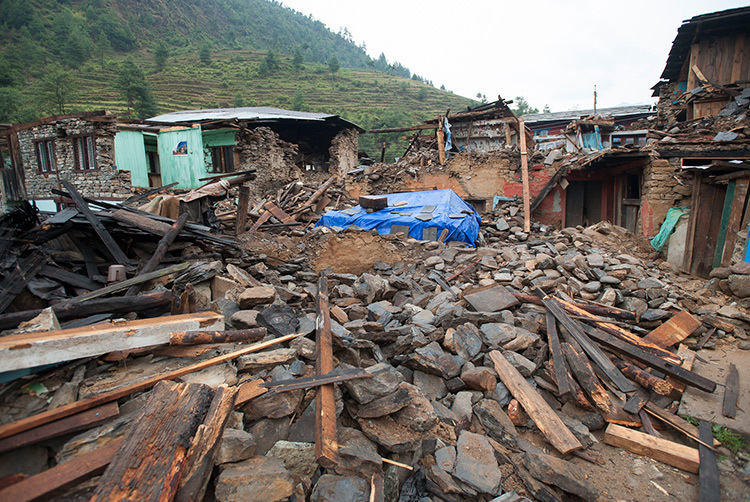 Since April 25, the people of Nepal have suffered aftershock after aftershock. Approximately 100 of them, ranging from 3.3 to 6.7 in magnitude, have kept people living in tents or outdoors, fearing their homes or more buildings will collapse with them inside. 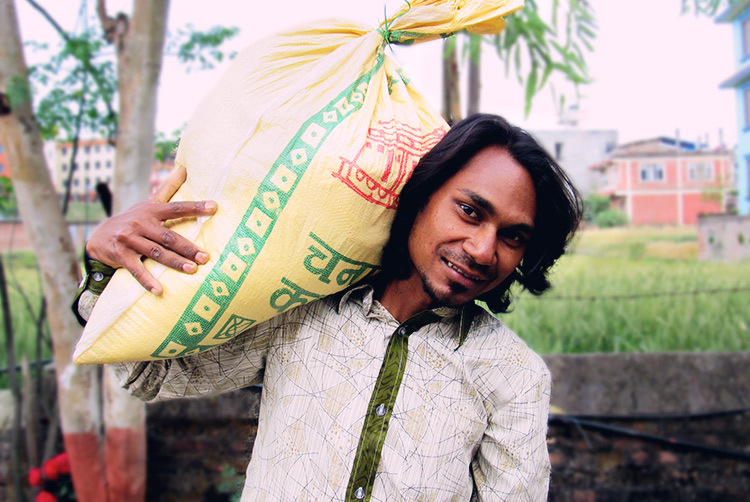 Raahi, a Gospel for Asia-supported photojournalist, was in Nepal helping with relief work when the latest earthquake struck. 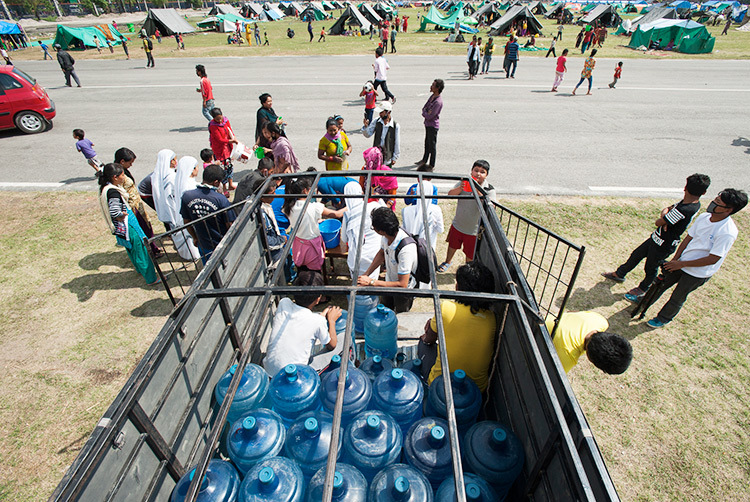 “We were on our way to deliver some relief supplies to a more rural area,” he said. 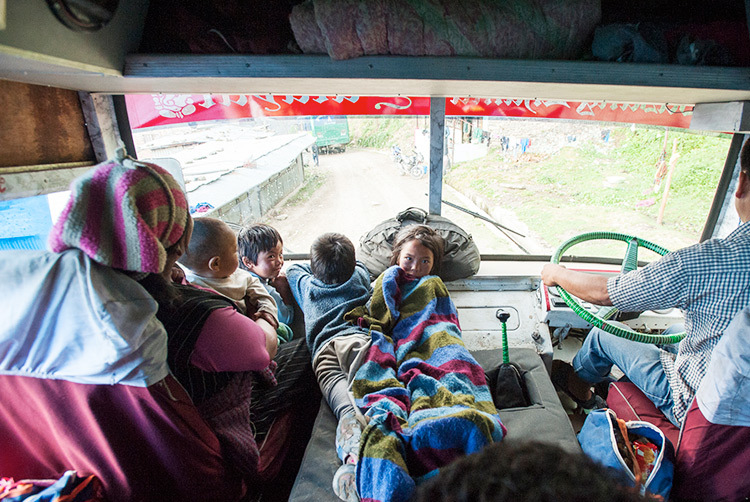 “We had stopped for a rest, and just as we were getting out of the car, we heard screaming. I said, ‘It’s another earthquake. Run!’ We all ran to the first open space we could find and stayed there until it stopped. People were screaming and crying. 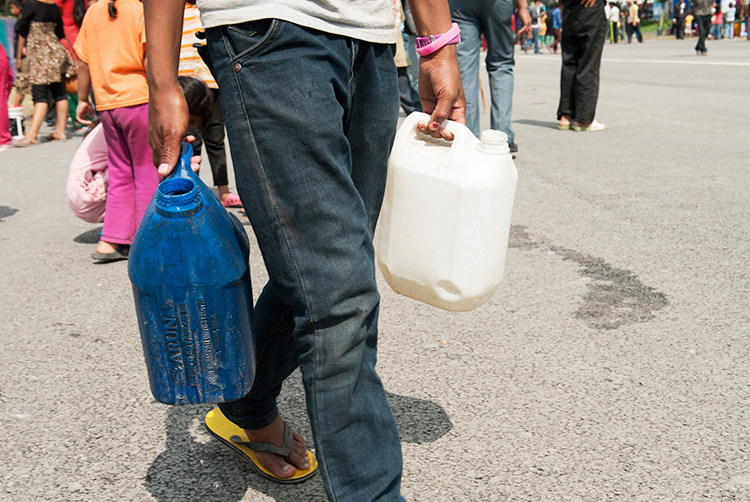 “Kathmandu now looks like a ghost town, with only 25 percent of the shops remaining open. People are afraid to enter any buildings. Restaurants are mostly closed. 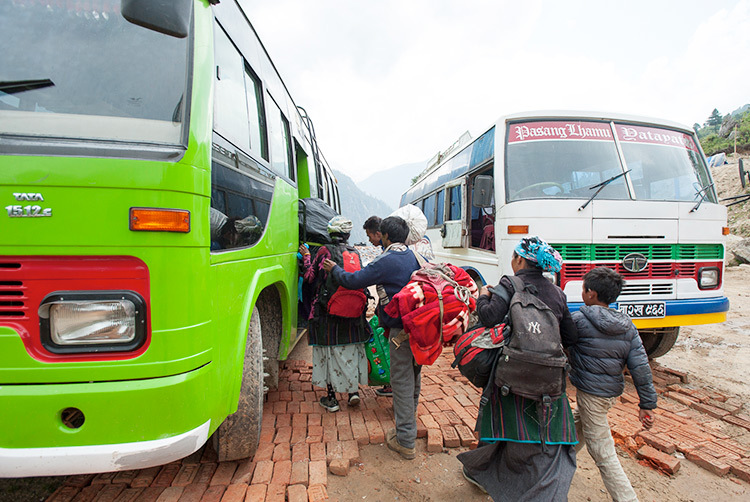 Many have stopped coming into Kathmandu to work. They are too afraid. News sources indicate that at least 40 people have died and more than 1,000 people suffered injuries because of the 7.3 aftershock. Landslides have been reported in the Langtang region of the Himalayas as well as in Tibet, which have killed one person and injured three others. 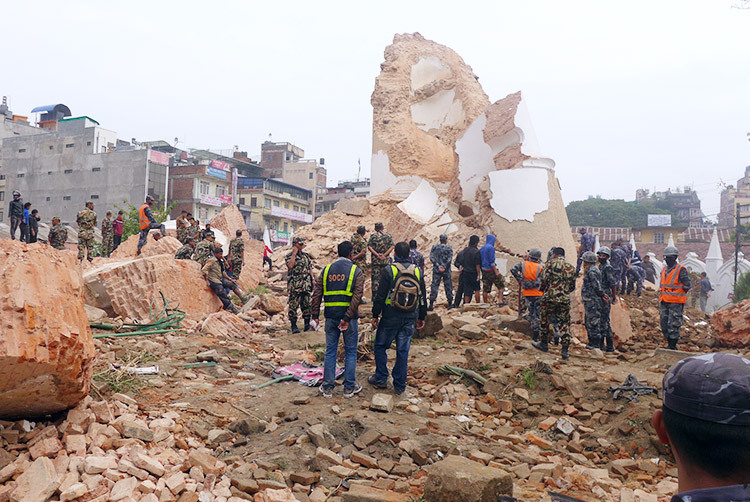 The government of Nepal sent out national search and rescue teams and asked the international teams that still remain in the country to help with their efforts. 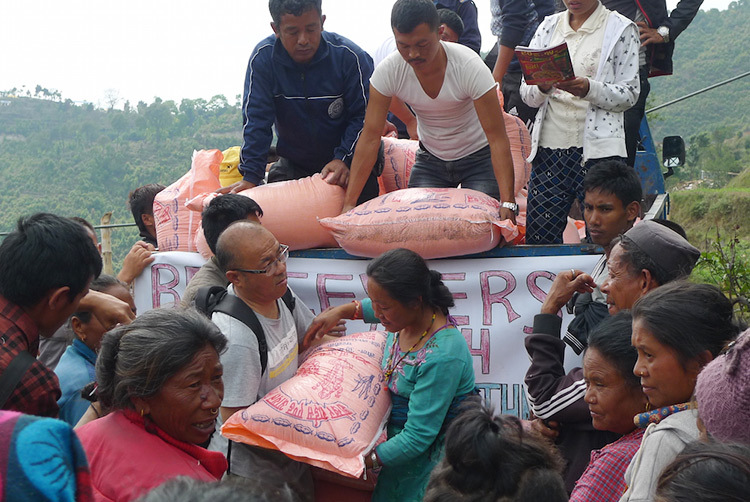 Gospel for Asia Compassion Services teams have been constant in bringing food and shelter to villagers in need of relief. They plan to continue their efforts as well as minister to survivors. 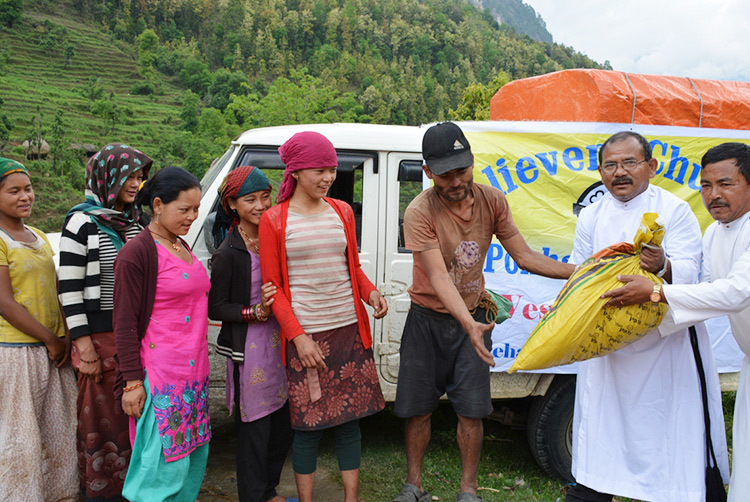 When Compassion Services workers went to a village in the Rasuwa district to provide 100 bags of rice, they met 74 people who had been evacuated by helicopter from Langtang due to the landslides and avalanche there. 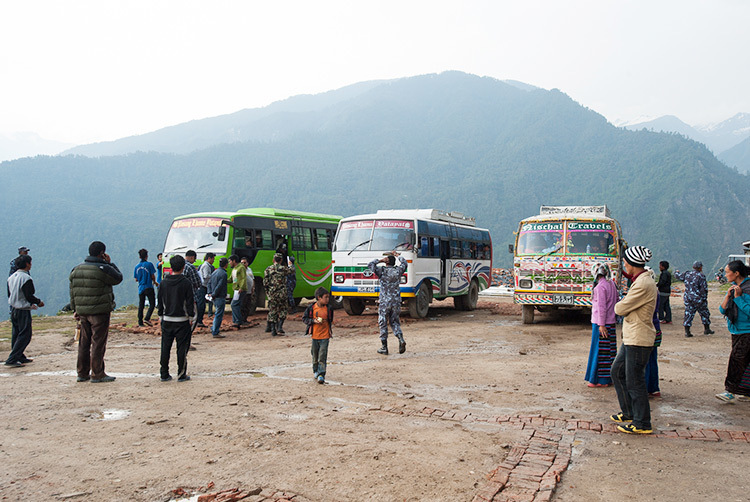 After talking with this group of people and learning about their need for transportation to Kathmandu, the Compassion Services team provided them with food and water and arranged for three buses to drive them to the capital. 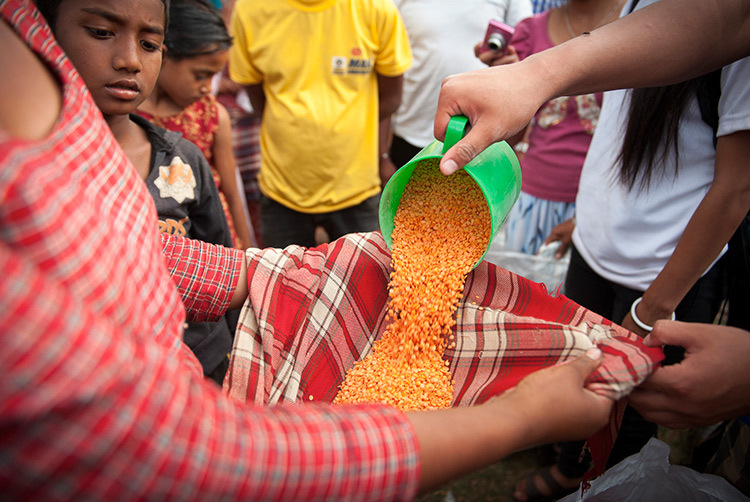 A Gospel for Asia Compassion Services team provided more than 1,800 pounds of rice to 165 families in Sana Gaun Village, where 11 people had been killed and 19 people had been wounded. 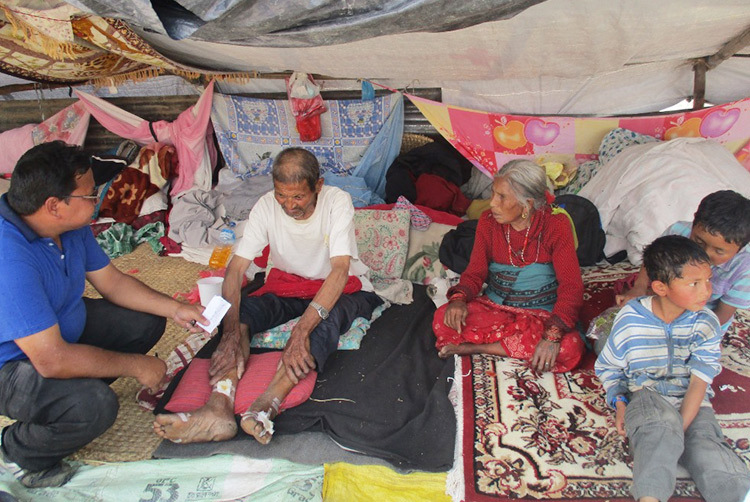 During the relief, the Compassion Services workers met Gayan, 85, who lives with his son, who is handicapped, and daughter-in-law. 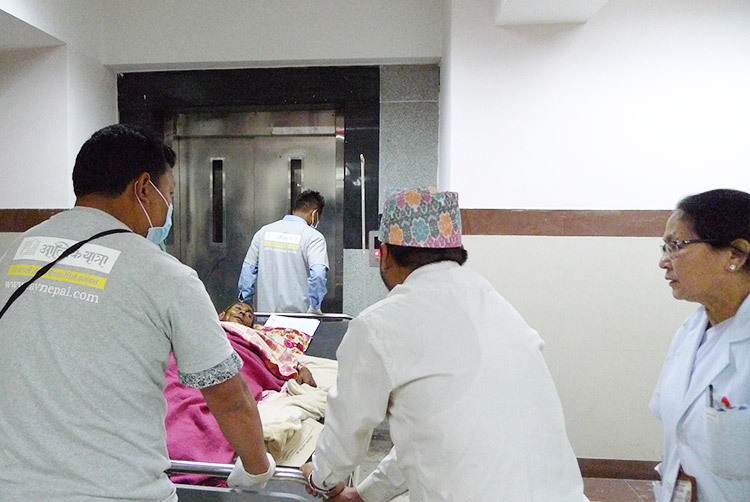 Gayan’s daughter-in-law, the only breadwinner for the family, had been hospitalized due to injuries from the earthquake. 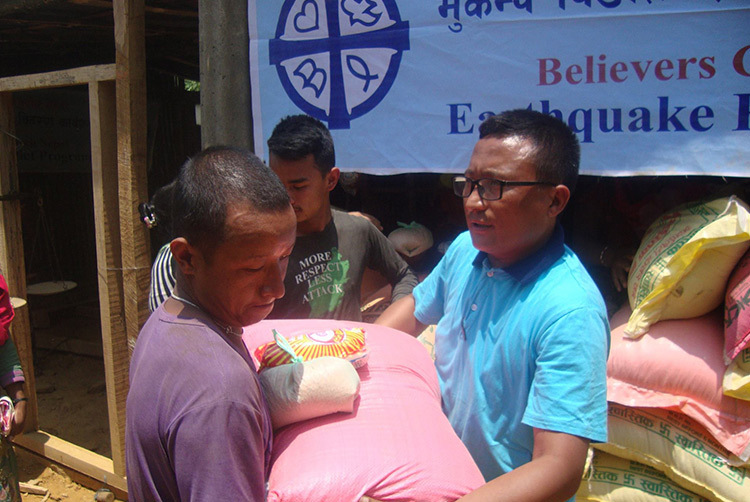 Elsewhere, in Dandakhet Village, another Compassion Services team provided 20 sacks of rice, 35 blankets and 15 tents to quake victims. 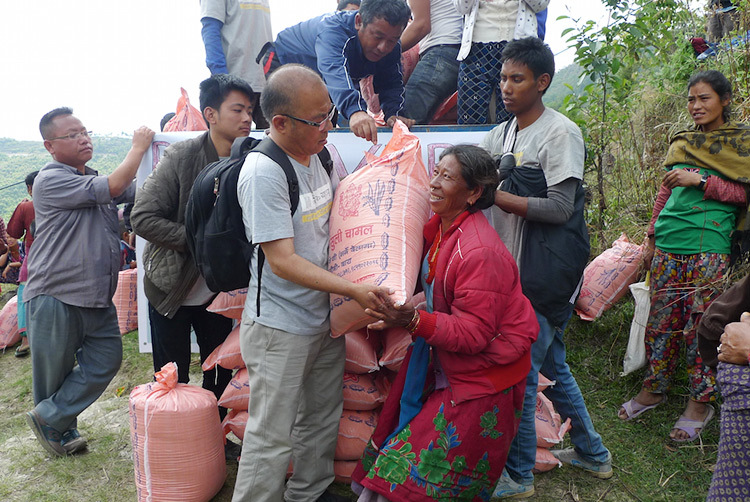 At a school building in a town called Mamti, people from several villages gathered as a Compassion Services team distributed rice, salt and tarps, helping 240 families. 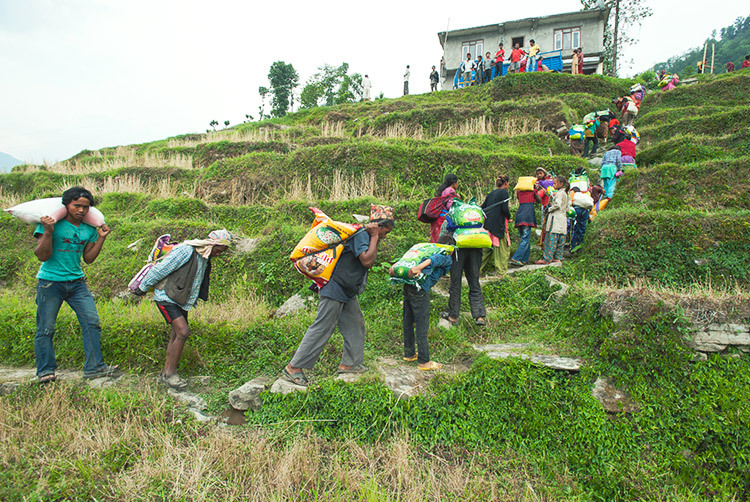 After the relief program, some of the workers walked to Tham, one of the villages where people had traveled from to get aid. 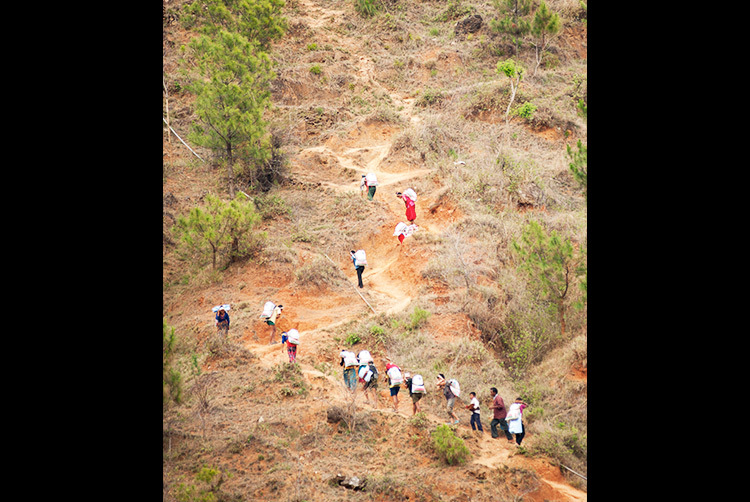 “It took over an hour to climb the uphill [route], which was a very tiresome and difficult uphill walk,” Raahi shared. 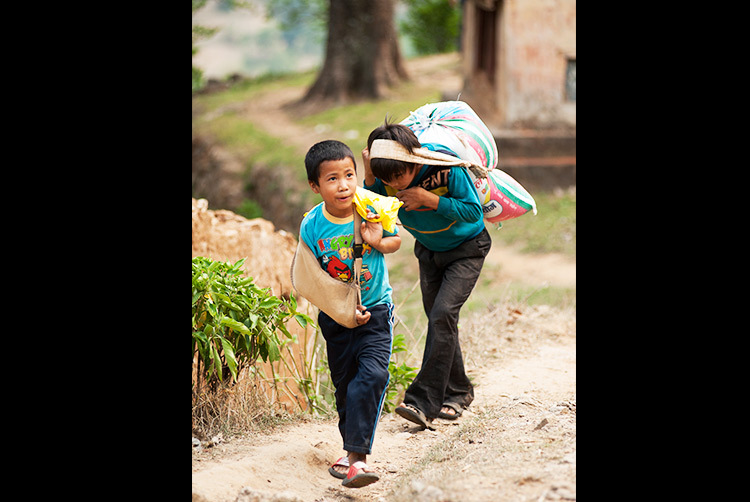 “But I was surprised to see children as young as 10 to 12 carry 30 kilograms of rice and cross the river on foot and then climb the hills. 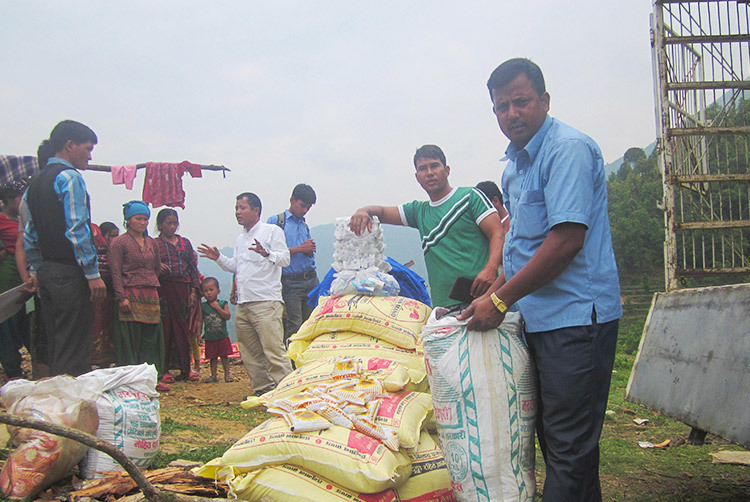 A Compassion Services team distributed food and aid in Adhimara, a remote village located miles away from the nearest highway. 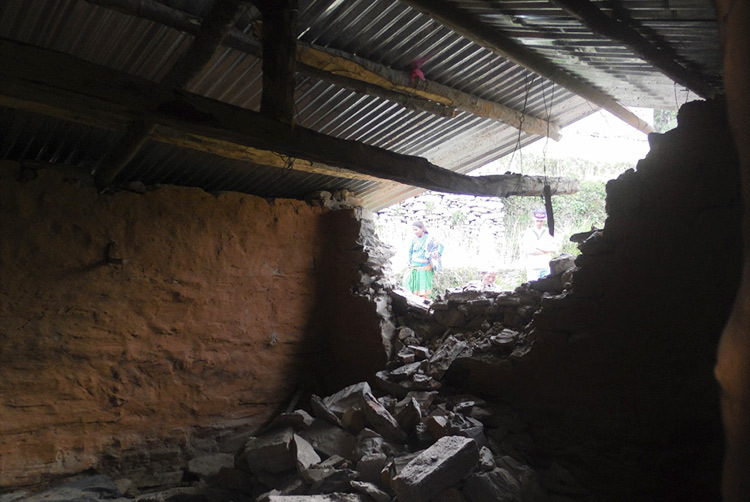 Following the earthquake, several people had died, and all of Adhimara’s 74 houses had collapsed, leaving the villagers exposed to wild animal attacks. 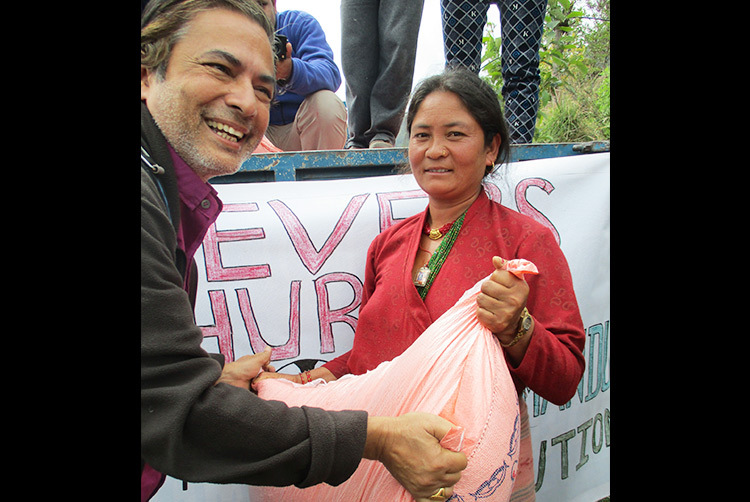 The Compassion Services team provided rice, dal, salt, noodles, cooking oil, bath soap, cooking vessels, tarps, blankets and match boxes. 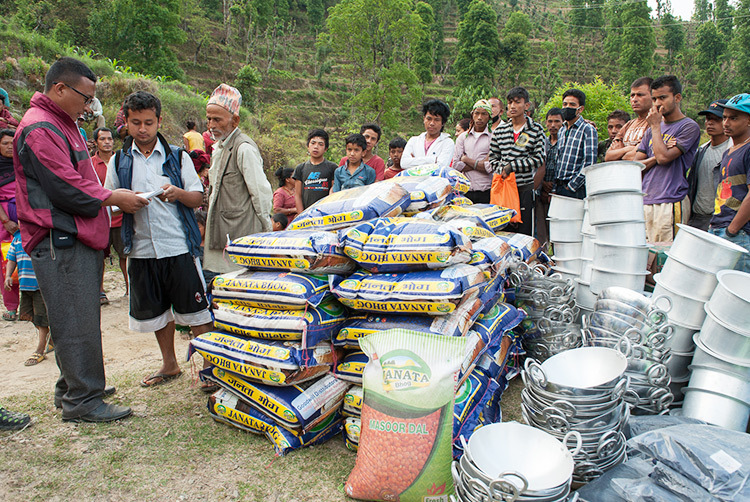 “It was the largest relief aid that the villagers ever received since the earthquake,” shared Raahi. 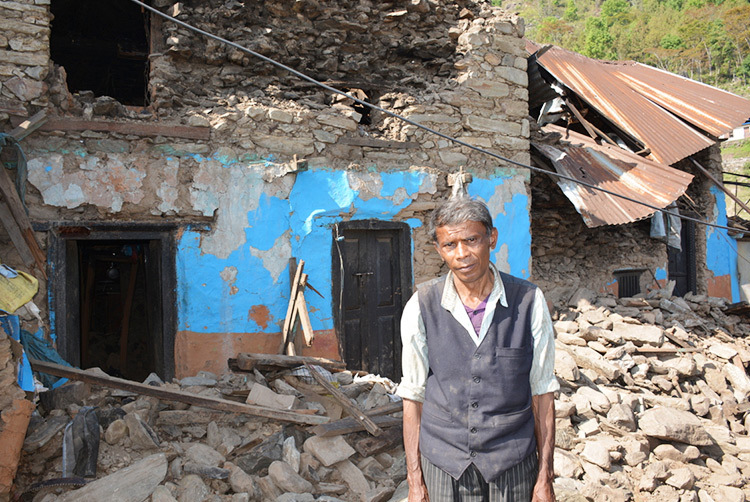 One man in the village, Kaanan, lost his wife, son, daughter and a niece when his house collapsed. Raahi also met Samita, a young woman whose father died in the earthquake. 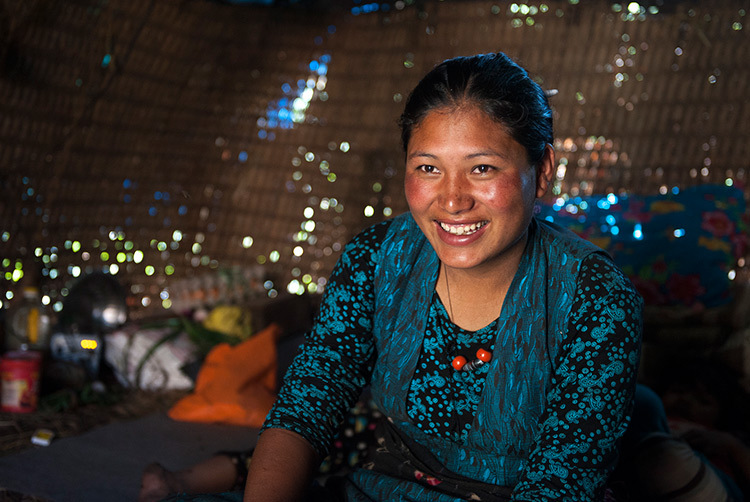 Her mother had abandoned the family years before, so Samita and her siblings were living with their uncles for the time being. “She is most likely to drop out [of school] since there is no one to take care of the family,” Raahi explains. 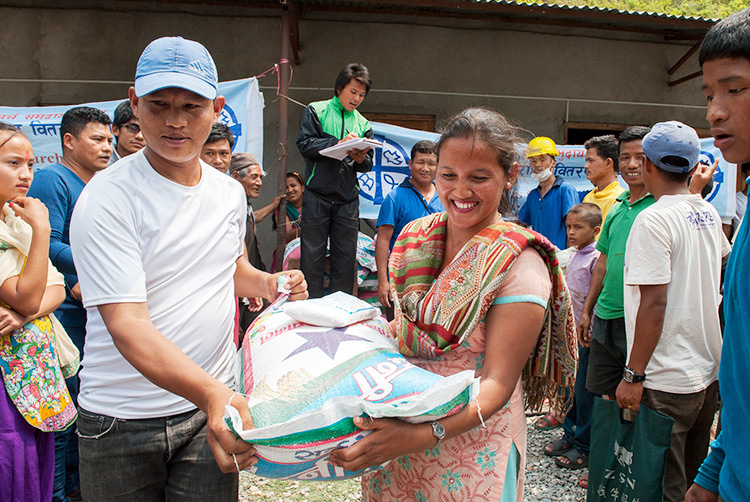 In the Gorkha district, Gospel for Asia Compassion Services workers gave 115 families food and distributed tarps and blankets to 100 families. 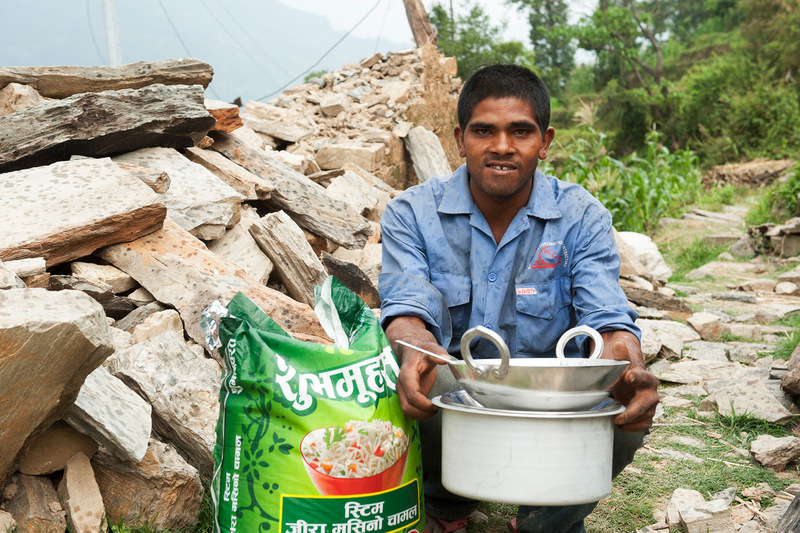 The Compassion Services workers met Sadar, who, like many other others in the village, works as a daily wage laborer. 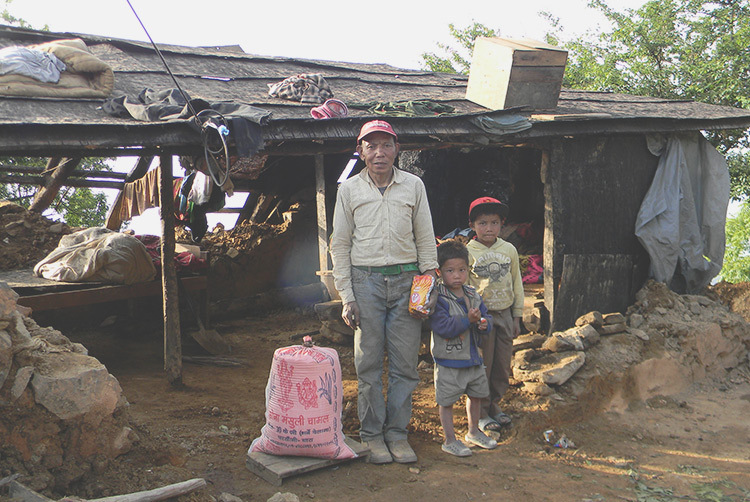 During the earthquake, his house collapsed, and a piece of the roof fell on his youngest son’s head. 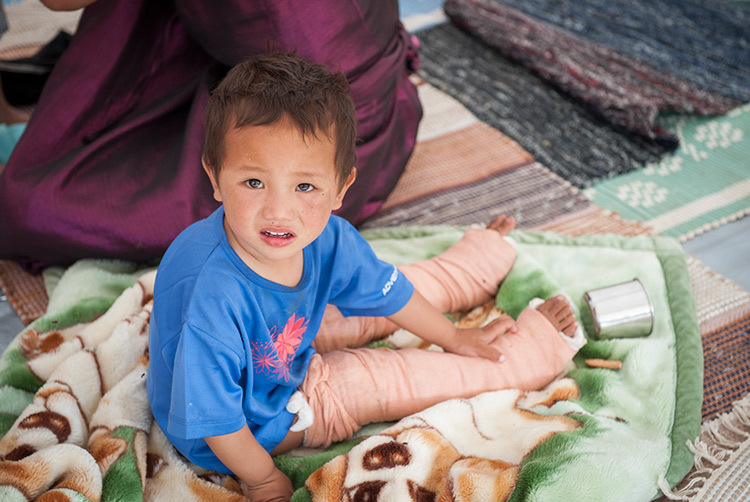 His son, Batuk, ran outside and fainted, amidst the chaos of all the other villagers screaming and running for safety. Twenty minutes later, Sadar came home and found Batuk unconscious, so he rushed him to the hospital. Batuk needed five stitches in his head. 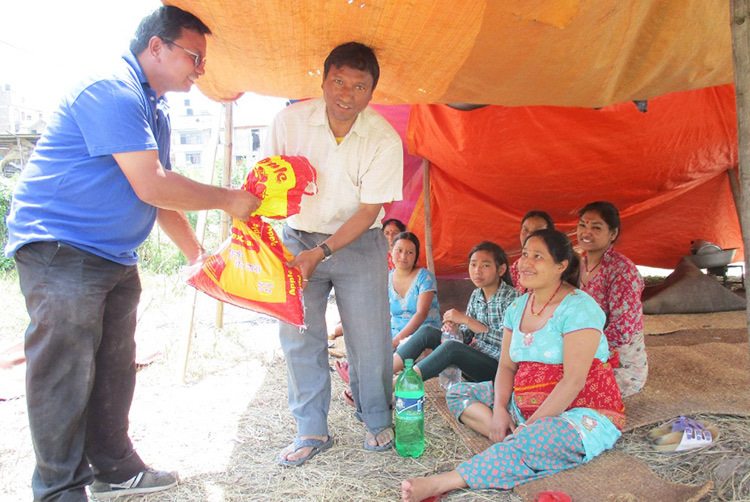 The Compassion Services workers prayed for Sadar’s family and gave them food, a tarp for shelter and some blankets. 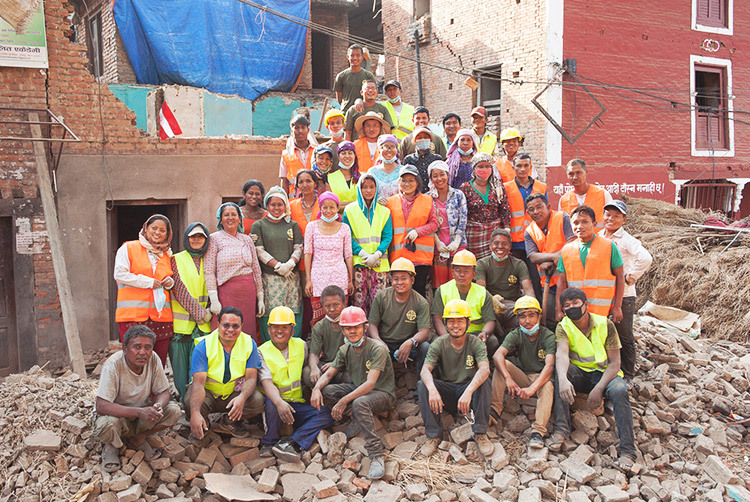 The workers are continuing to visit the family and plan to further help them. 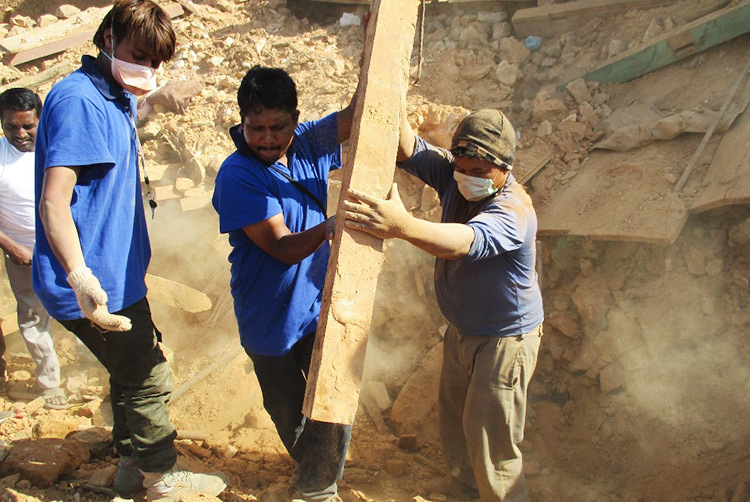 In the Bhaktapur district, 58 Bible college students, staff and church leaders helped their neighbors rebuild by going through the rubble of collapsed houses to recover items like corn, rice, clothes, utensils, shelves and usable wood. 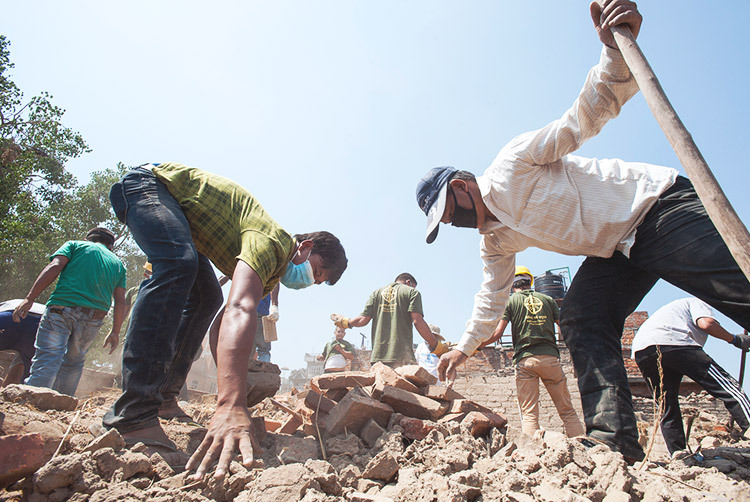 The Gospel for Asia-supported workers also helped tear down homes that were in danger of collapsing on top of people, and they helped clear roads and paths blocked by debris. 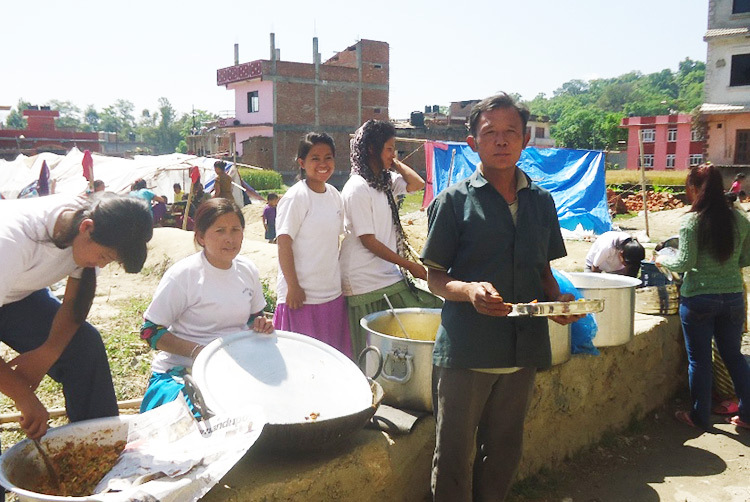 Gospel for Asia Compassion Services teams provided lunch to 150 quake victims in Gokarna, a village in the Kathmandu district. Many of the villagers were daily wage laborers who worked in garment or carpet factories. Because the factories have not been reopened, the laborers are struggling to find daily food. 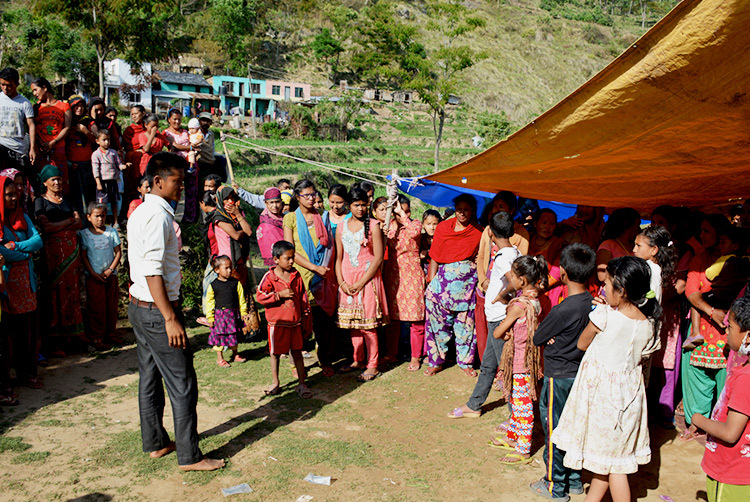 Rachit, a believer, donated 10,500 Nepali rupees (approximately US$100) to help provide the lunch. 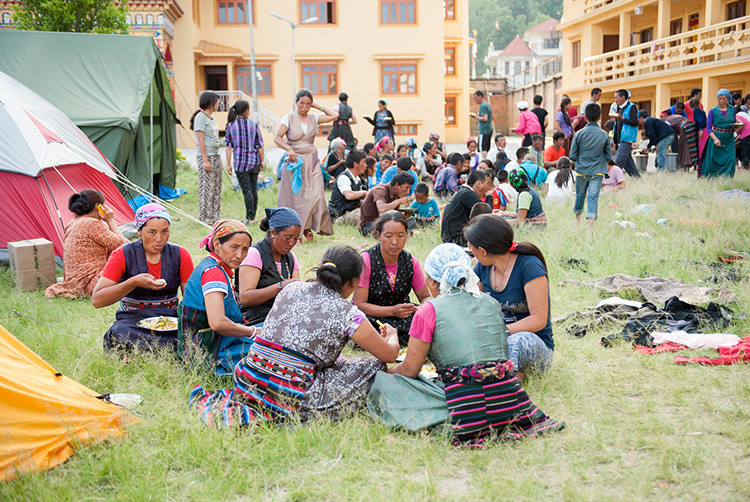 The quake victims expressed their gratitude for the free lunch. 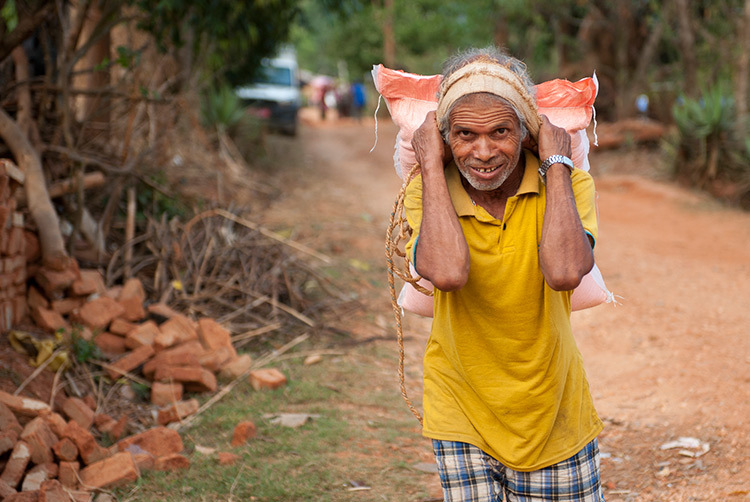 In one village where a Compassion Services team did relief work, they met a man named Kavi who was experiencing emotional distress after losing his two buffalo, most likely his only source of income. The workers spent time talking to and comforting him, which “brought great relief to his life,” according to Sagiv, a GFA field correspondent. 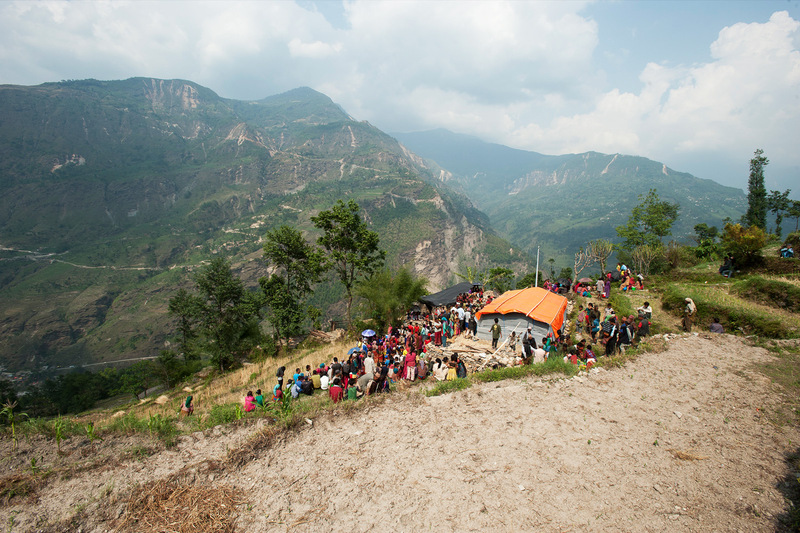 To reach Kavi’s village, situated on a mountaintop, relief teams journeyed 9 to 10 hours by vehicle and then four hours on foot. 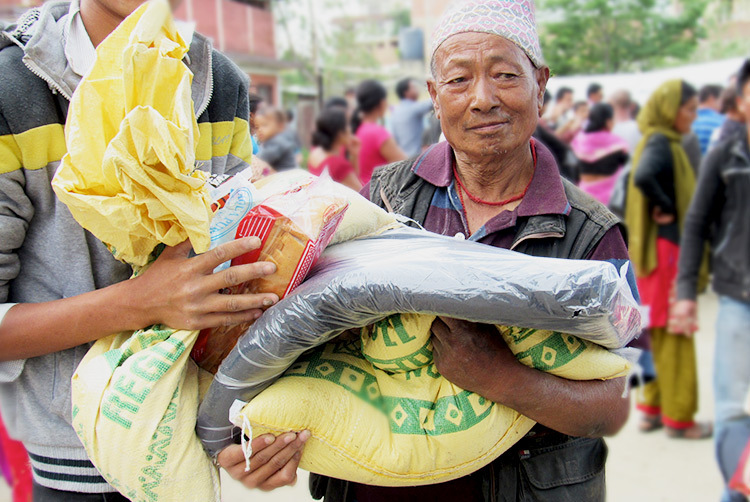 When they finally arrived, they were able to provide 113 families with blankets, food and tarps for shelter. 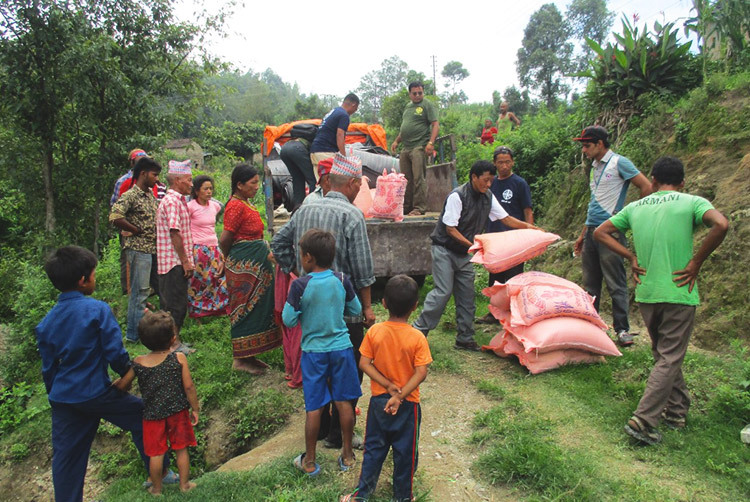 A team visited the village of Sauropani and provided 87 families with beaten rice, noodles, water and tarps for temporary shelter. 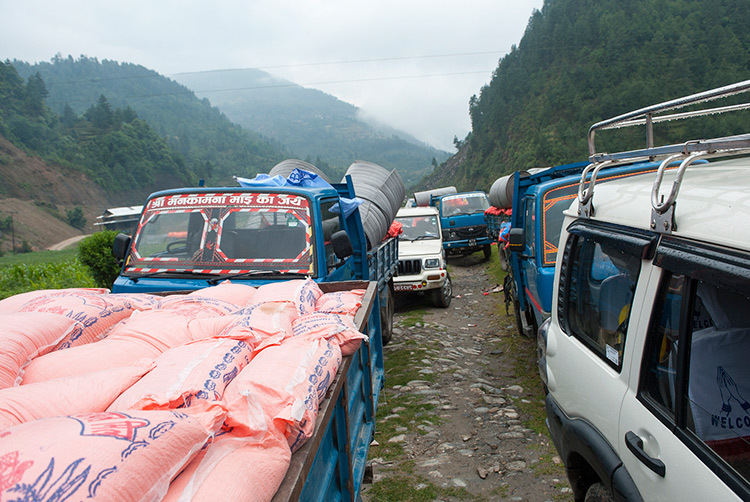 Because trucks are not able to reach this place, relief materials were taken in little by little. 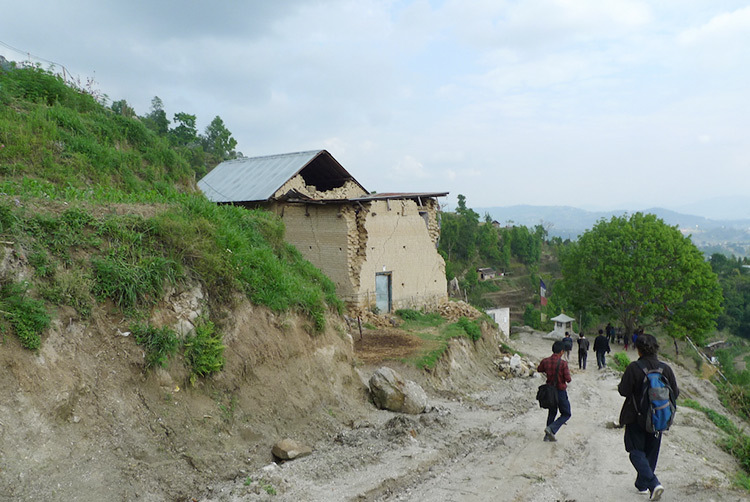 The earthquake damaged 90 houses in this area, 30 of which belonged to believers. Twelve people lost their lives. 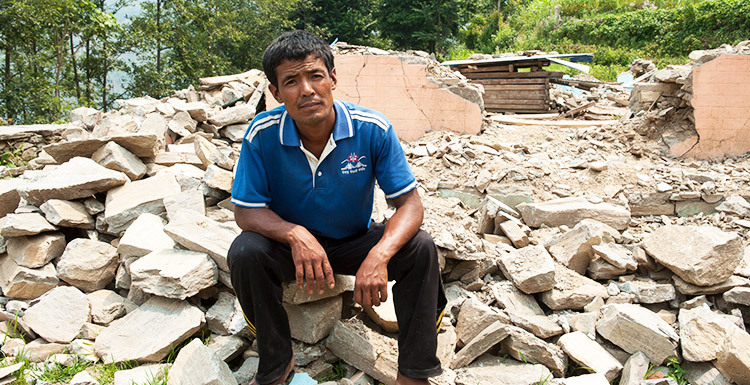 After the earthquake, Manoranjan and his family had no food to eat and no home to rest in. They survived on water only. 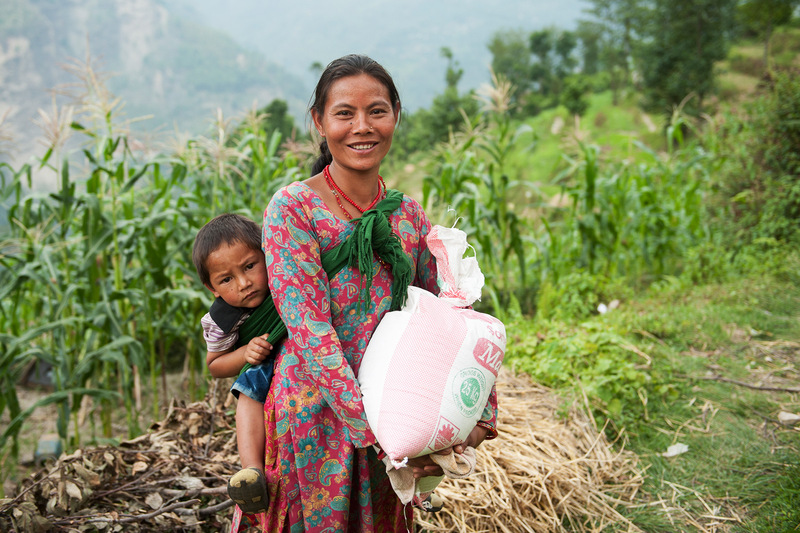 Gospel for Asia provided nearly 70,000 pounds of rice to seven of the worst-affected villages of the Kathmandu district. Former prime minister of Nepal, Madhav Kumar Nepal, attended the event. 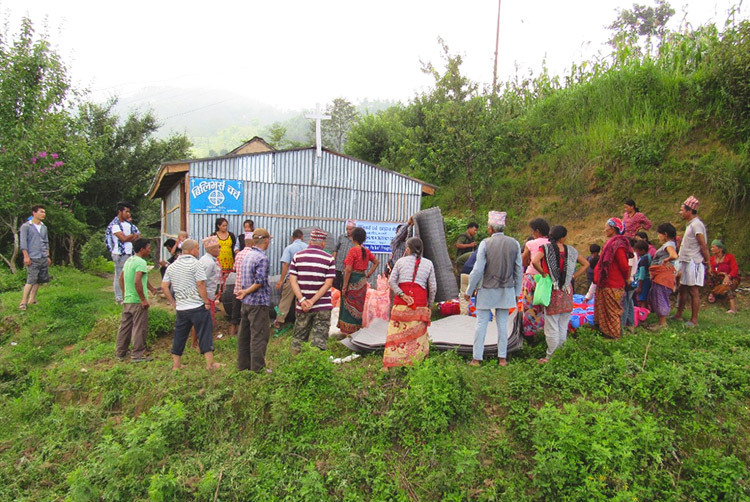 Teams distributed tents to 20 families in Gorkha Bazaar and to 15 families in Luitel Village. 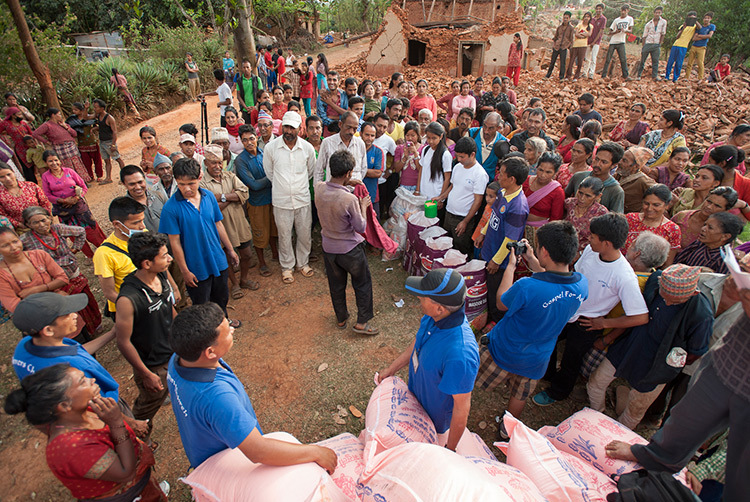 They also provided water, bread, rice, flour and blankets to 32 families from Duwakot in the Bhaktapur district. 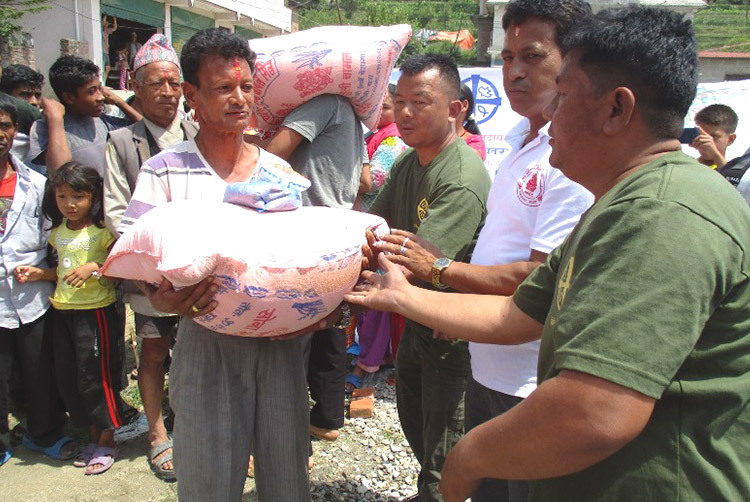 GFA-supported workers from Uttar Pradesh arrived in the Bhaktapur district with food supplies and blankets for the quake survivors. 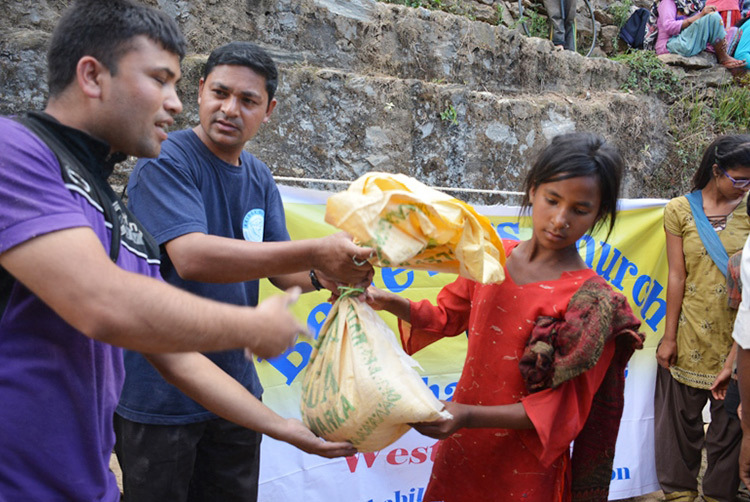 Thirty-two families from Duwakot village received blankets, bags of rice, bags of flour, water and bread. 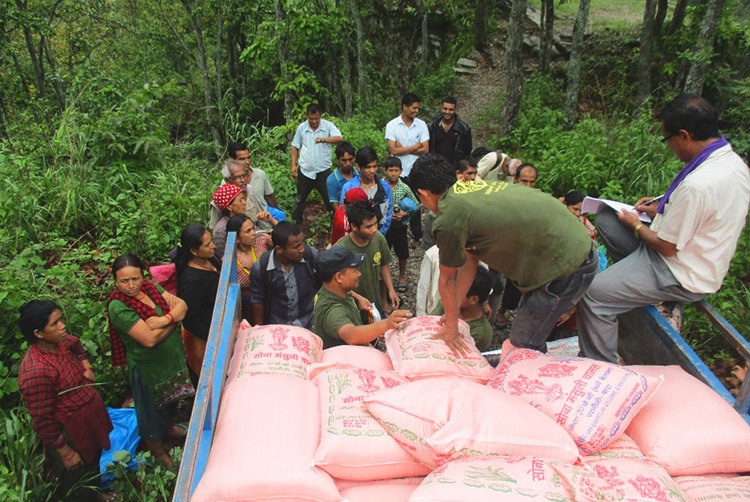 Compassion Services teams delivered one truckload of grain to people in the Nuwakot district. 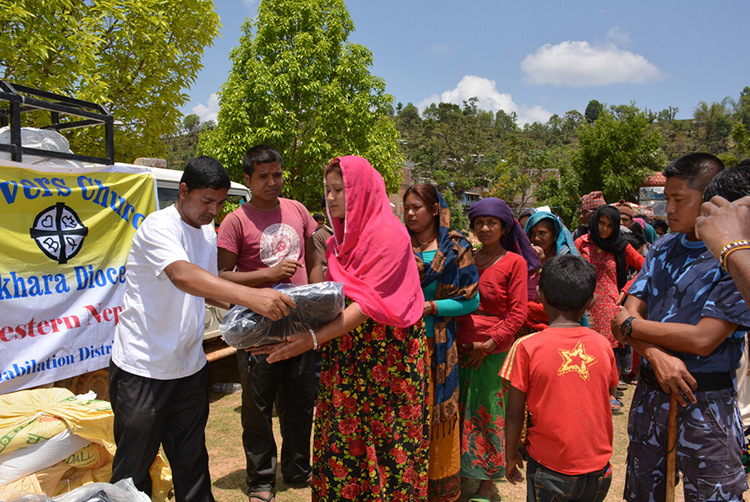 Teams visiting the village of Aarkhet distributed tents and noodles to 90 families. 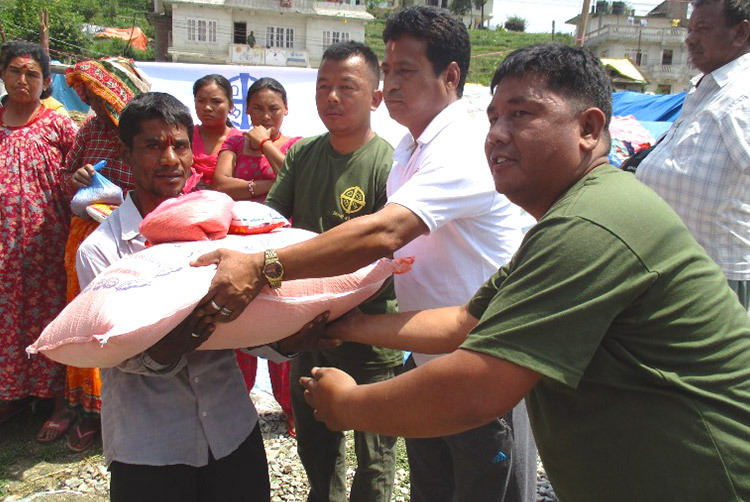 Some people came from Dhorang, Mangbu and Soti villages, traveling eight hours to receive items. 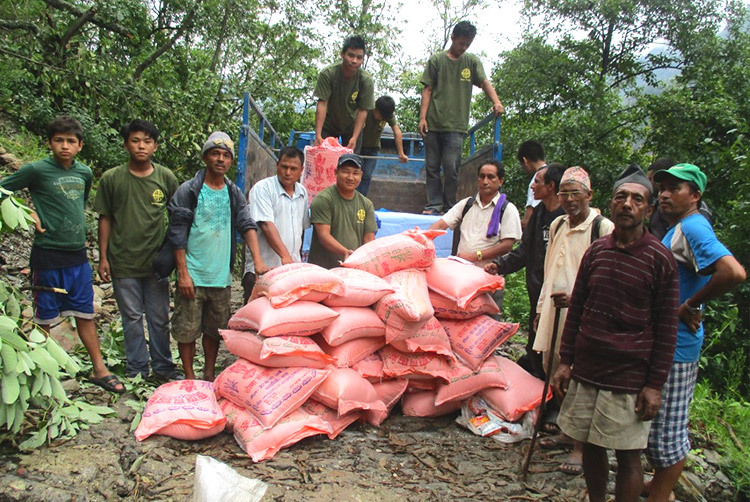 Ninety families from Nigale Village in the Nuwakot district received salt, noodles, biscuits and 66-pound bags of rice. 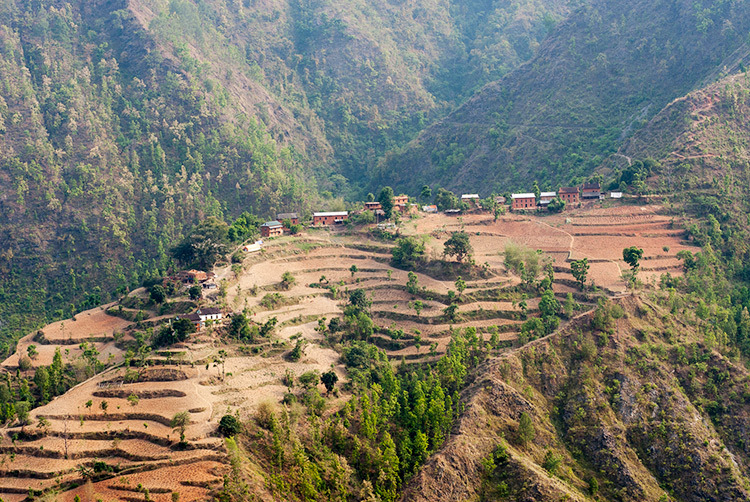 Nigale is located atop one of the mountains in Nepal, accessible only via 21 miles of snakelike roads from Kathmandu. 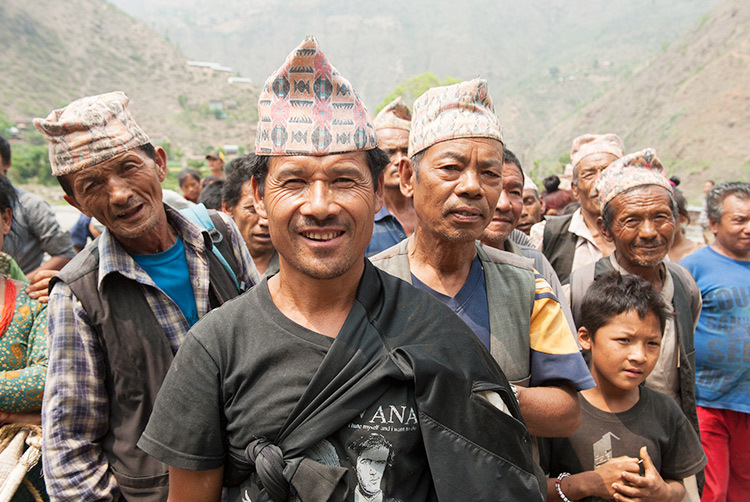 More than 1,000 people populate the village; they are poor and completely dependent on agriculture. 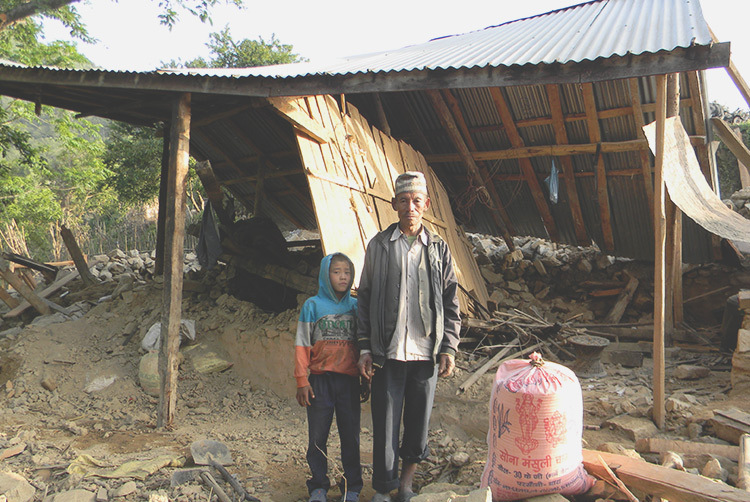 Samiran, 56, lost his wife, Medini, in the quake. A wooden pillar fell on her when the earthquake demolished their house. He received comfort when the Compassion Services team members showed their concern to him. “Thank you for the rice and other items,” he said. 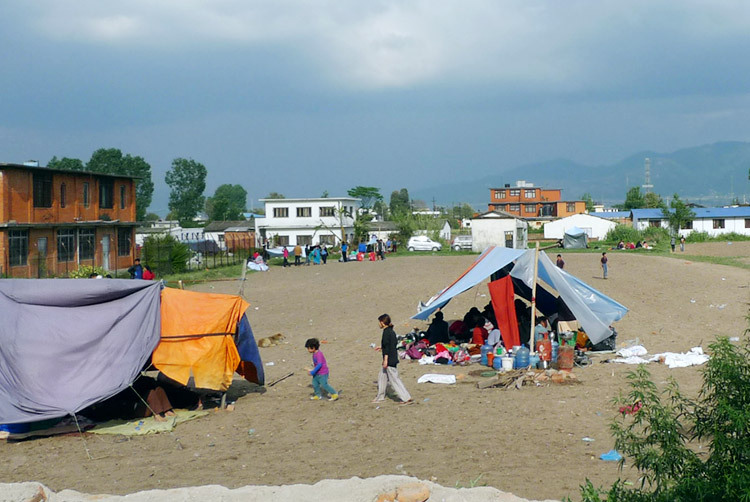 In Chisiyani, a village in Kathmandu, a team distributed four large tents to shelter 32 families. 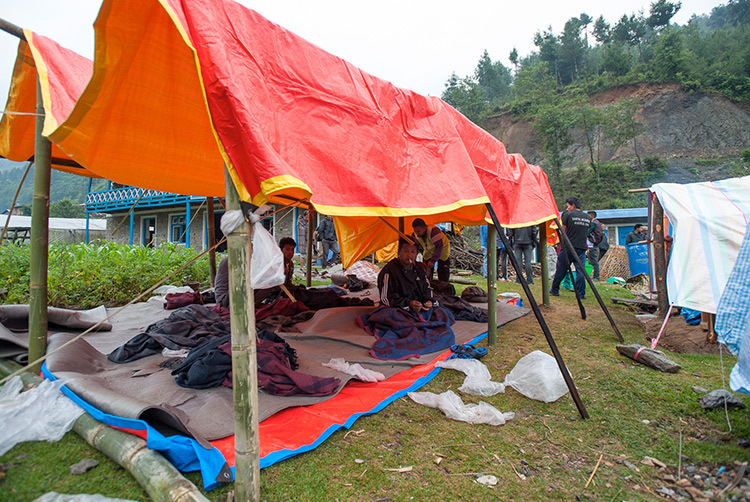 Meanwhile, other teams gave temporary shelters to people in Wasic, Bhangal and Simali villages. 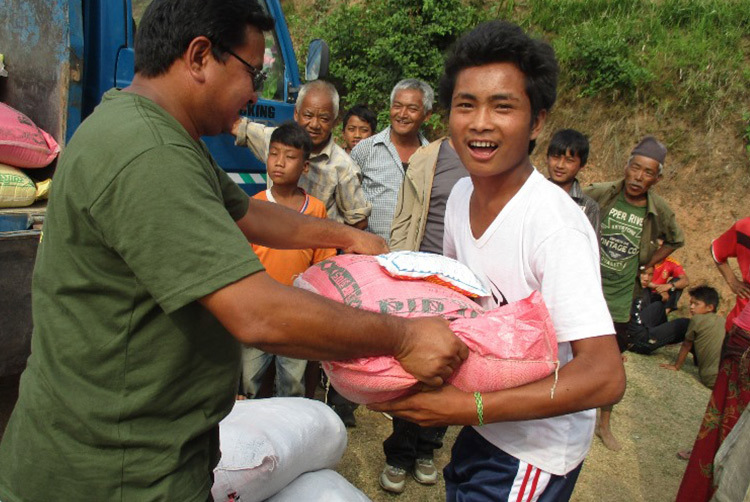 GFA-supported workers from Uttar Pradesh arrived with two trucks filled with food and blankets to distribute to people living in the Gorkha and Kathmandu districts, two of the worst-hit areas in the country. 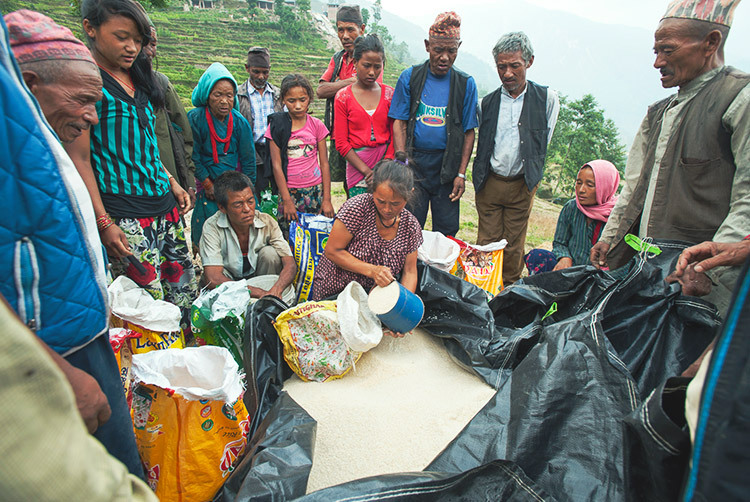 Teams visited Tarebhir, a village in the Kathmandu district, providing 4,629 pounds of rice to 70 families. 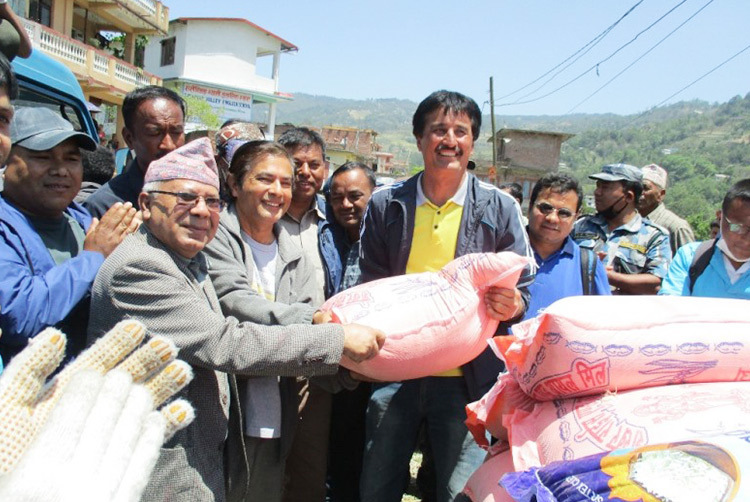 Narayan Sharma, Pastor Manja and other GFA-supported pastors and missionaries, along with youths and police representatives, helped with the relief. 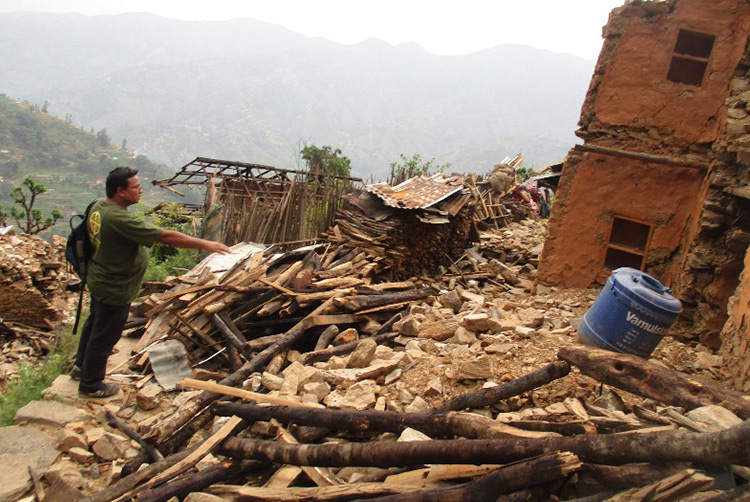 The people of Tarebhir lost many of their food sources and livestock in the quake. 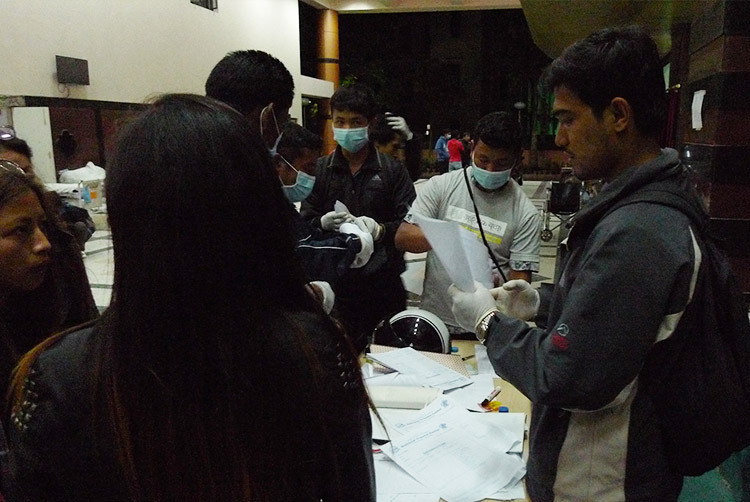 Compassion Services teams visited hospital patients. 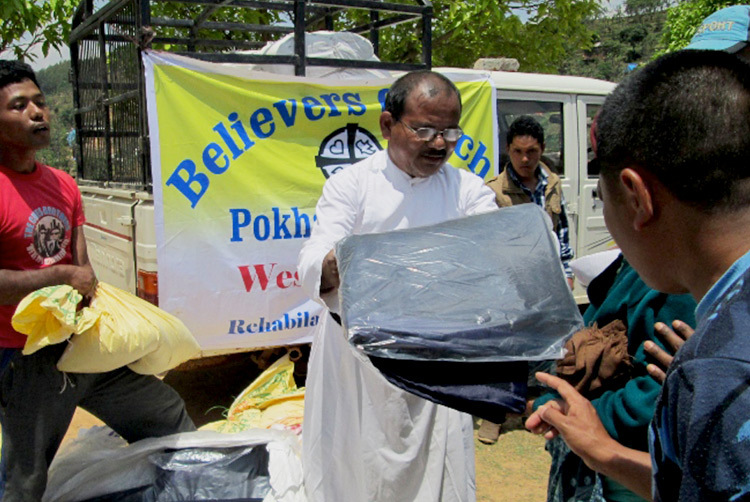 They passed out 40 mats and 40 bedsheets and gave pants, lungis and t-shirts to patients and clothes for newborn babies. 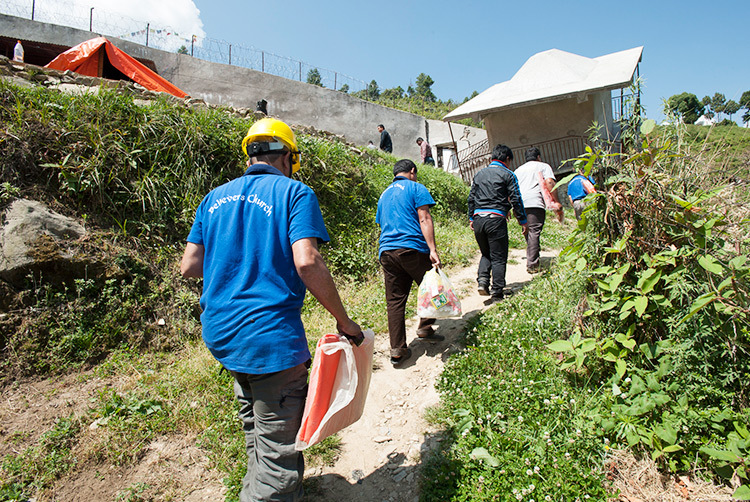 Nearly two weeks after the earthquake, GFA Compassion Services teams are still working full force to provide relief materials to survivors. 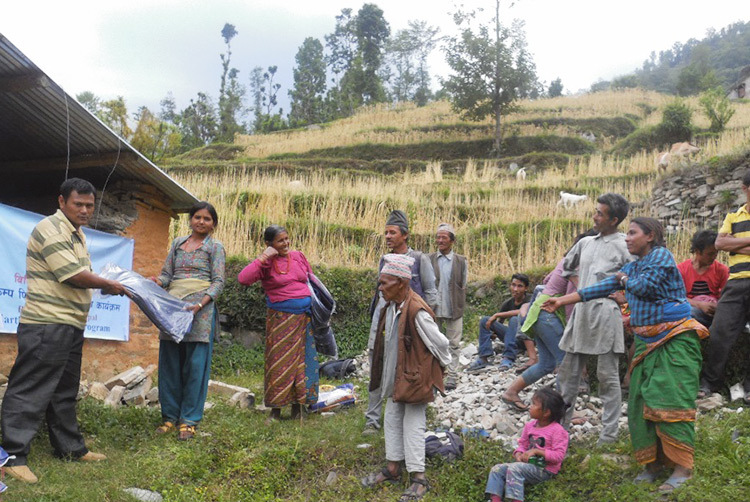 So far they have been able to reach around 30 villages scattered in six districts of Nepal. They’ve provided more than 1,000 people with food, shelter or both. 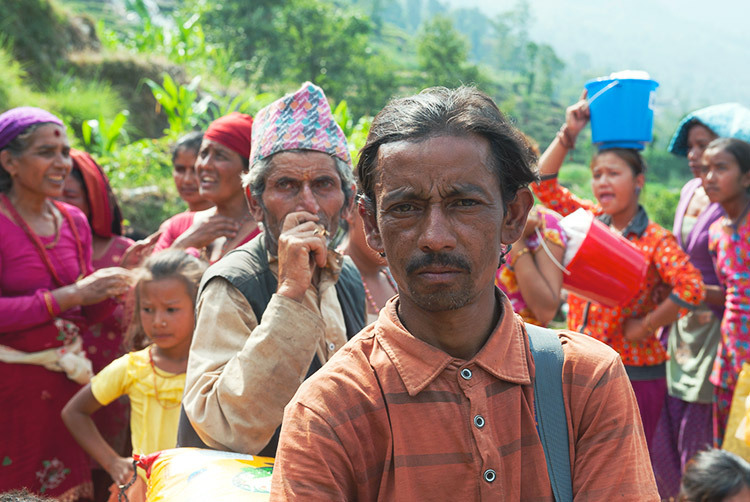 Gospel for Asia-supported pastors and missionaries across South Asia have collectively joined in prayer and fasting for the people of Nepal. 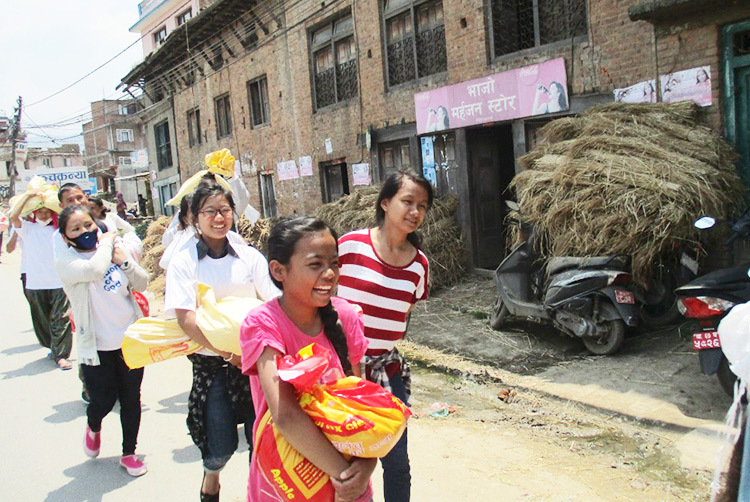 Women’s Fellowships and Sisters of Compassion have formed prayer chains and have put together campaigns to provide clothing to the quake survivors. 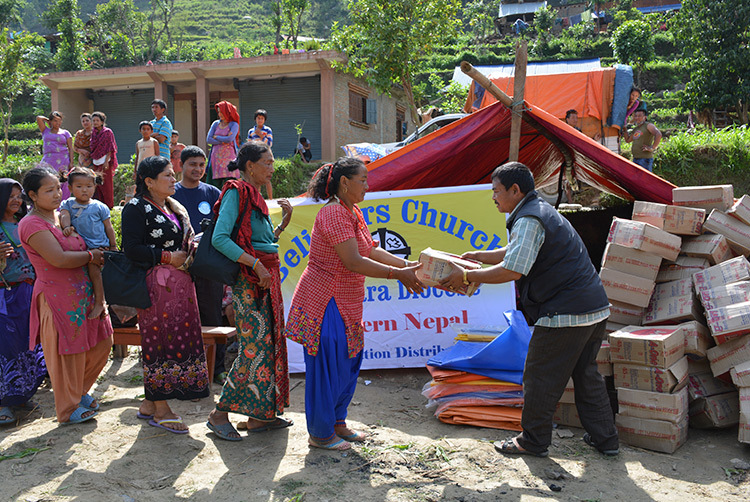 Thousands of churches led by GFA-supported pastors have taken up offerings and provided financial aid to send to Nepal. Some believers who were saving up money to buy clothing for their children have willingly given that money to help those in greater need. 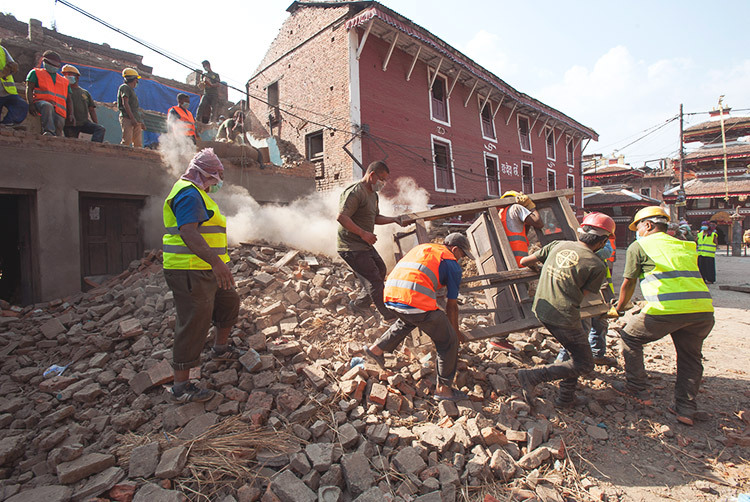 So far, at least 7,675 people have died from the earthquake, while 16,392 have suffered from injuries. About 10 churches led by GFA-supported pastors are destroyed, and many houses belonging to believers are either damaged or demolished. God’s comfort for survivors, especially those who lost loved ones. 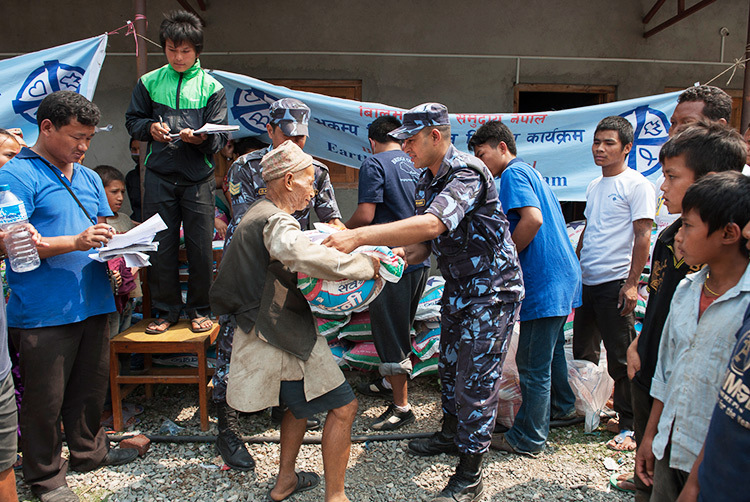 Relief workers as they continue to provide help to those in need. 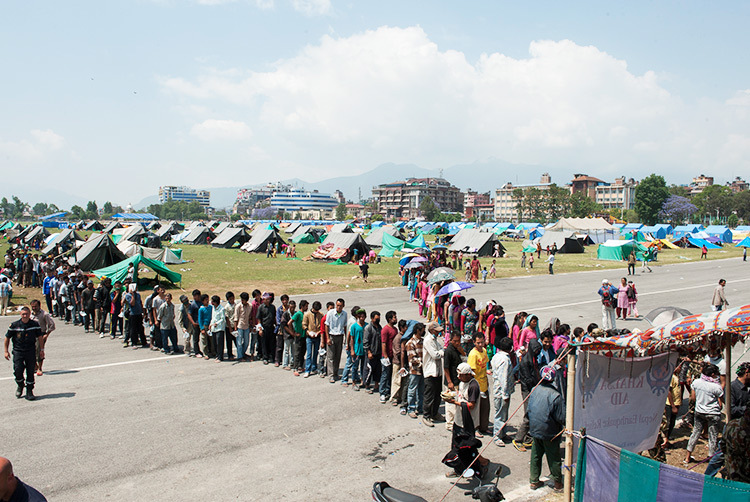 Patience for those who have been waiting days for aid. 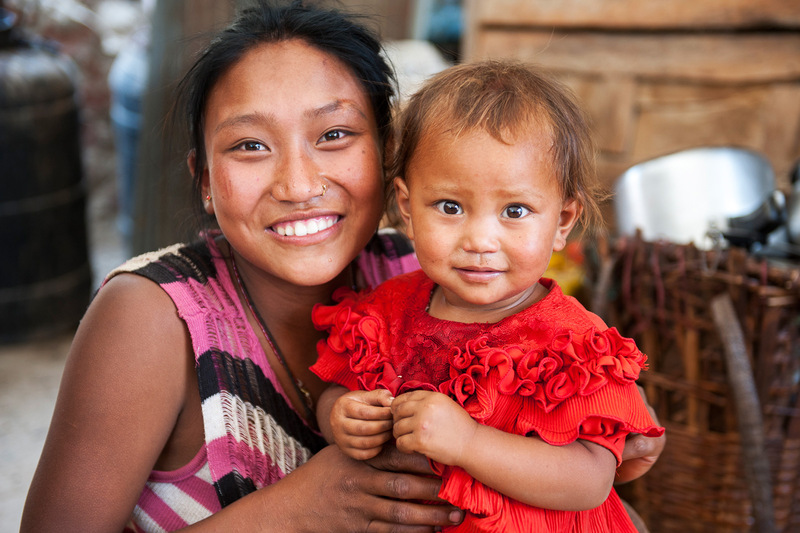 Health for those in Nepal. 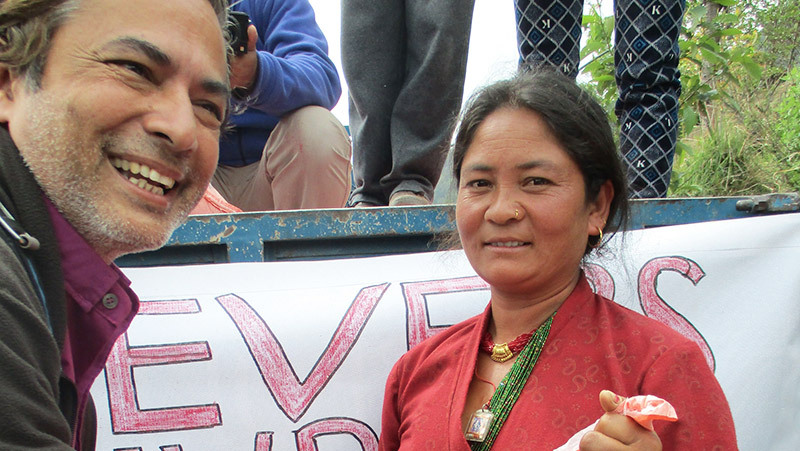 Narayan Sharma, leader of GFA-supported work in Nepal, shares a firsthand account of what happened during and after Nepal’s worst earthquake in 80 years. On April 25 at 11:45 a.m., I was at the podium [in church], sharing about the Bible, when the church began shaking. I requested our 100-plus believers not to panic because within a short time this would end. [It was] almost like the whole building was dancing endlessly. I, too, sat on the floor. Many believers started to pray loudly. As soon as the shaking was over, we all rushed to the open space. There was panic. The neighbors also joined here with us. A few believers were singing hymns to encourage one other. Walls were fallen. Aftershocks came every few minutes. After an hour, we all came inside the church and prayed and departed. We were still unaware that this was one of the biggest earthquakes in the history of this nation. Until this evening there was no electricity for four days, and I have not had a chance to take a bath for the last four days! But this evening things are changing for the better. 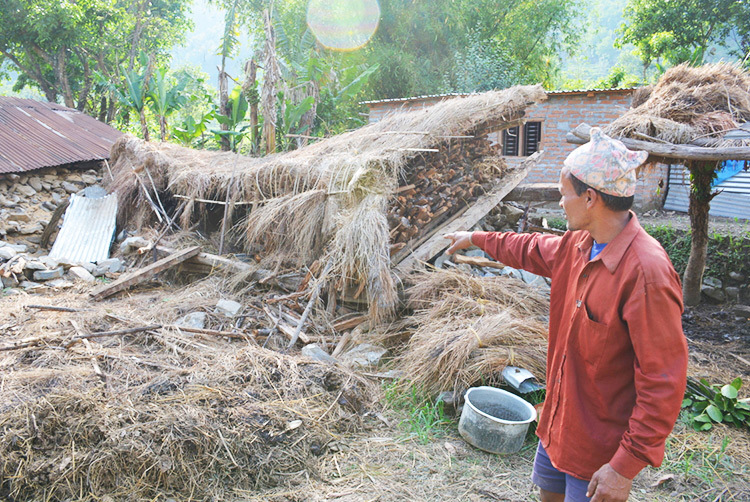 Many villages in Sindhupalchok District have lost 70 percent of their houses. 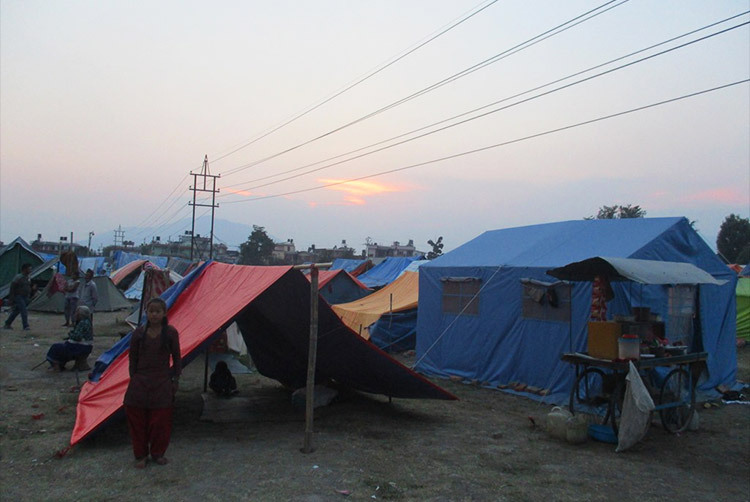 For the past three days, the people of Kathmandu Valley spent their nights outside in the field or camp because of the fear of strong aftershocks. In fact, more than 106 aftershocks have been felt after the quake. In between, the rain made life more painful. 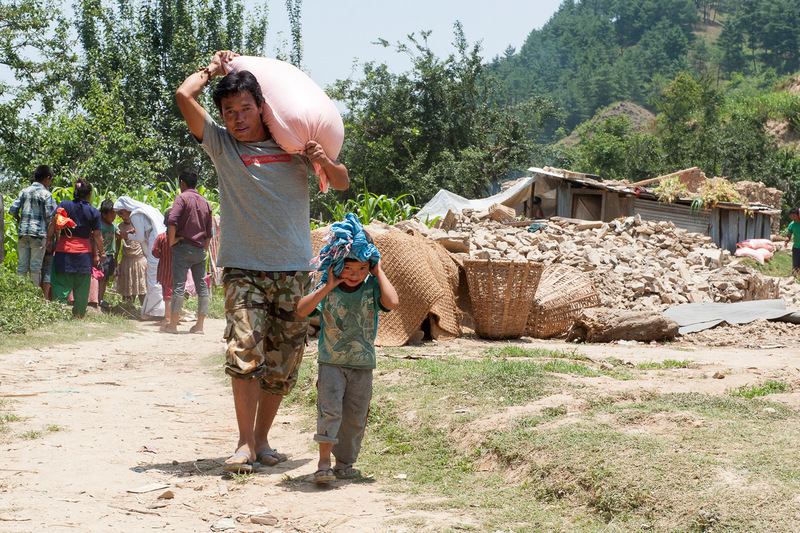 This evening, 96 hours after the quake, people are returning to their homes—if their houses are not damaged. Still, thousands of people are forced to live and spend these cold nights outside because they have lost their homes. 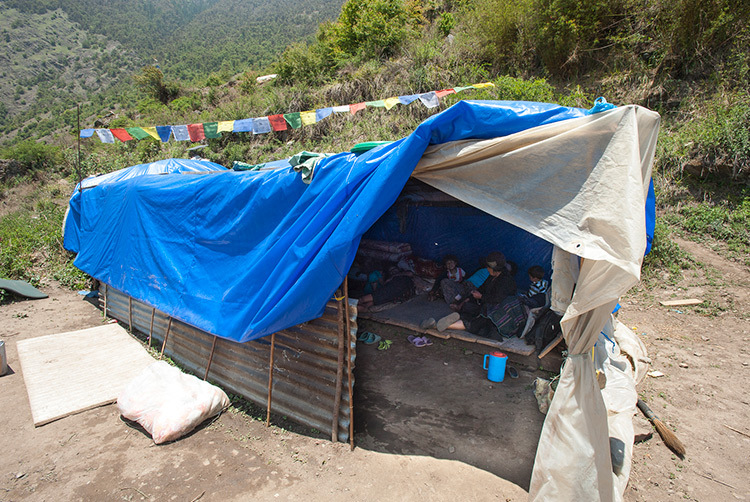 They are living under plastic [tarp] shelters. 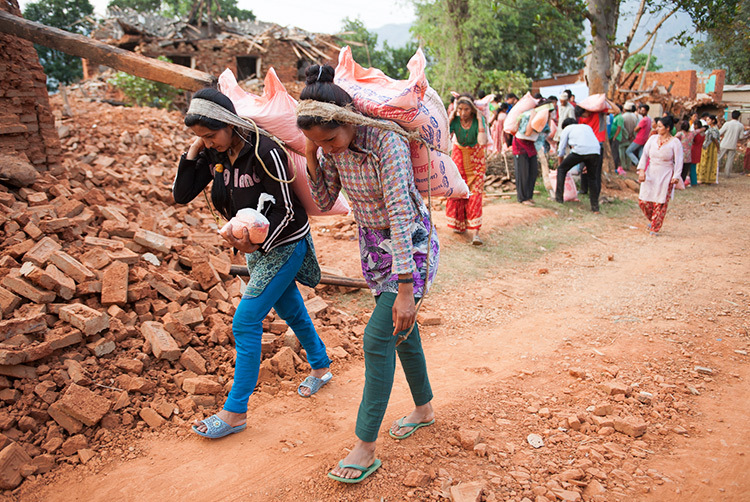 This earthquake has become a symbol for human suffering. “Is there any suffering beyond this point?” was a statement of a man who lost eight members of his family in this quake. 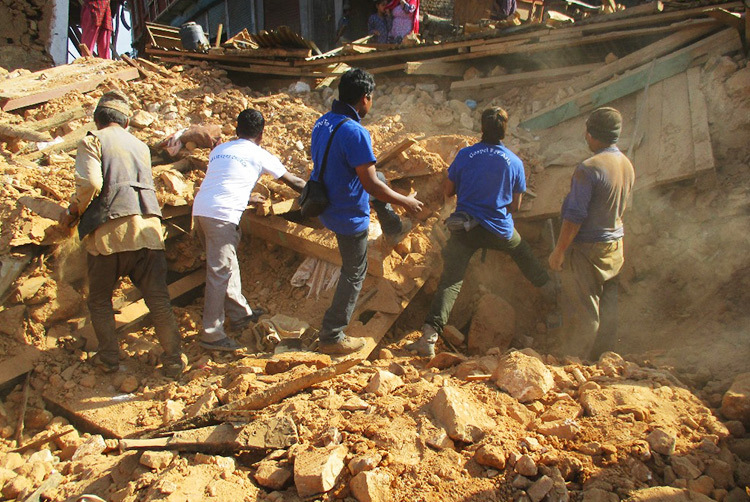 Sadly, two churches in Kathmandu collapsed, and the death toll is 45. 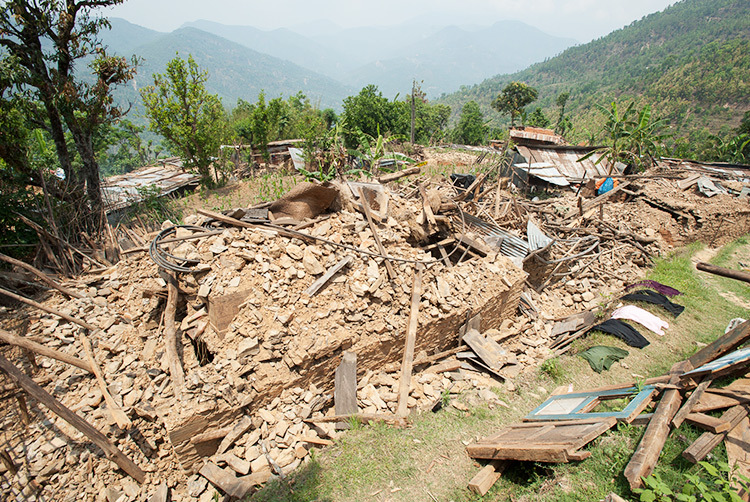 In Sindhupalchok, one church collapsed with its 70 believers inside. 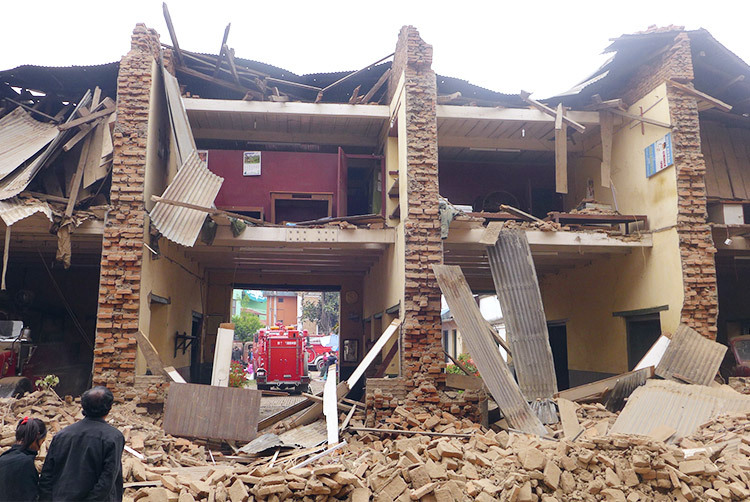 We are still unable to collect all the information about the damage to our churches and believers. However, according to latest information, seven Believers Churches are damaged, and we have received unconfirmed reports of two deaths of our believers. 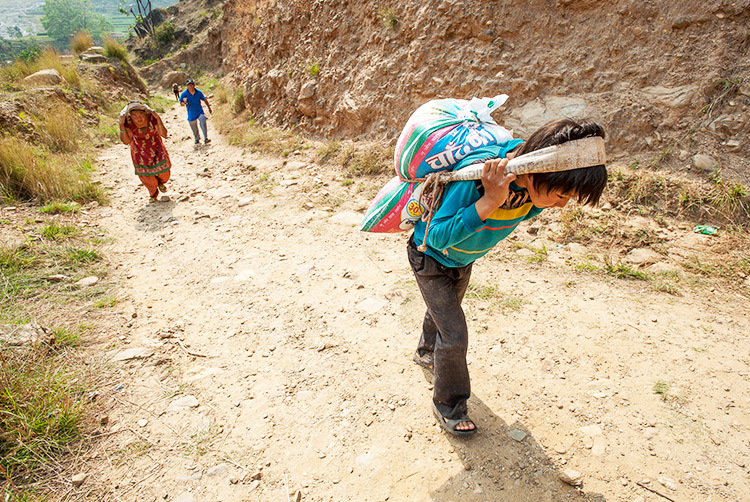 Many of our churches are in remote places where it takes two to three days to reach. In one district, 20 believers of ours have lost their homes; this has been reported today from the district pastor. We have yet to receive the complete information from our field. We had no water, no electricity, no power and no working lines of communication. From the very next day, Believers Church started relief work with the leadership and cooperation of our local pastors and youth. 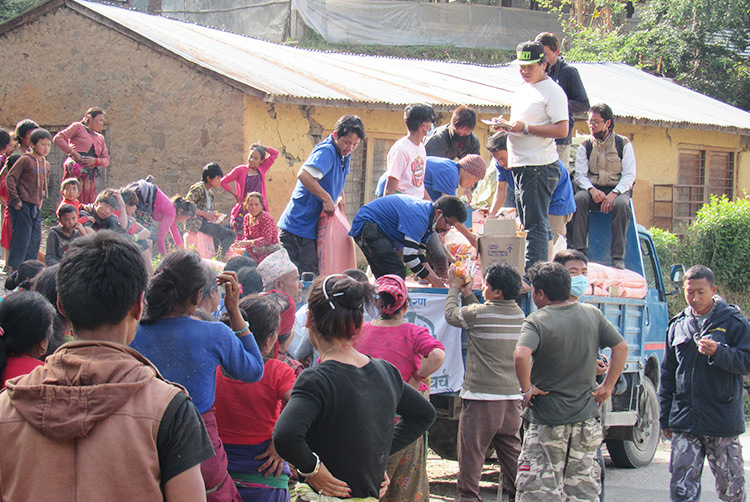 Our relief team in Kathmandu provided drinking water in big tankers at the shelter camp. Our Sisters of Compassion were engaged the whole day in this service without any break. Our team also provided food here at the camp. At one of our churches, around 400 people from the surrounding neighborhood came to find shelter. So food was provided to them for three days from the church at this shelter. 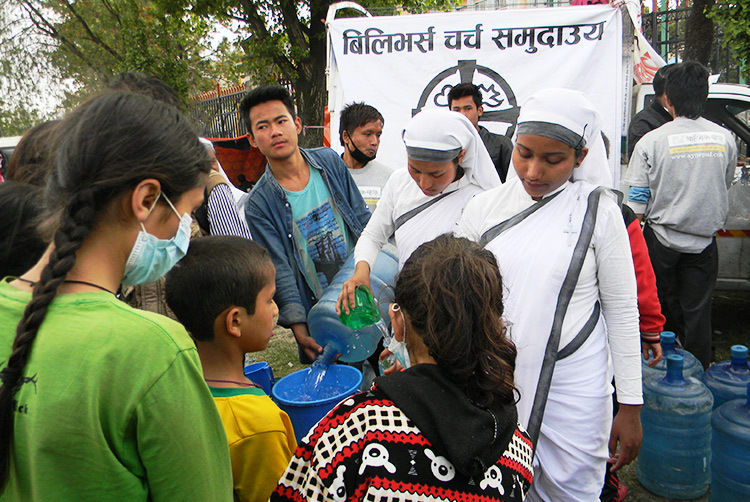 The church also provided clean drinking water and medicines for primary health. 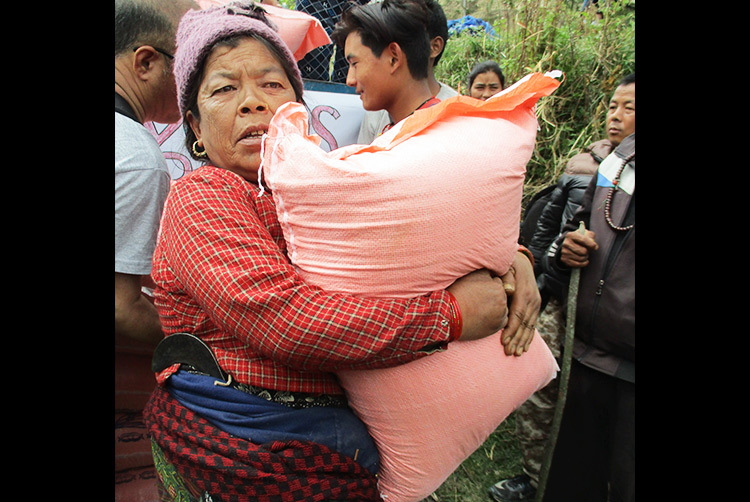 Yesterday, in the village of Chapali, relief materials were provided for 16 families who lost their homes or whose homes were not in a condition to stay in due to the quake. 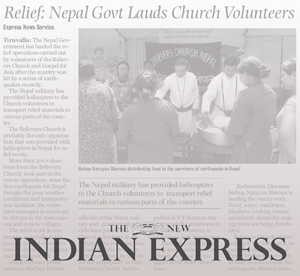 Today, 350 earthquake-affected people were fed at Narayanthan by the church. 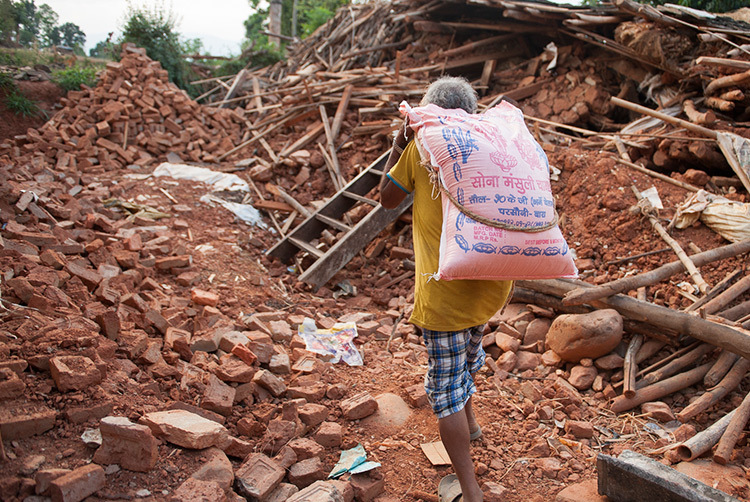 Tomorrow, 66 families will receive relief materials in Gokarna Village. 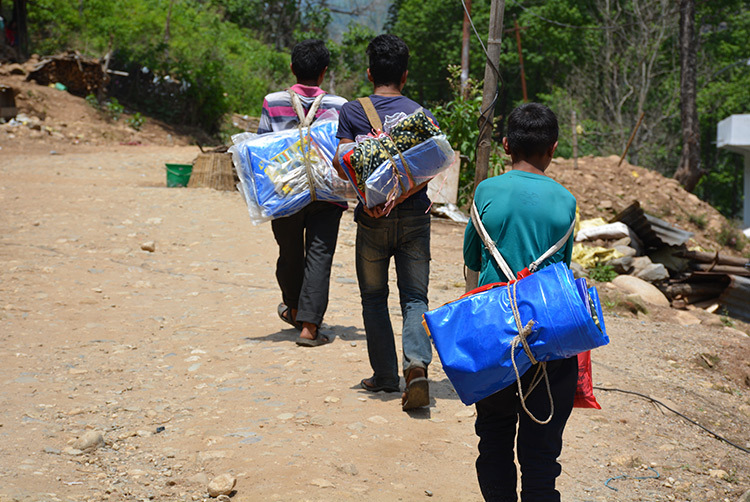 Soon, our relief team wants to move to the most affected area for rescue and relief work in Sindhupalchok. 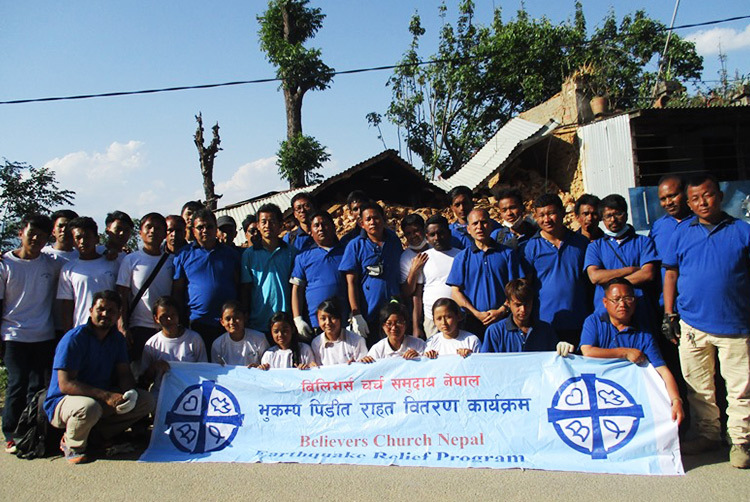 Our Pokhara team has sent relief teams to Gorkha and Dhading. At the moment they are on the way to the affected area of these districts. 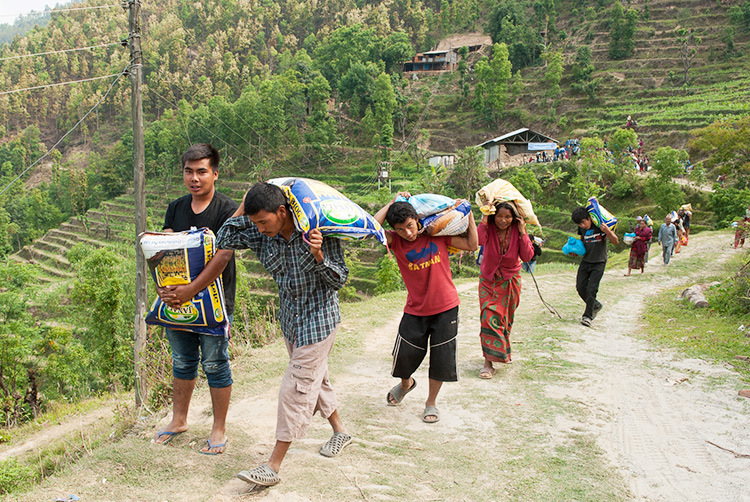 Gospel for Asia Compassion Services teams continue to minister and bring much-needed relief supplies and aid to those affected by the 7.8 magnitude earthquake that shook the central and eastern regions of Nepal on Saturday. 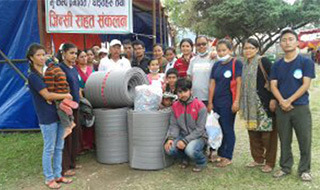 On Tuesday, one team, which included Bridge of Hope staff, distributed 40 mats, bedsheets and clothes to injured patients waiting in a hospital in Pokhara, Nepal. 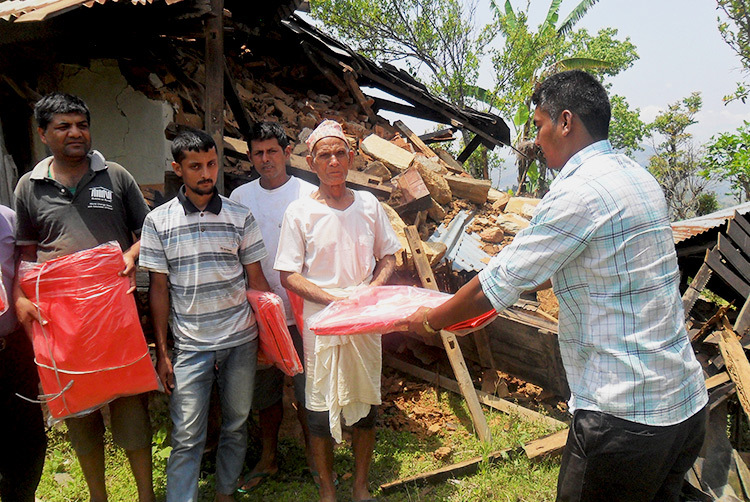 Later that day they provided tents for six villagers in the Gorkha region who had lost their houses and belongings. 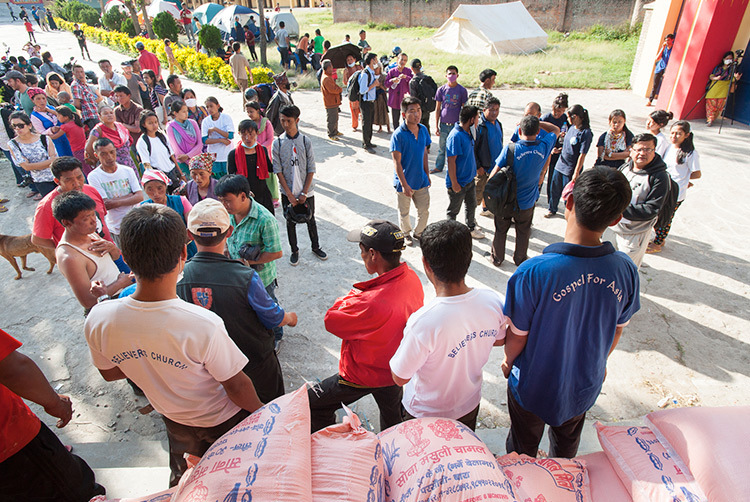 Other GFA teams set up a shelter and distributed hot meals around the clock to about 300 people. 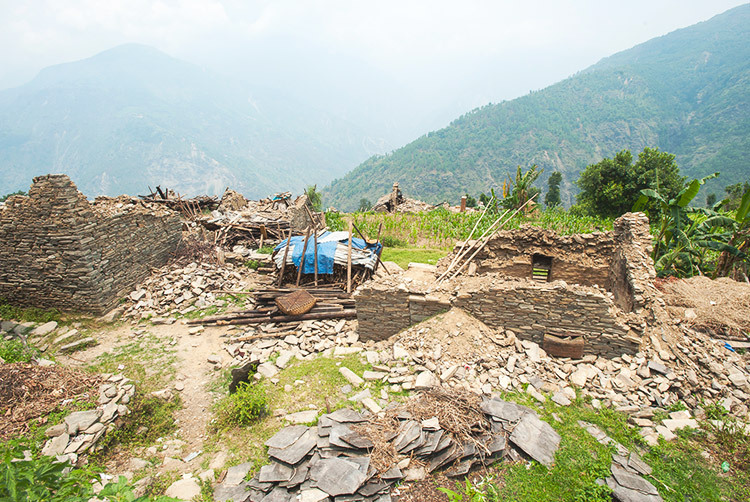 One team visited a village where they discovered 75 people “living in very pathetic condition,” said Hitendra, GFA field correspondent in Nepal. “They had no food, no proper shelter, and some of them were suffering with diarrhea, headaches, stomach aches and fever,” he said. 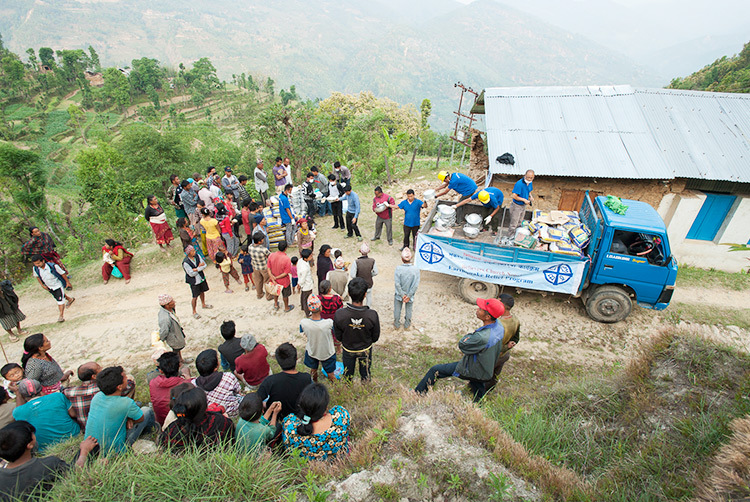 Compassion Services teams distributed medicine, snacks and clean drinking water to the villagers. 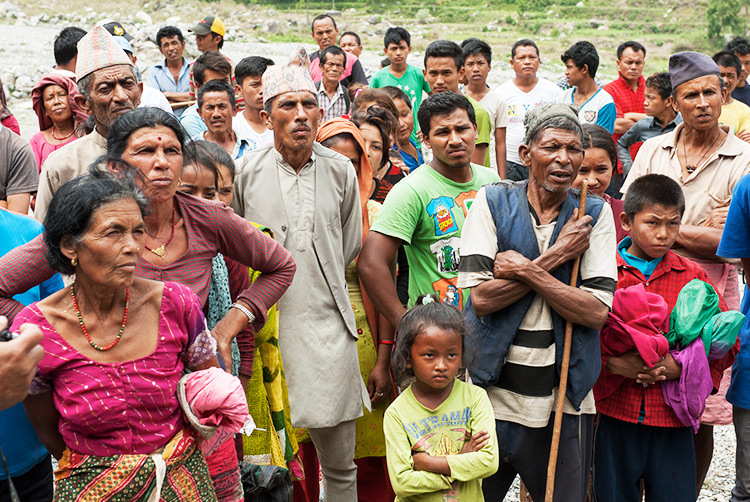 Since Saturday, the number of deaths in Nepal has escalated to more than 5,000. Government officials suspect it will rise to 10,000 once information comes in from remote villages. India and China have reported 72 and 25 deaths, respectively. 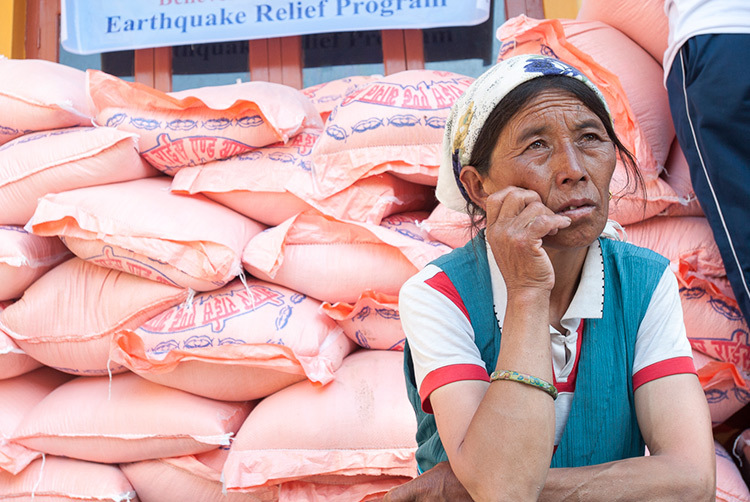 The United Nations estimates that 8 million people have been affected by the earthquake, which left 1.4 million in need of food and 2.8 million displaced because of damaged or destroyed homes. Thousands of people in Kathmandu still sleep outside, too afraid to spend the nights in houses or buildings that might collapse if another earthquake or aftershock hits. Water, food, fuel and electricity are in short supply. 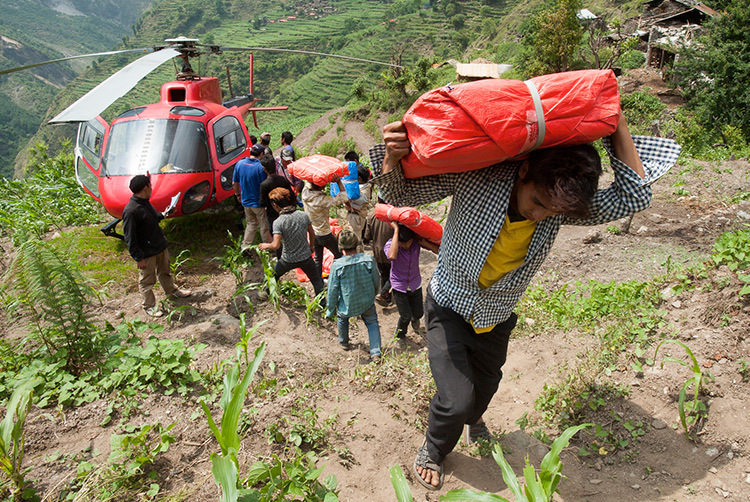 Rainstorms are complicating rescue efforts and have caused two landslides already. Tension is also mounting as survivors become frustrated with the costs and delays of public transportation and the slow arrival of aid. 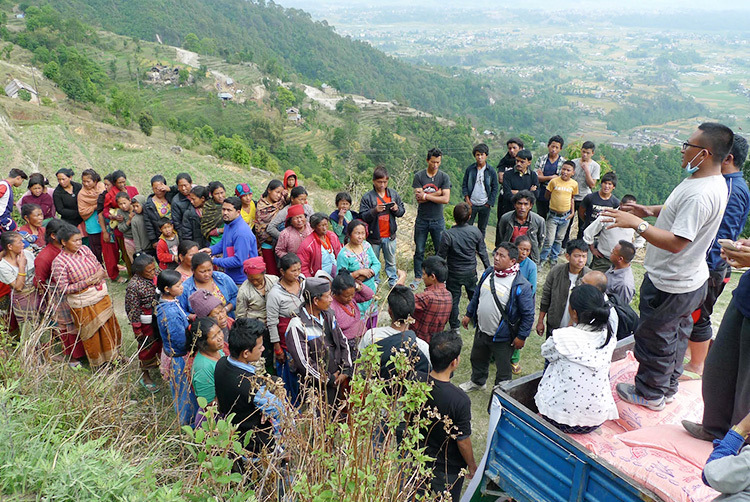 God’s help as GFA-supported pastors, missionaries and believers reach out and bring relief to the earthquake survivors. 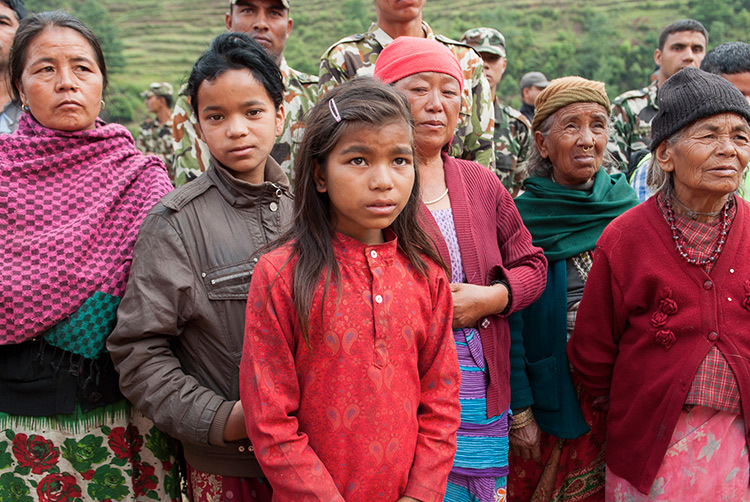 God’s protection over the people of Nepal. Comfort and strength for those suffering. More than 4,000 people have died since Saturday’s devastating earthquake—and the number continues to climb. Officials believe they’ll discover more bodies as rescue teams reach the more remote, mountainous regions of western Nepal. 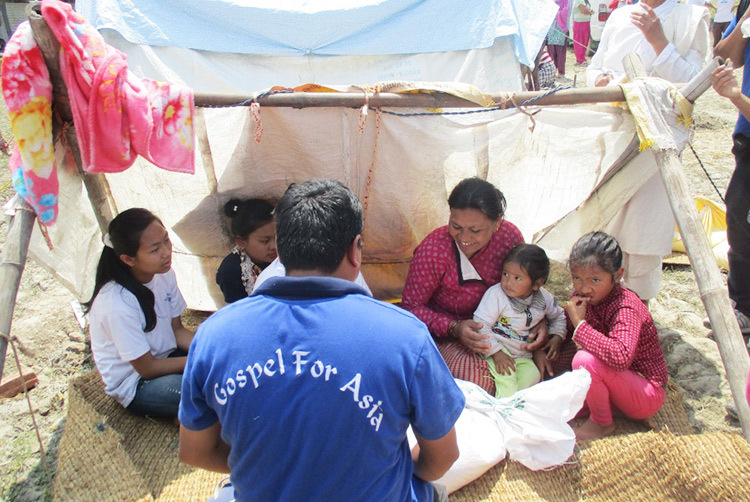 Gospel for Asia-supported Compassion Services teams promptly began offering aid and ministering to survivors. 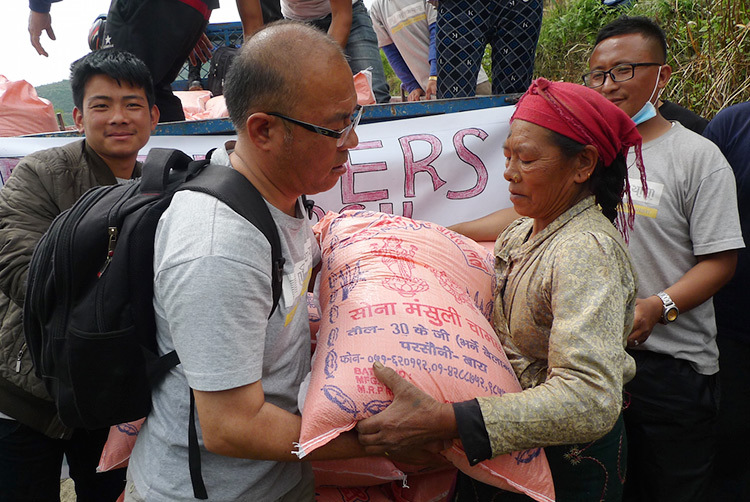 On Monday, a team of 22 pastors, leaders and believers from the Kathmandu Valley provided food, including noodles, sugar, rice, water and dal, to those in need. 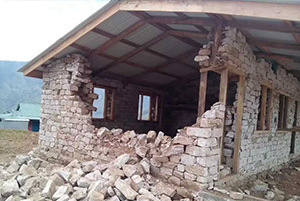 Reports from the field indicate that there are five known churches in the region that have been damaged, but no GFA pastors or believers have died or been injured. “By His very grace, our leaders, pastors and missionaries . 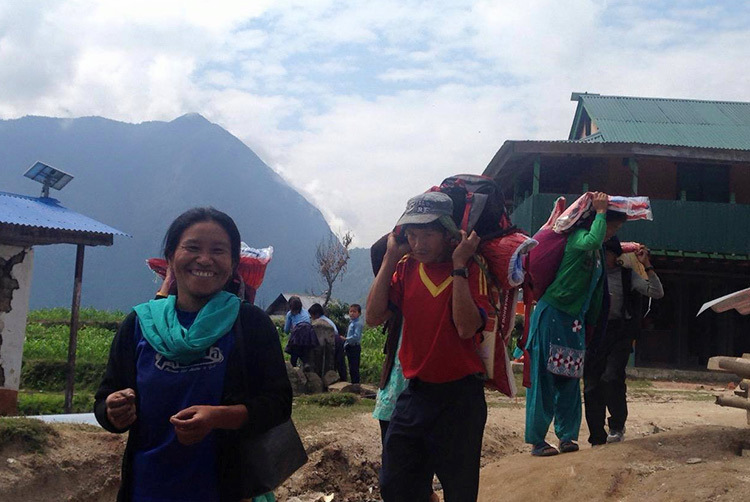 . . are safe till now,” reports Prita, GFA field correspondent in Nepal. 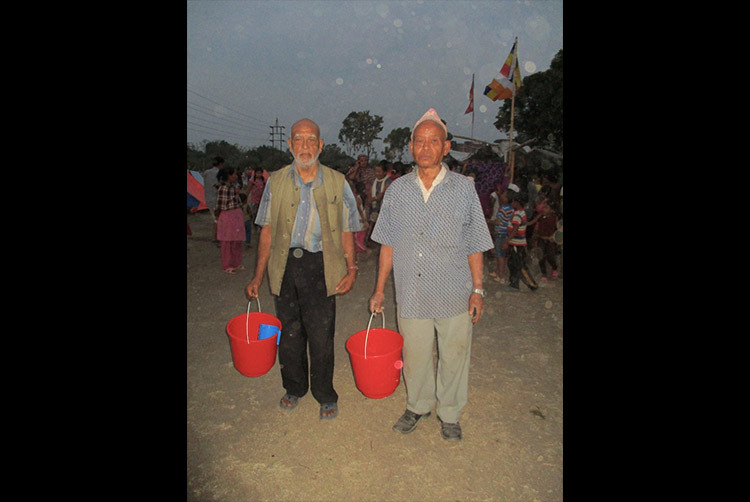 Communications to and from our pastors and missionaries living and serving in the remote regions of Nepal are limited. 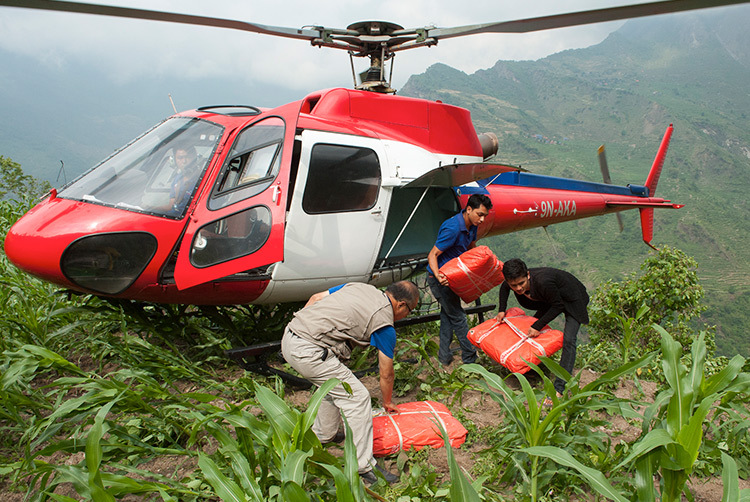 The government has sent helicopters to rescue people who are trapped, as the risk of running out of food and water increases. 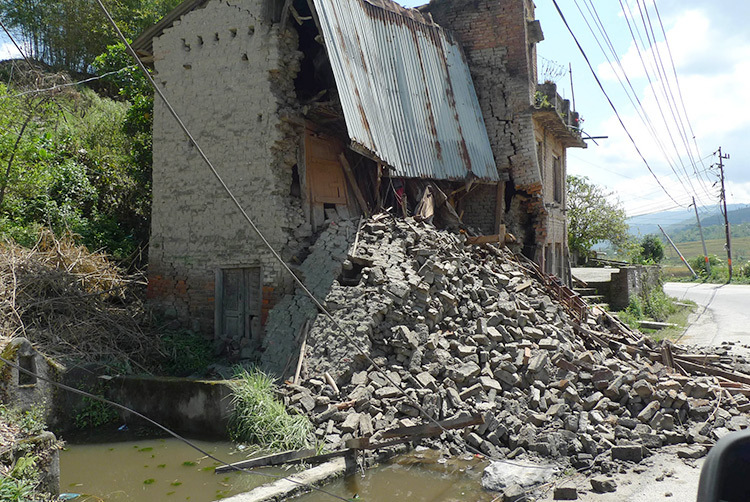 Those evacuated have witnessed entire villages demolished because of the quake and at least a dozen aftershocks. Rescue workers continue to search through rubble, hoping to find more survivors as they fight against the clock. 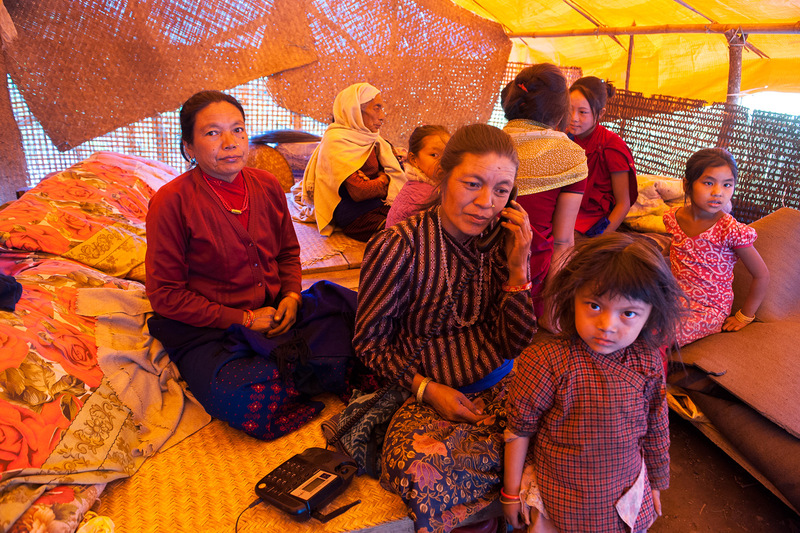 The people of Nepal still live in fear of aftershocks that will bring more destruction and death. 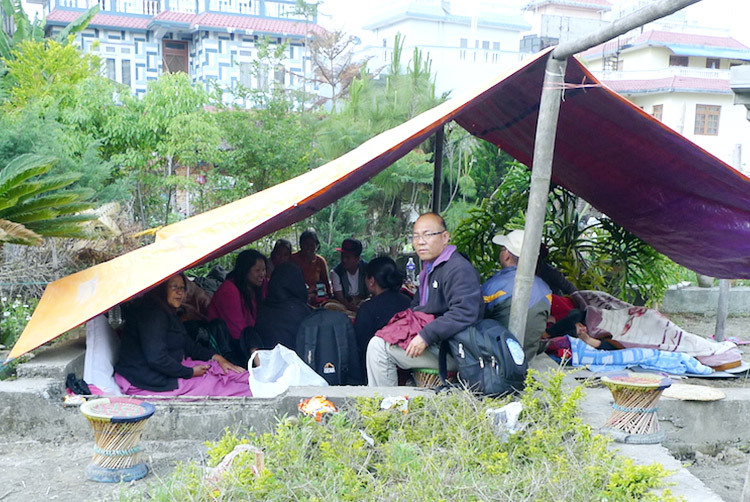 Compassion Services teams as they minister to the earthquake victims. Energy and endurance for rescue workers as they search for more survivors. Those grieving over the loss of loved ones. God’s protection over our pastors, leaders, missionaries and believers. 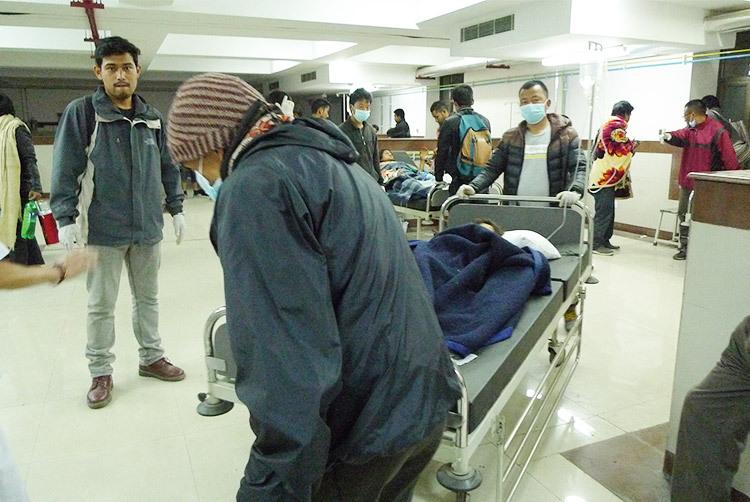 A 7.8 magnitude earthquake struck central Nepal, less than 50 miles outside the capital city of Kathmandu, just before noon Saturday, killing more than 1,000 people in Nepal, India, Tibet and Bangladesh. The death toll is expected to rise. 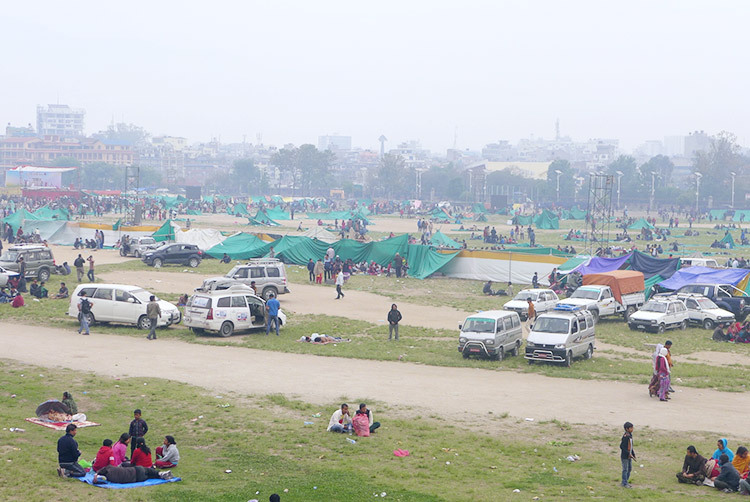 As the earthquake throttled the Kathmandu valley, people gathered outdoors in fear. Aftershock upon aftershock hit the devastated area. 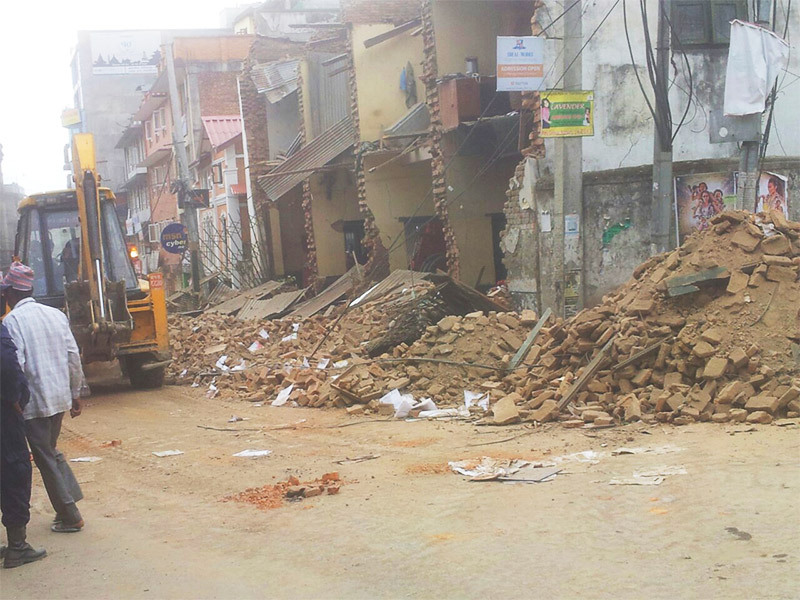 Streets cracked and buildings crumbled in the disaster. The quake also triggered a fatal avalanche on Mount Everest. To add to the devastation, overnight temperatures are expected to drop, and people will need to make do without electricity, running water or shelter. Survivors need help as they struggle with the possibility of having no home or food for many days, even weeks. For those who have lost loved ones or homes or who have suffered injuries in the devastation. For safety, strength and grace for missionaries ministering to the suffering. 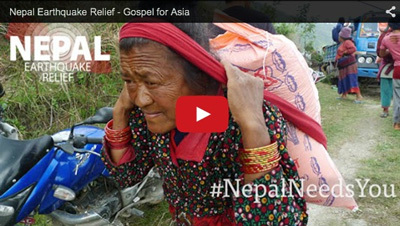 You can download this video to use in your Church Service as you pray for Nepal. 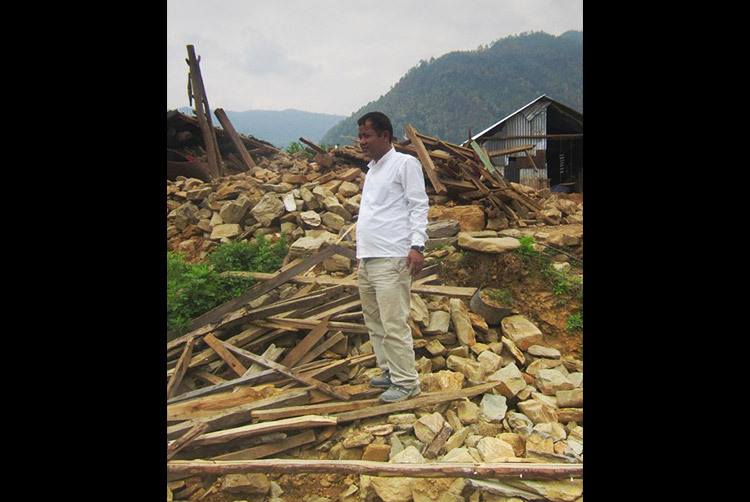 Narayan Sharma, leader of GFA-supported work in Nepal, witnessed the violent shakes of the recent earthquake that hit Nepal. 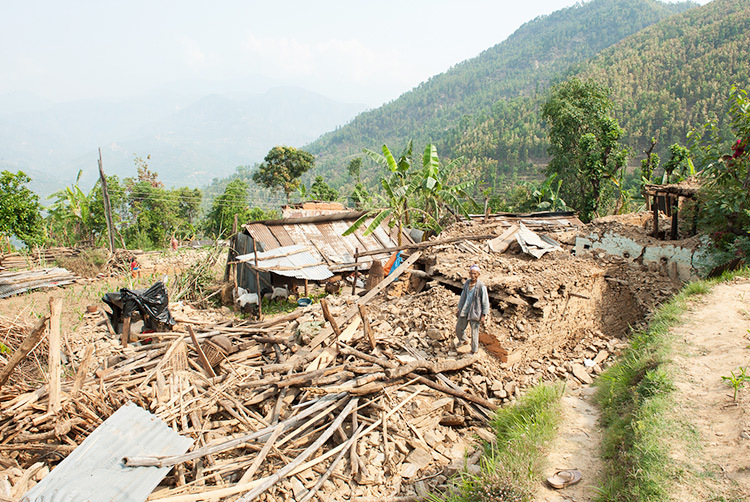 He shares about the devastation that has overtaken most parts of central and eastern Nepal and the relief work they have begun. 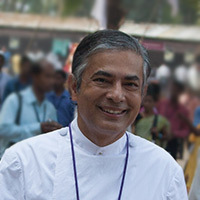 Brother K.P. 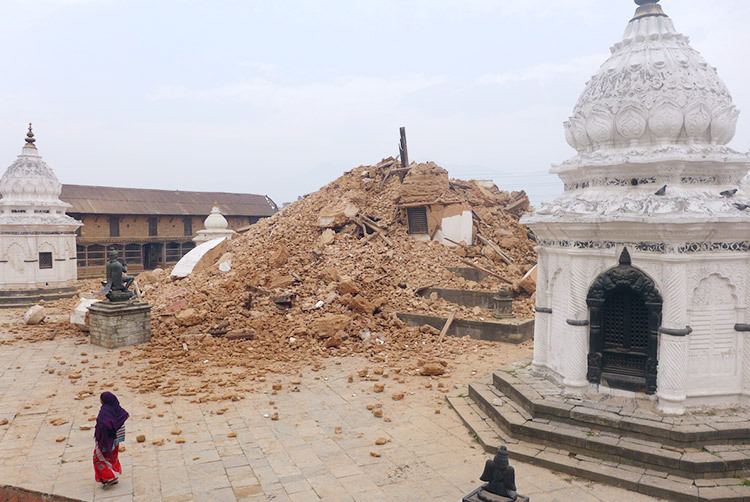 talks about the impact of the earthquake on the people of Nepal, the relief work that is happening, and how we can pray for and support those undergoing this crisis. 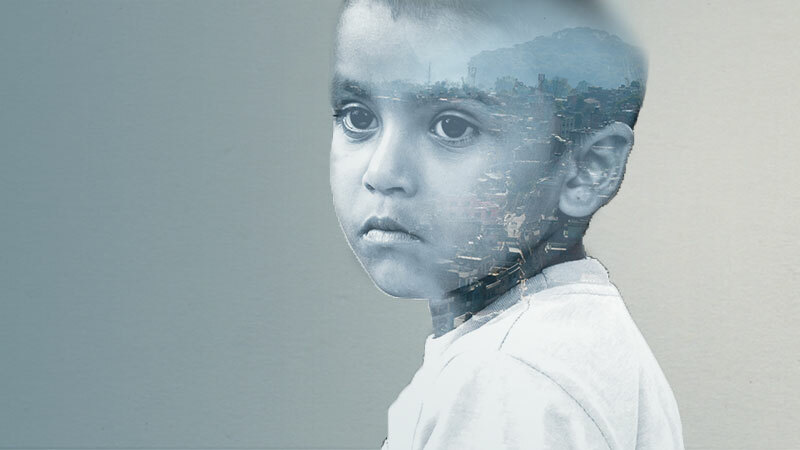 After watching, you can download the video to use in your Church Service this weekend as you pray for Nepal.